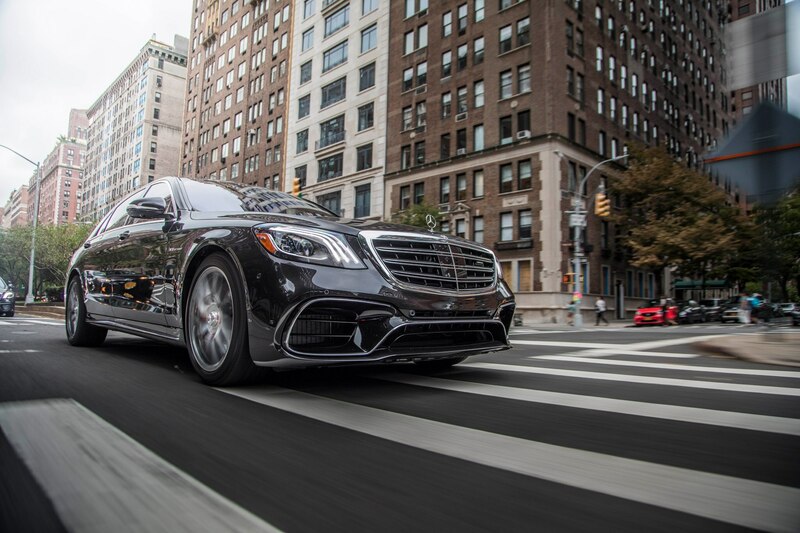 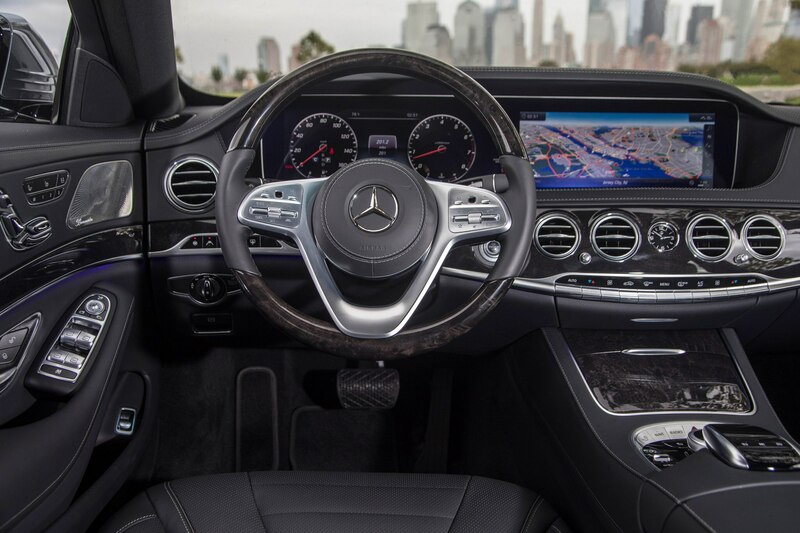 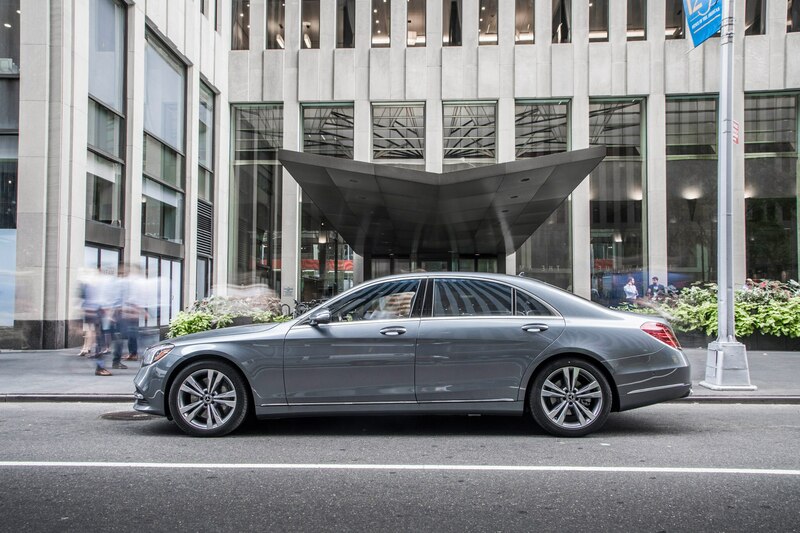 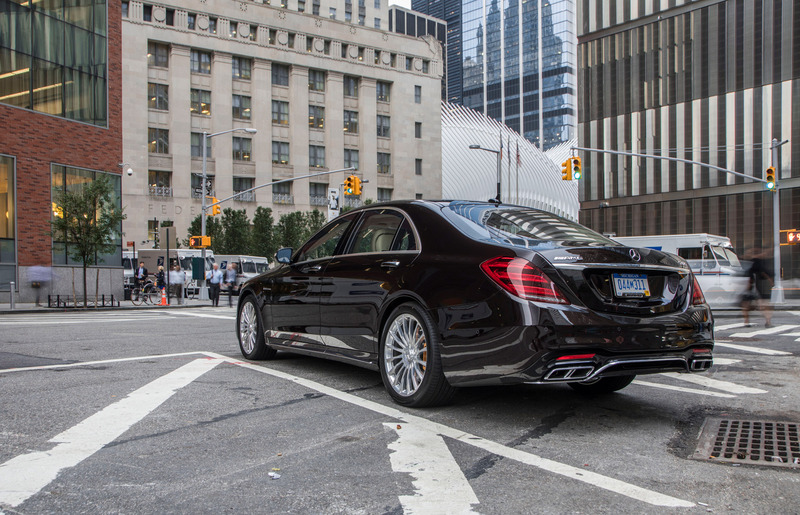 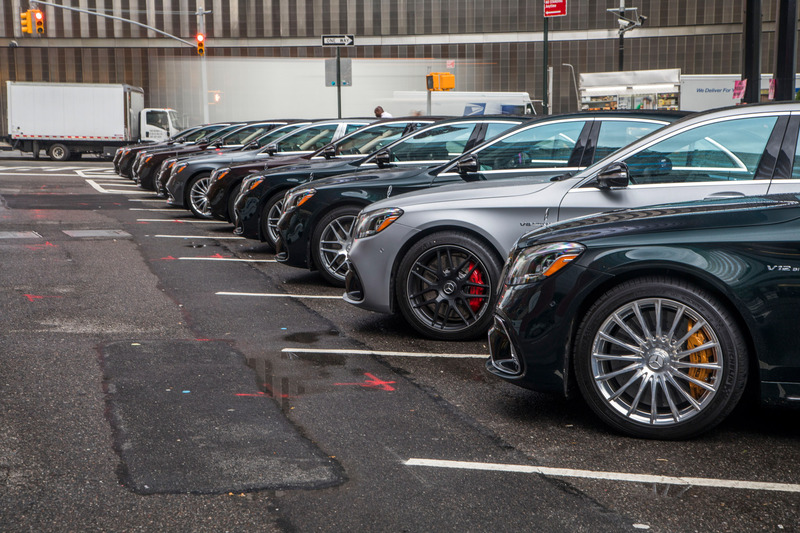 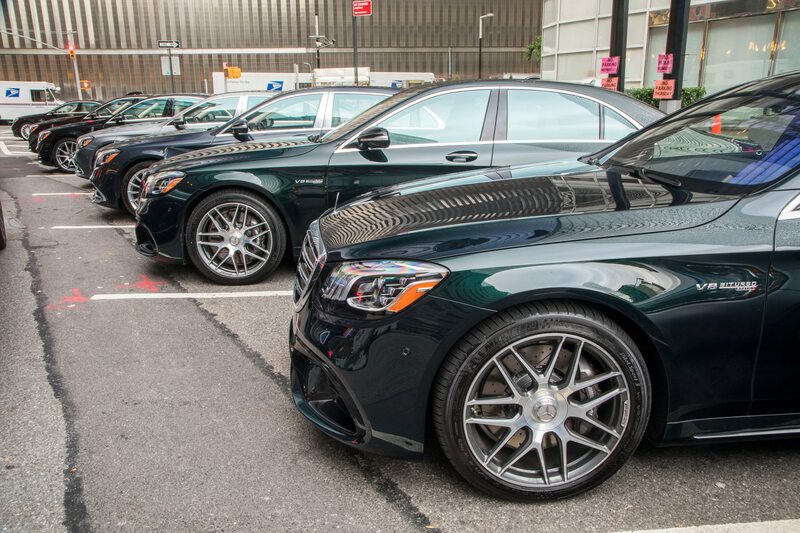 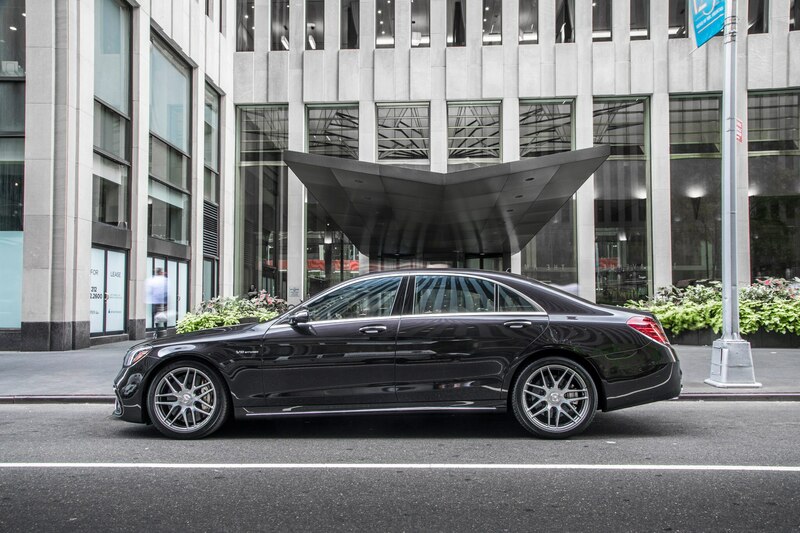 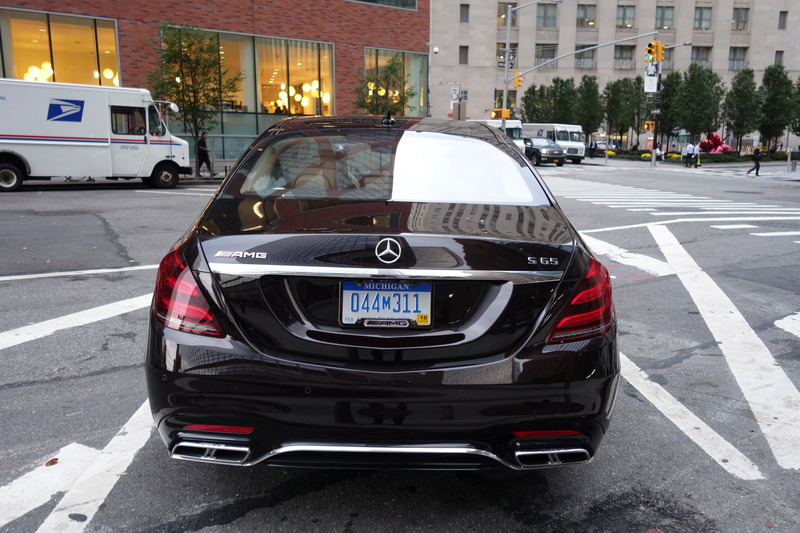 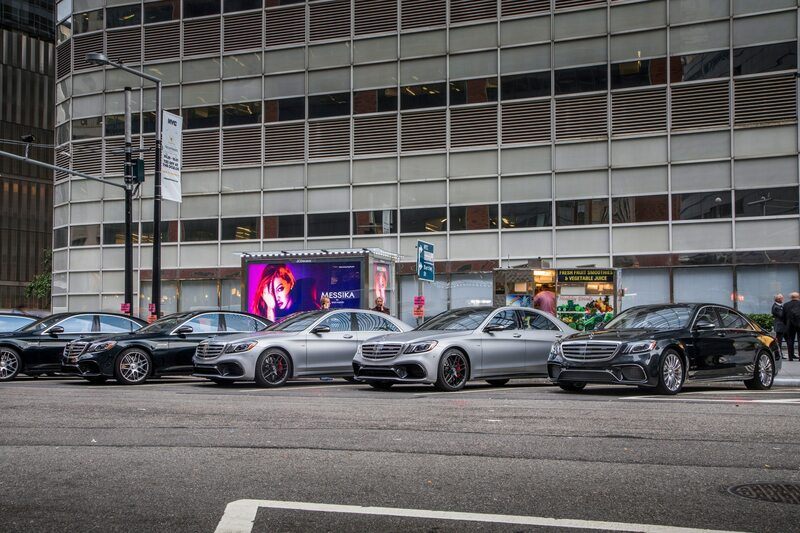 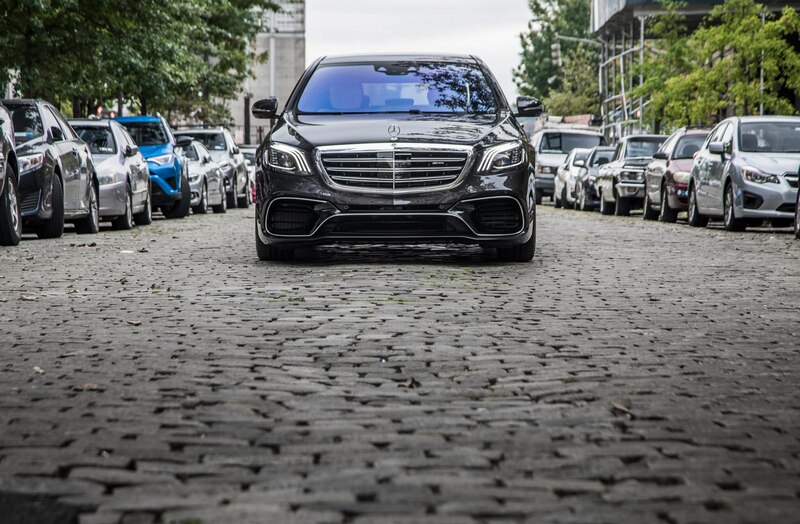 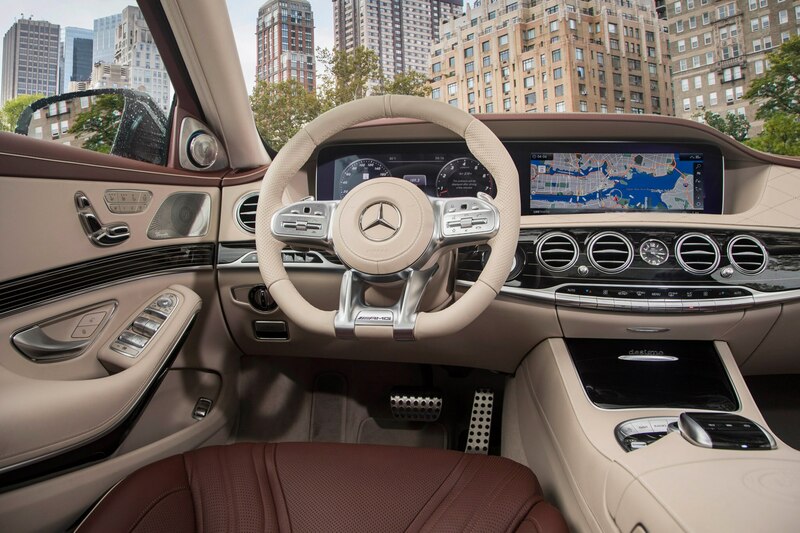 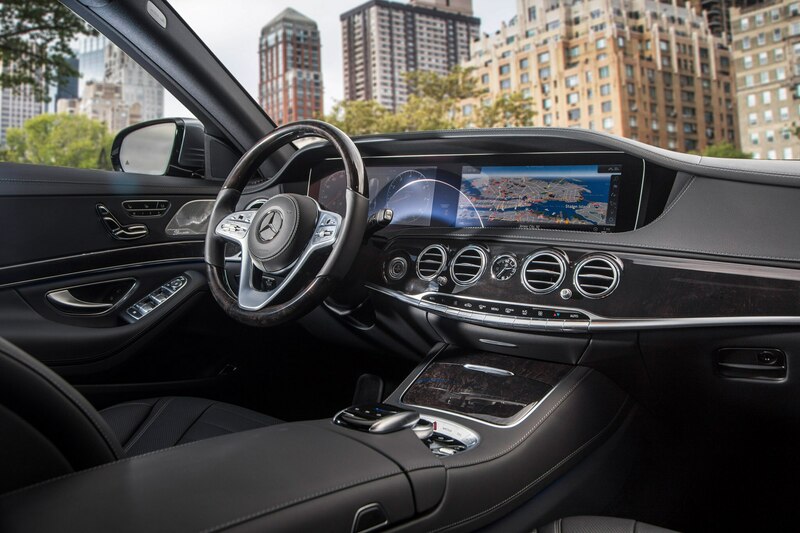 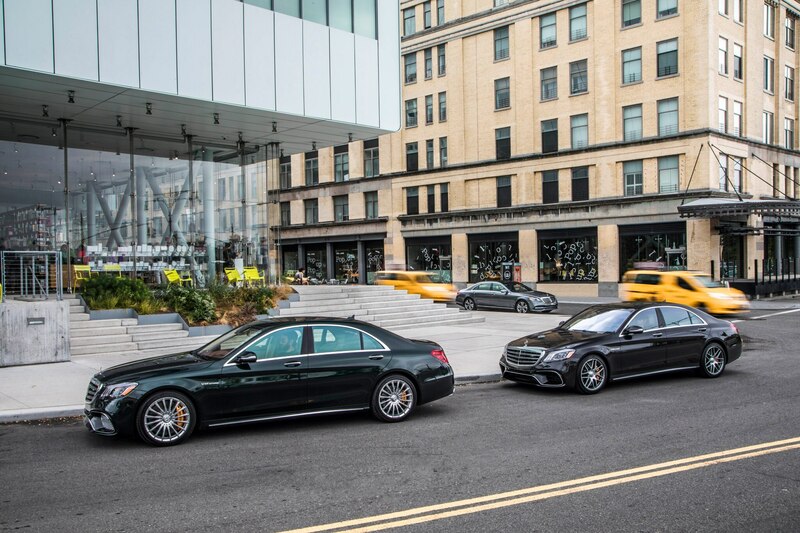 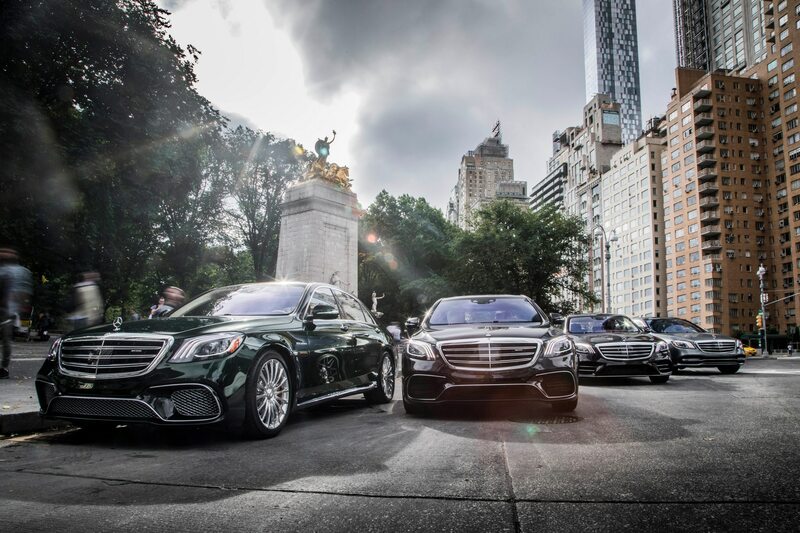 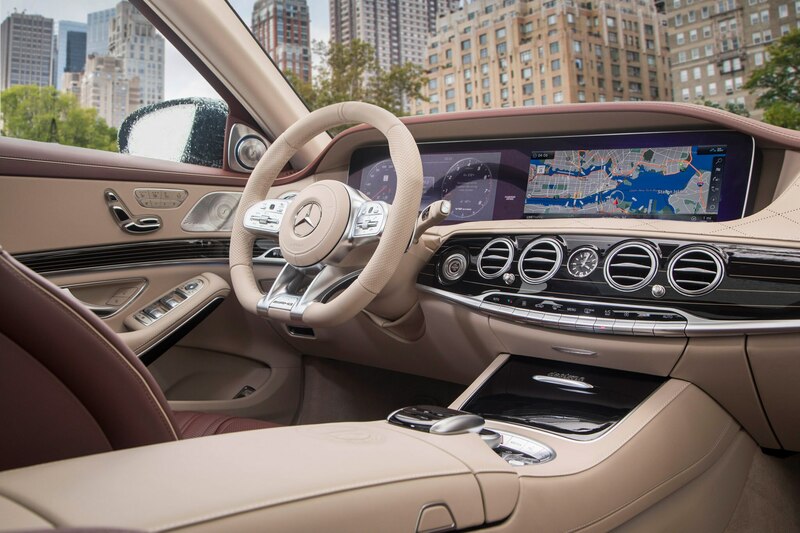 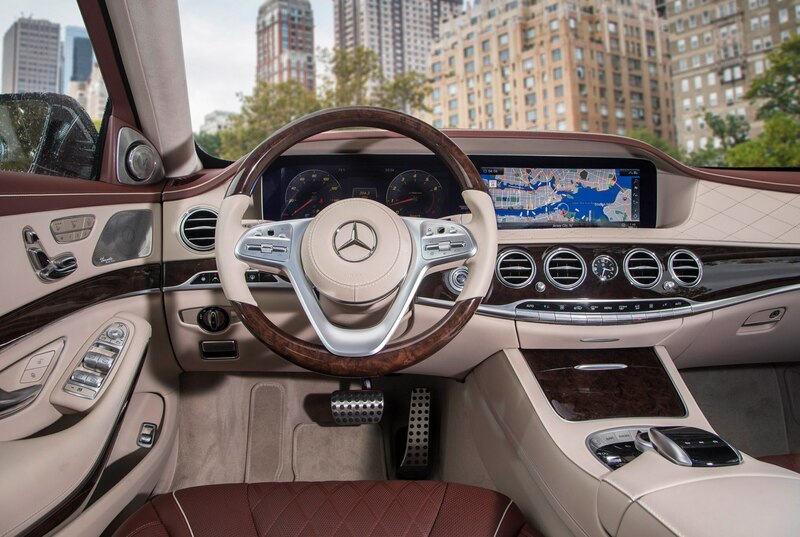 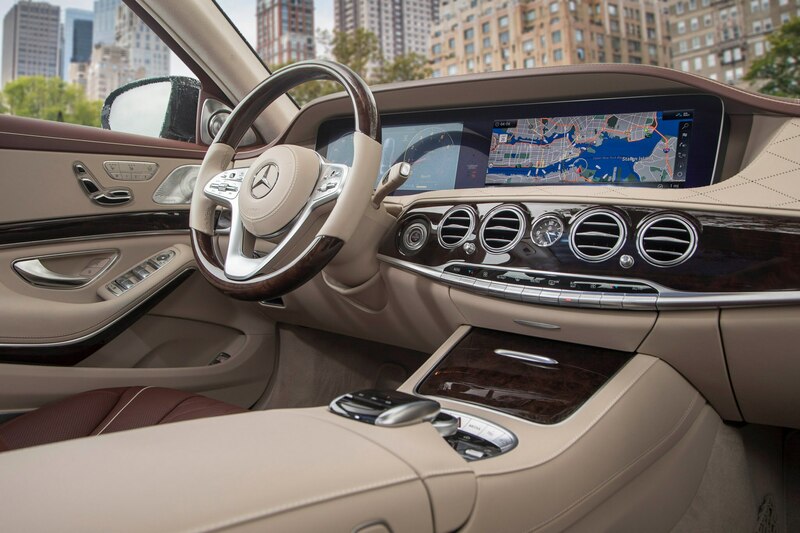 NEW YORK, New York—Sitting behind the wheel of a 2018 Mercedes-AMG S65 Sedan can make you look like a successful Wall Street commuter. 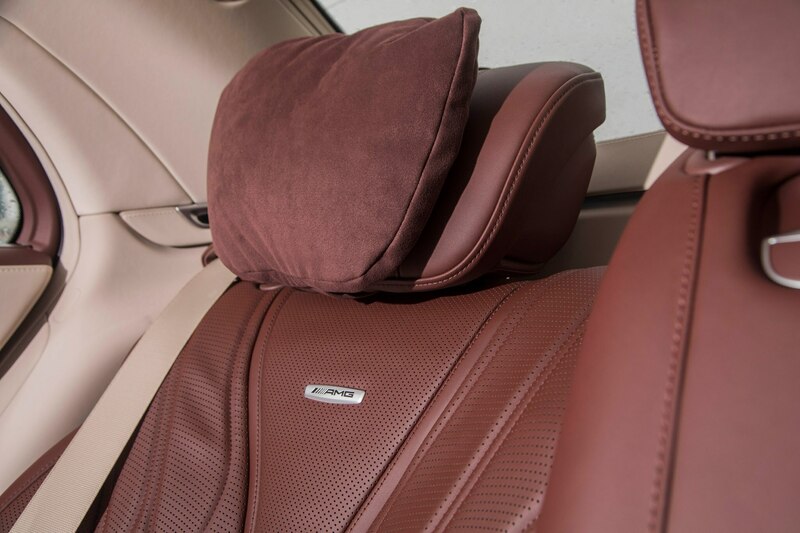 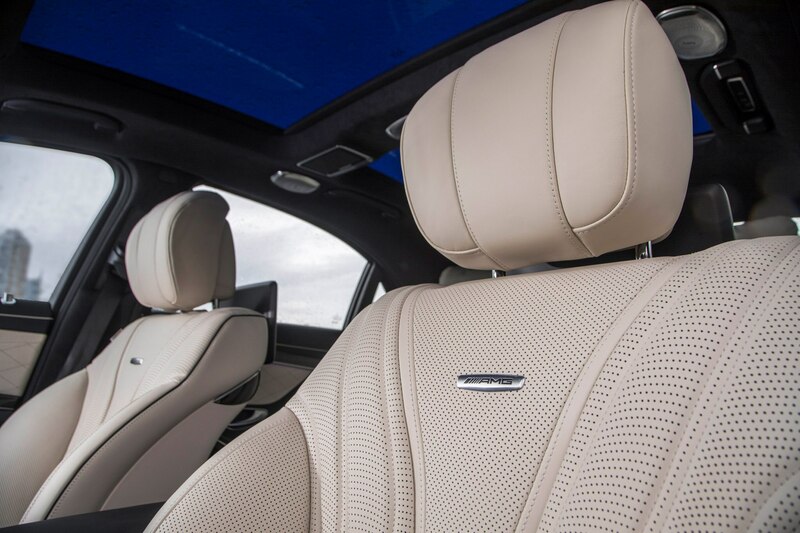 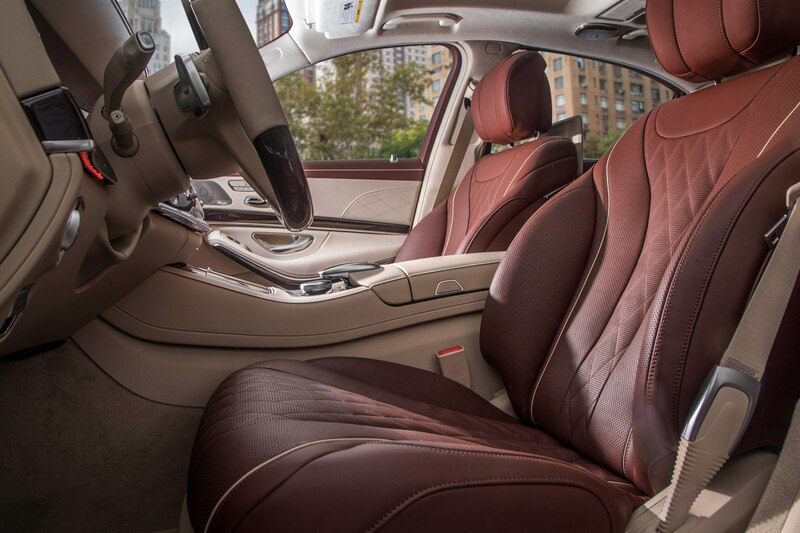 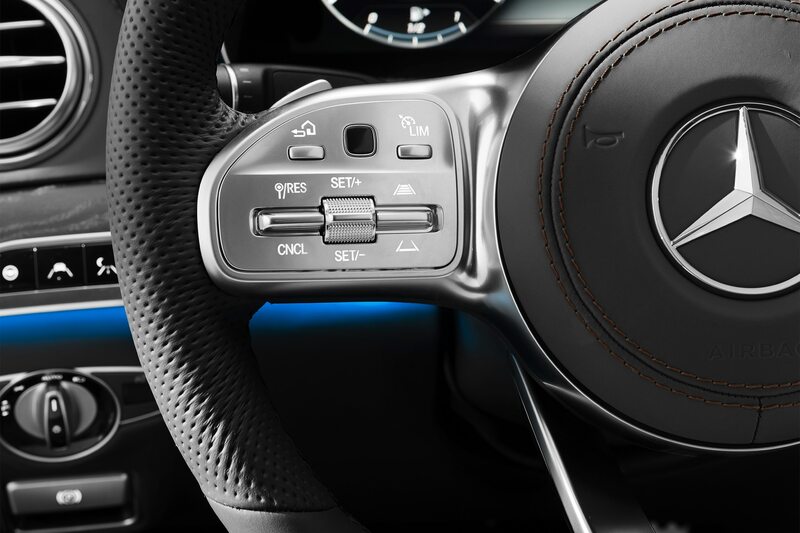 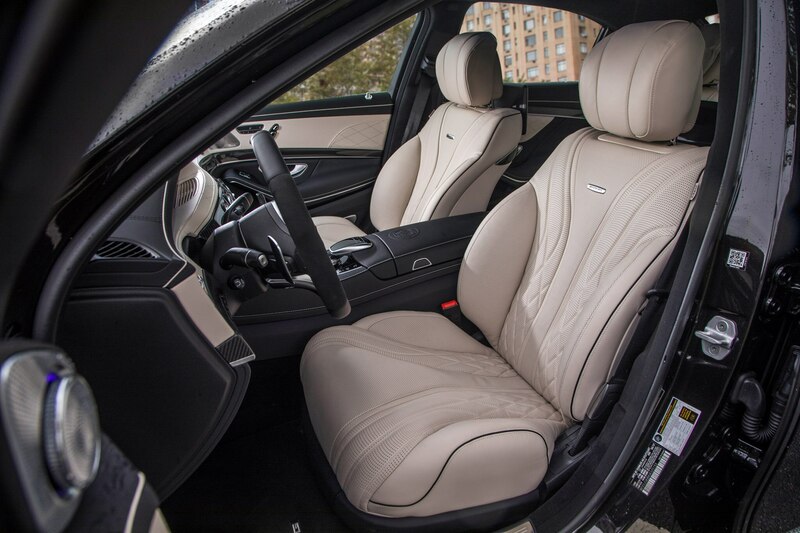 Its Nappa leather-wrapped performance steering wheel feels good, the active multicontour seats are just right, and the cushy headrest feels like a soft, warm pretzel against the back of your head. 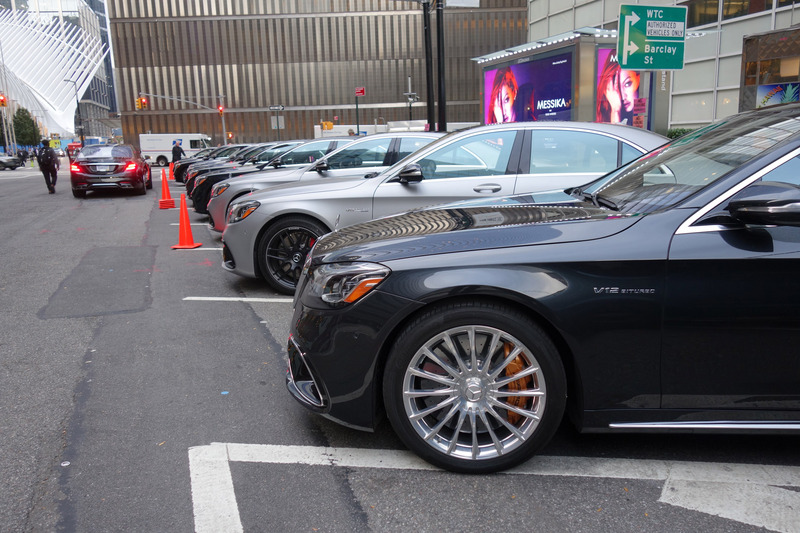 Outside on the sidewalk, a coffee cart worker from Queens is happily telling his customers the price of over a dozen S-Class models that are lined up on Barclay Street in the shadow of One World Trade Center. 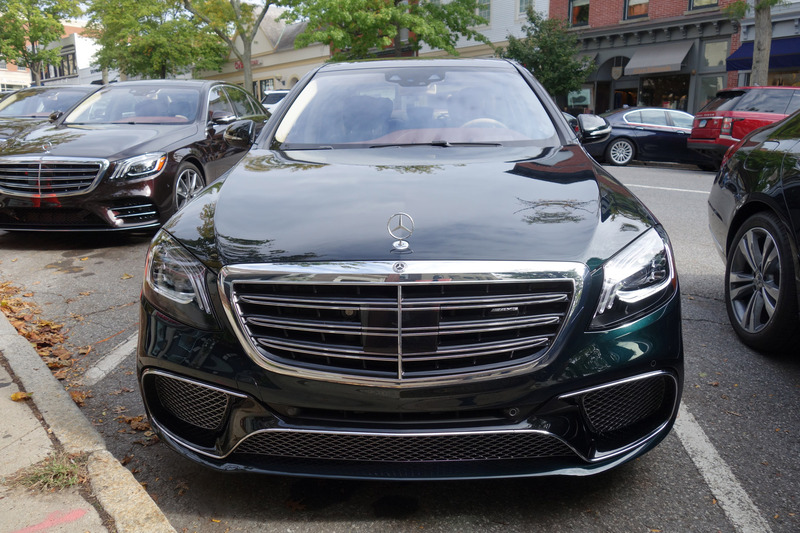 My S65 tester is painted in a beautiful shade of Emerald Green Metallic and has a base price of $230,495. 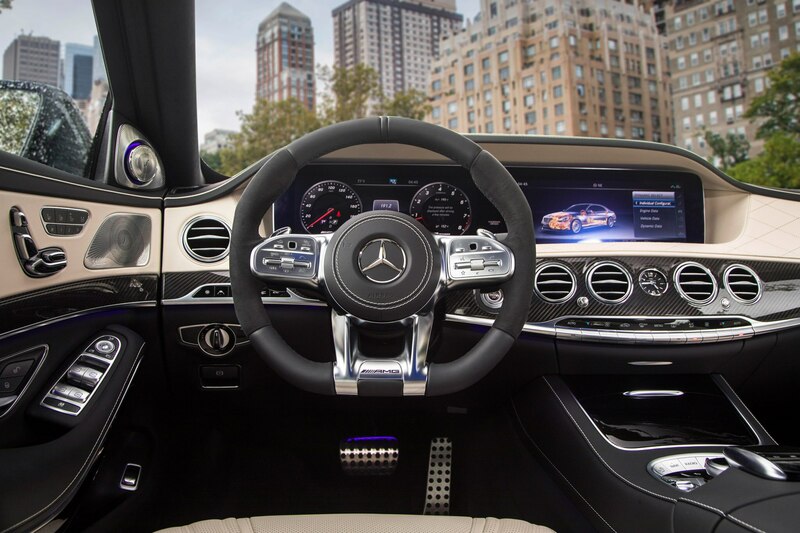 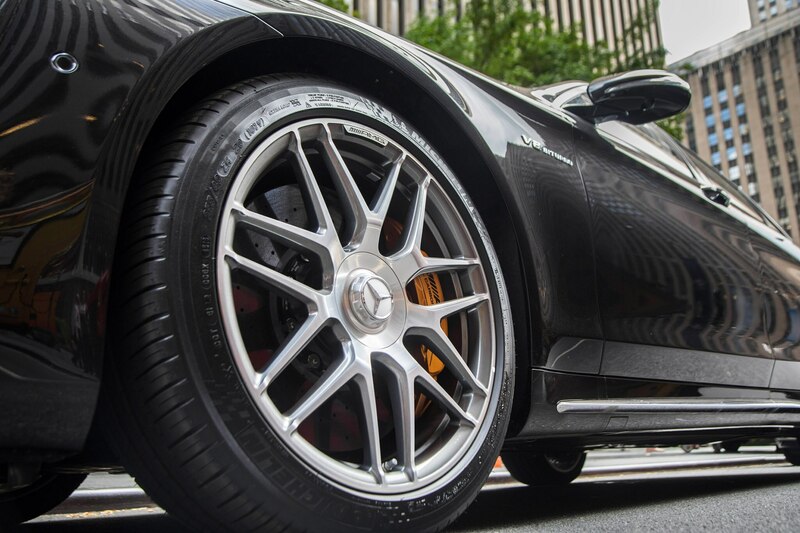 I tell the coffee and donut slinger it’s equipped with an optional AMG carbon brake system and a heated windshield that pushes the price tag up to $241,295—or about the price of a one-bedroom condo in Flushing Meadows. 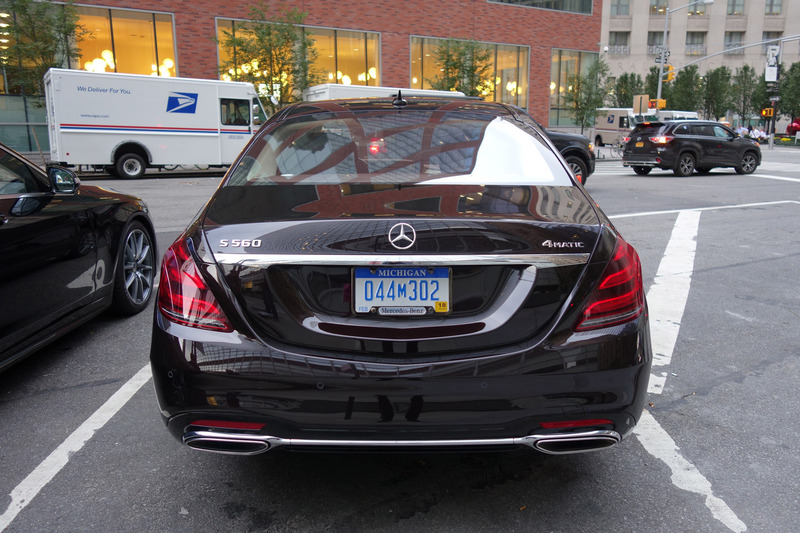 He gives me a thumb up as the S65 rolls into bumper-to-bumper traffic towards the West Side Highway. 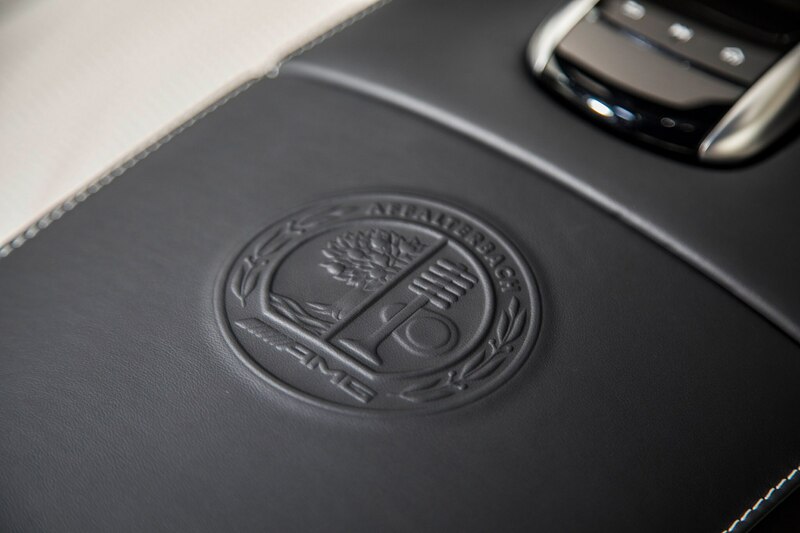 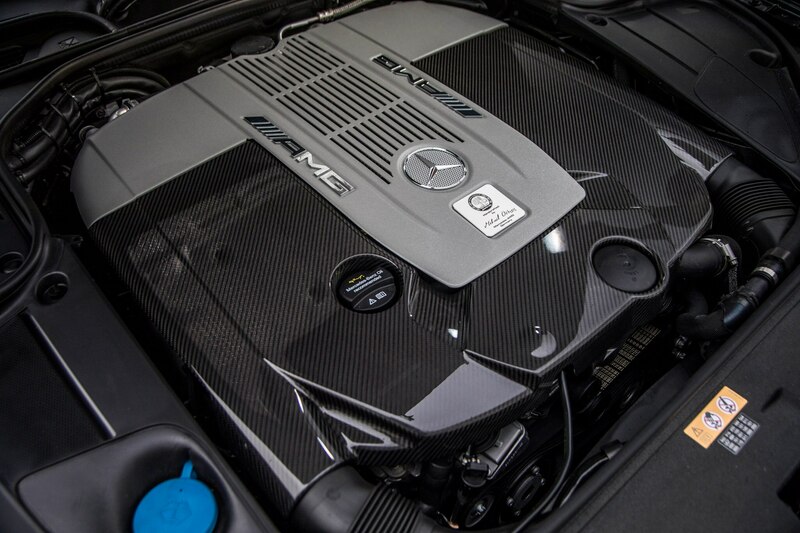 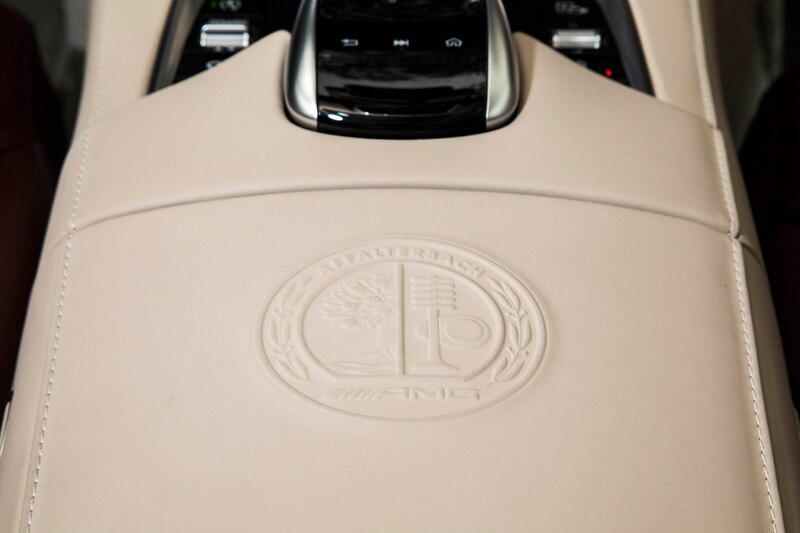 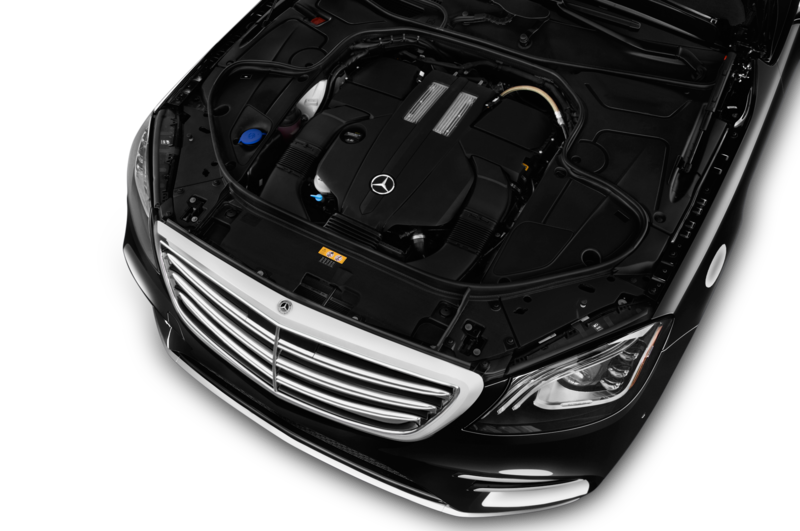 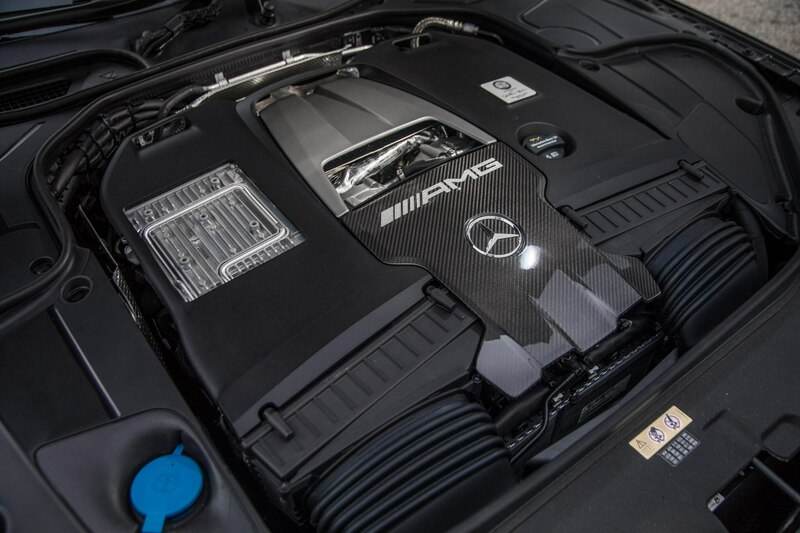 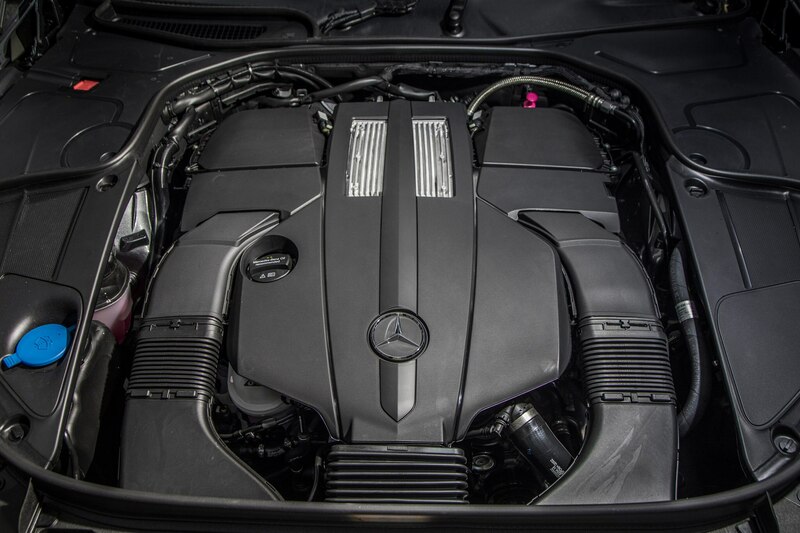 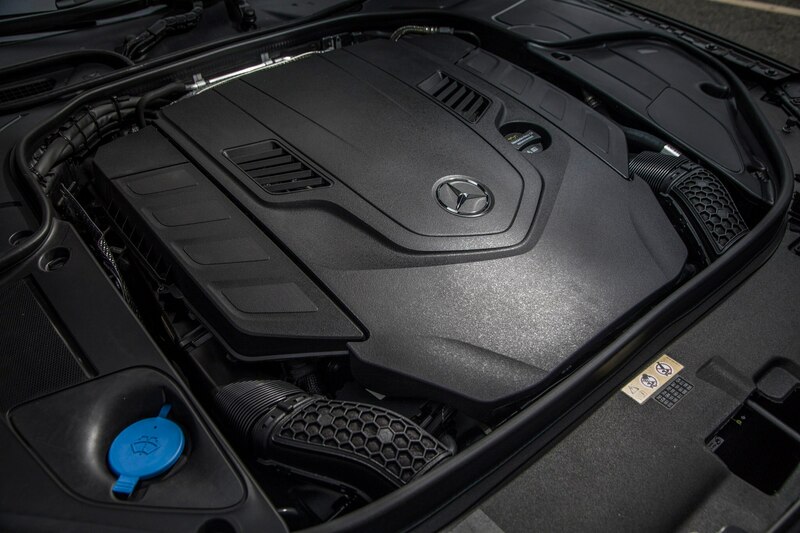 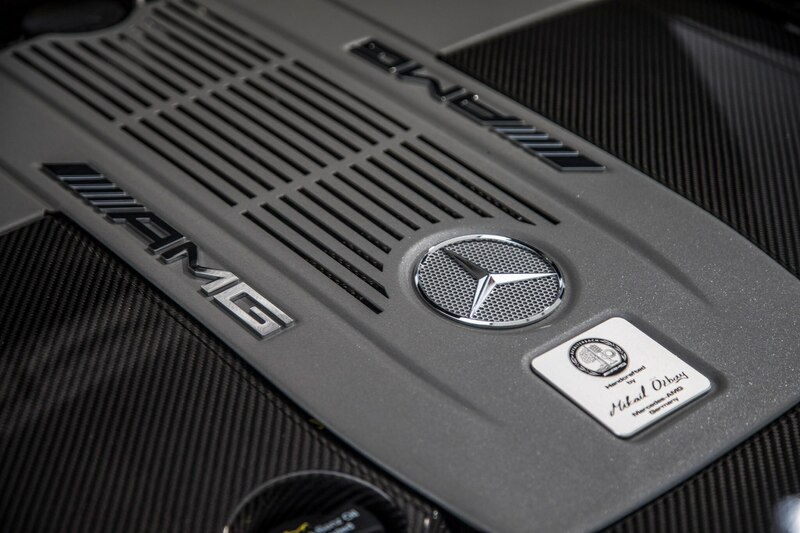 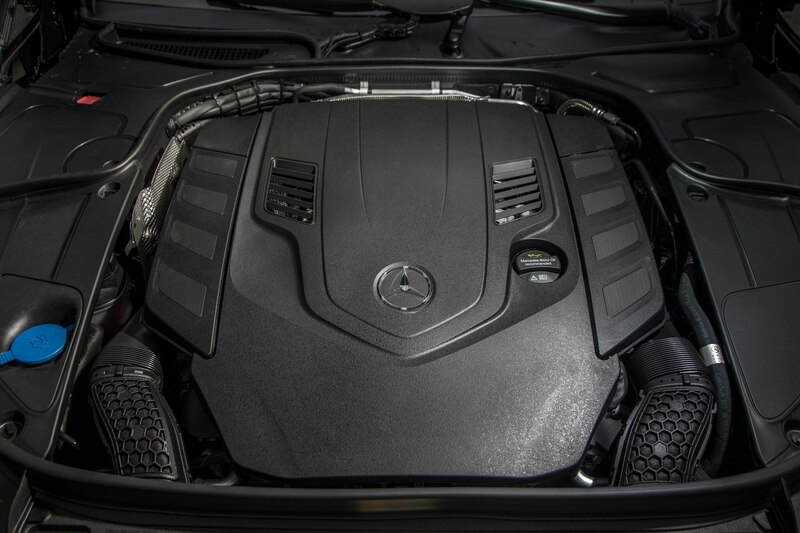 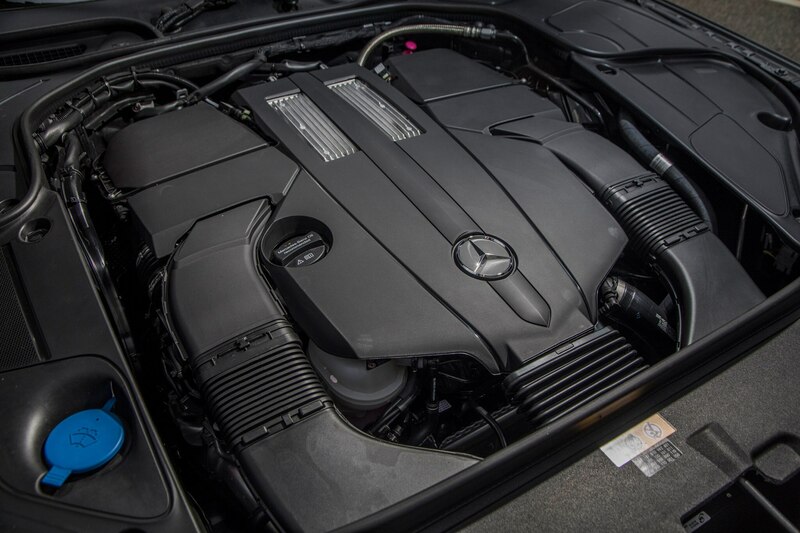 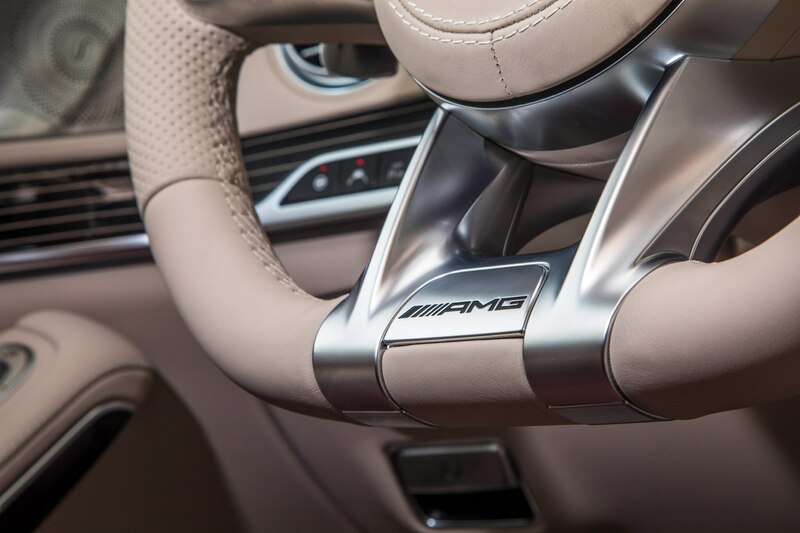 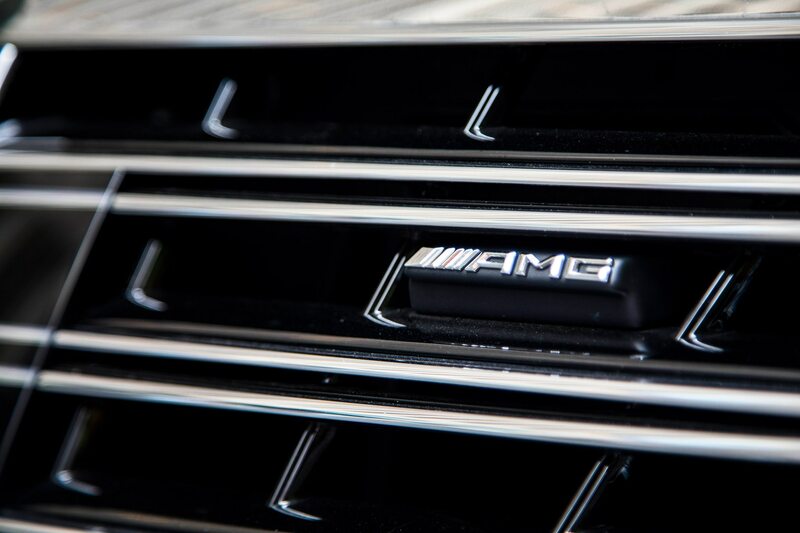 Under the hood, the S65 packs a handcrafted AMG 6.0-liter twin turbo V-12 engine with 621 horsepower and 738 lb-ft of torque to the rear wheels via a seven-speed automatic transmission. 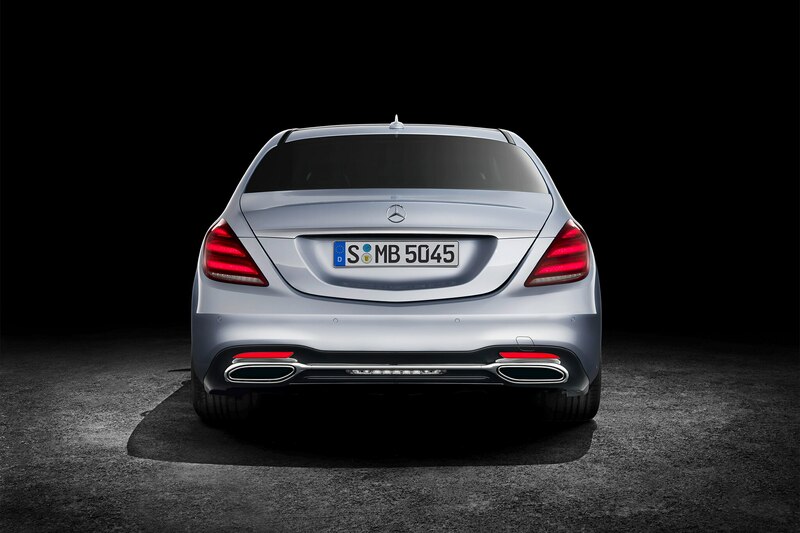 It can comfortably scoot from 0-60 mph in 4.1 seconds. 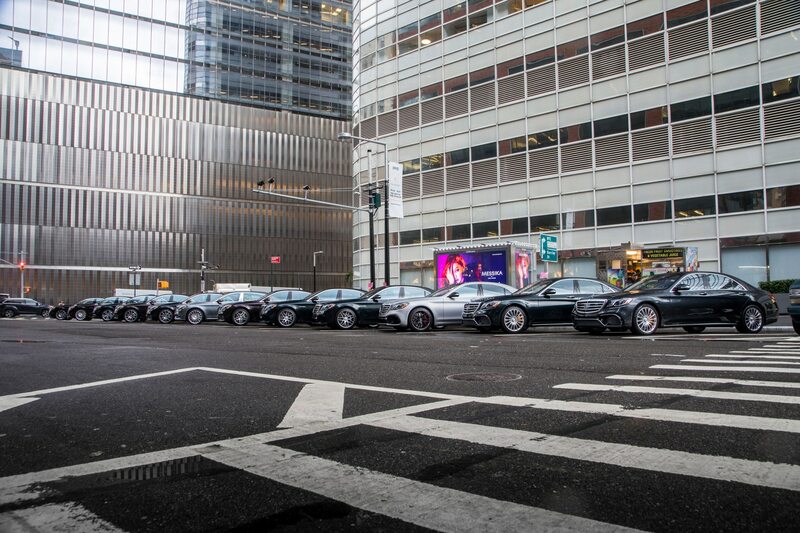 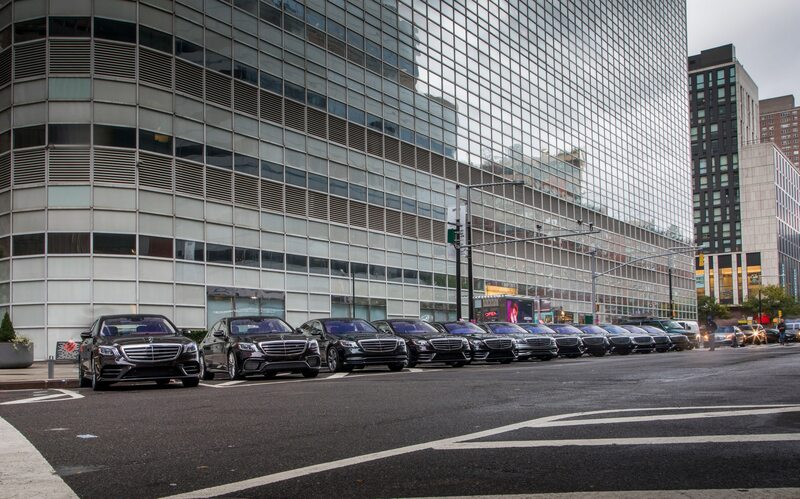 That’s more than enough to take on the quickest taxis this side of the Hudson River. 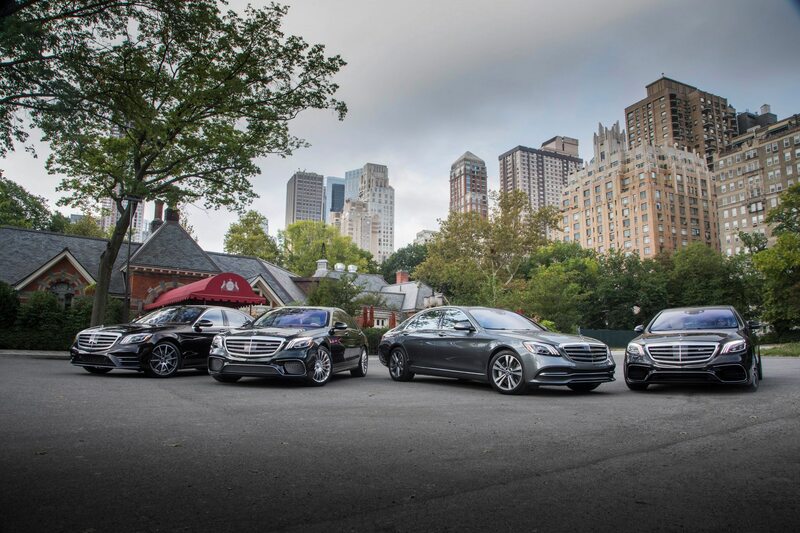 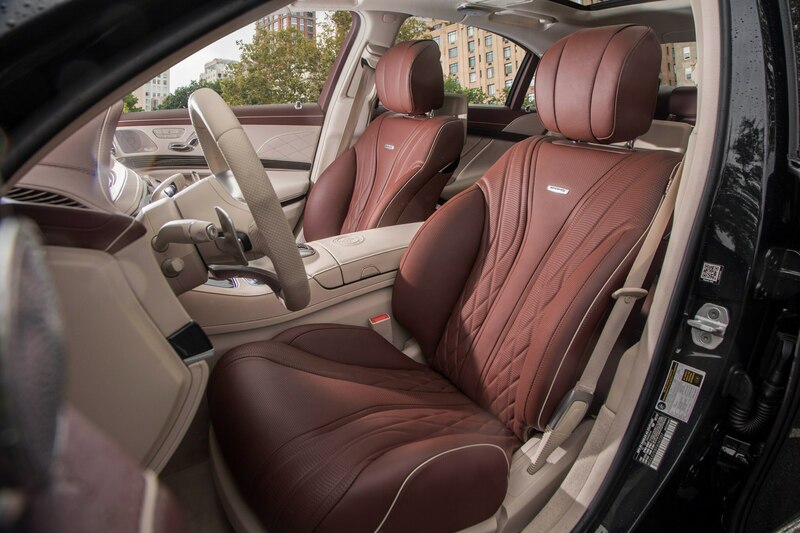 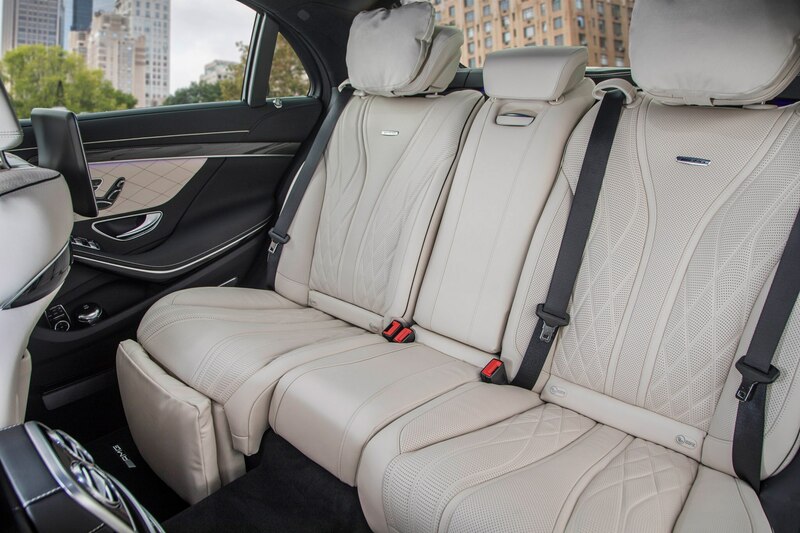 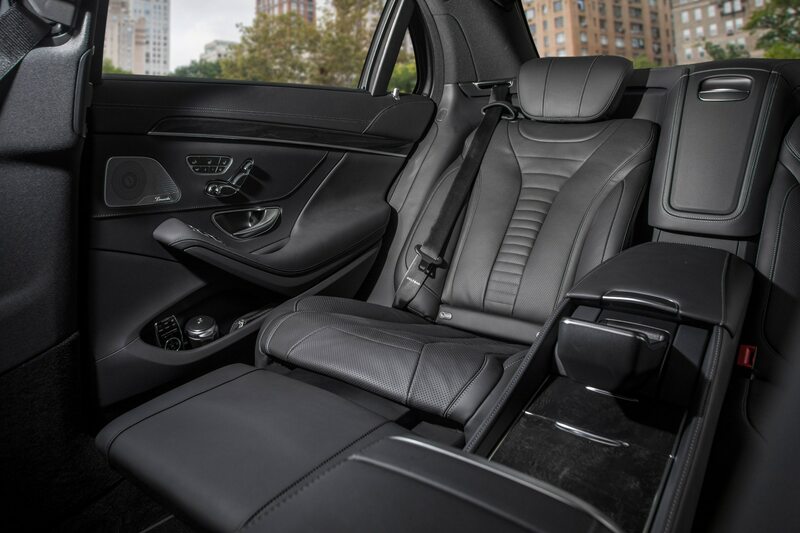 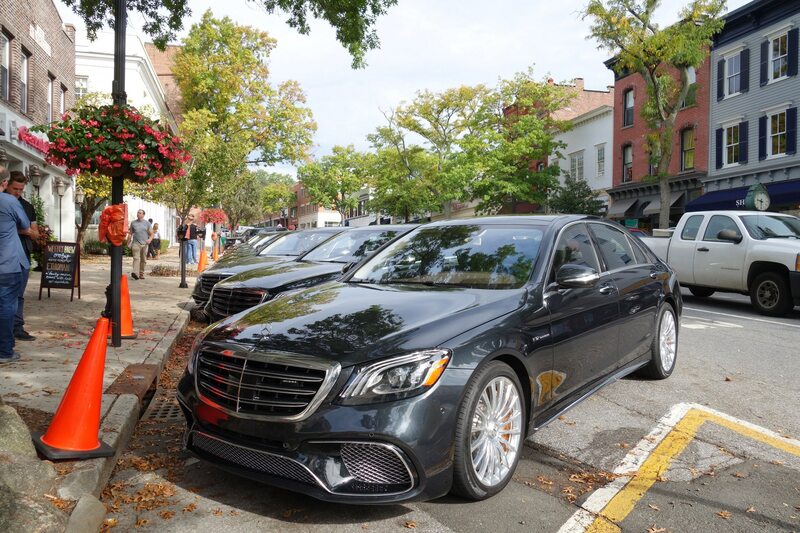 Later, I get the opportunity to drive a 2018 Mercedes-Benz S560 4MATIC Sedan and a sportier 2018 Mercedes-AMG S63 for similar spins around the Tri-State area, which include rides through Manhattan and the Bronx, Western Connecticut, the New Jersey Palisades, and the cobblestoned streets of Hoboken. 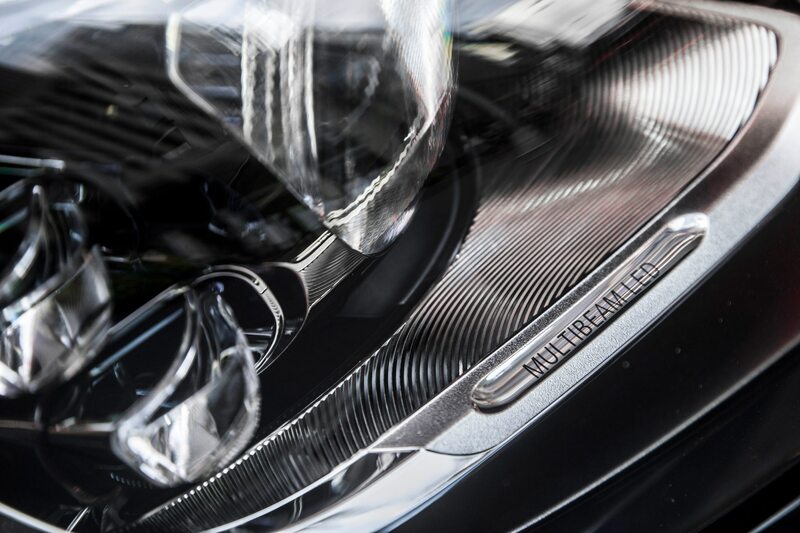 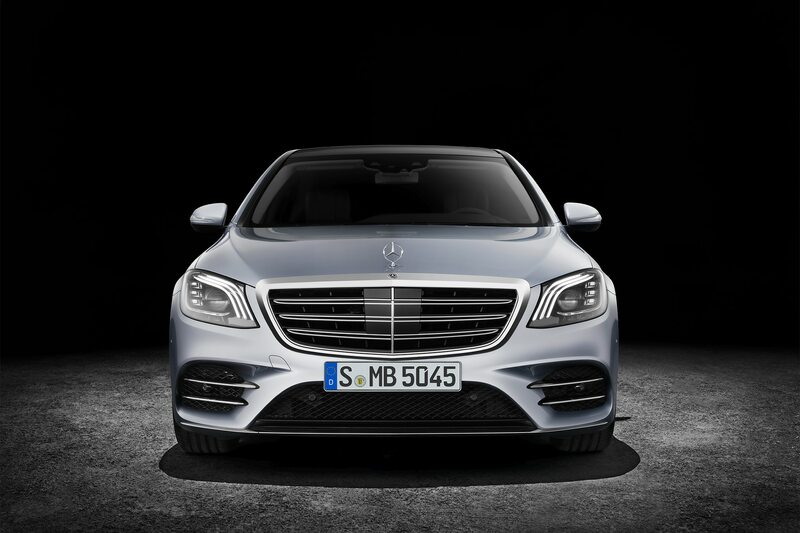 According to Mercedes brass, 6,500 parts have been updated for the new S-Class facelift and we are reminded that the engine counts as only one part. 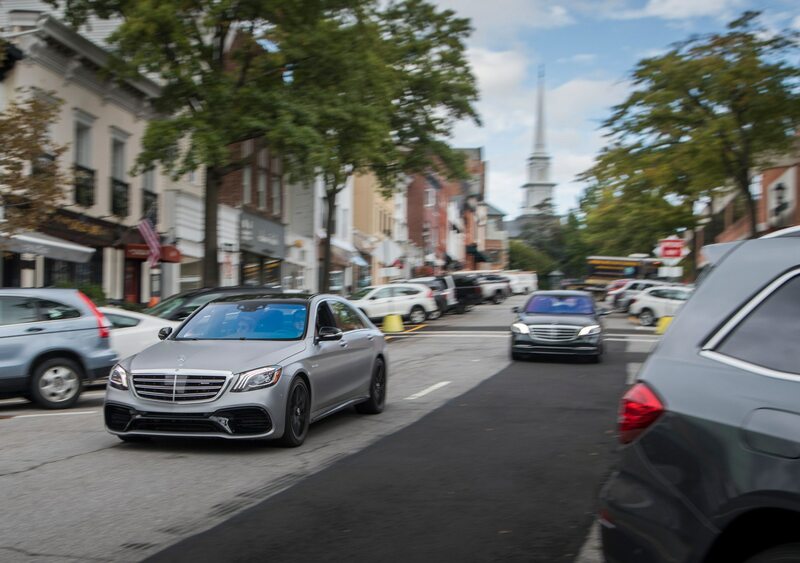 It’s a lot you can’t see but basically for 2018, the AMGs get more sinister-looking bumpers, the S63 has a dual mesh grille, the S65 sports a chrome one, Distronic functions are now controlled on the left side of the steering wheel, and there are 64 ambient lighting interior color choices to consider (just like a Crayola Crayon box or an illuminated disco dance floor). 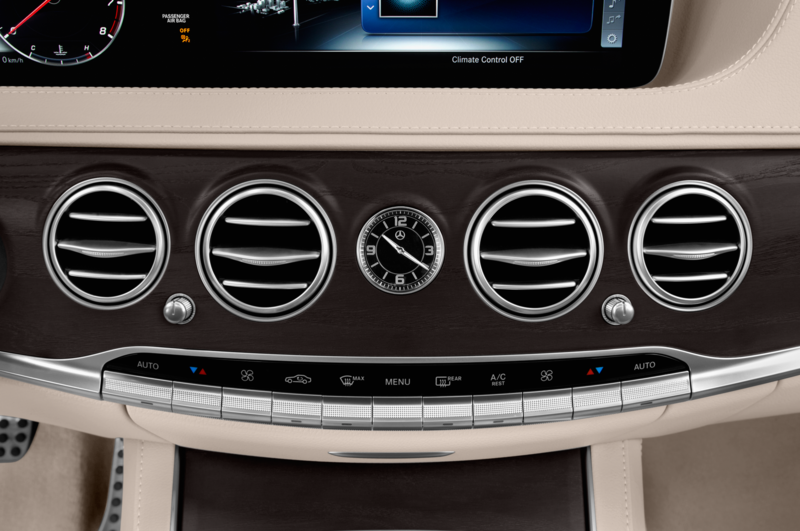 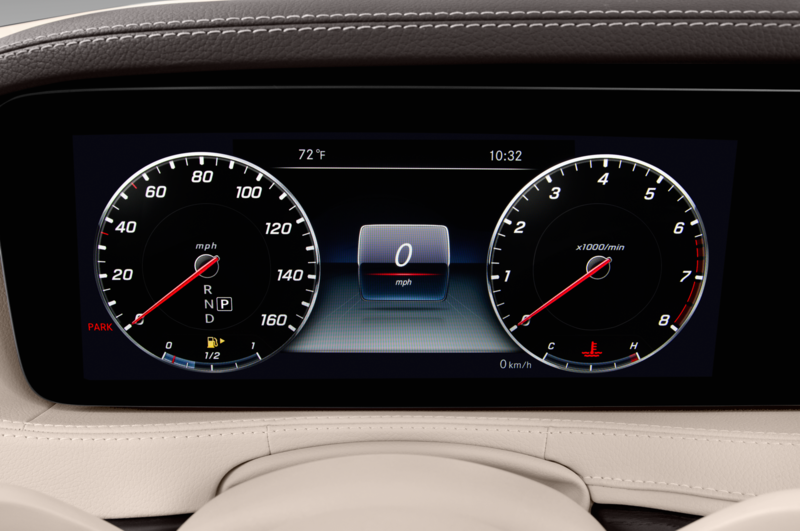 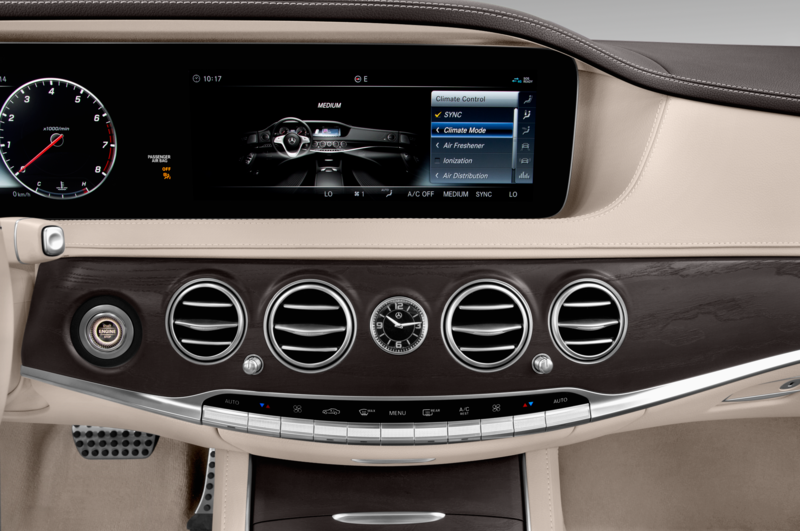 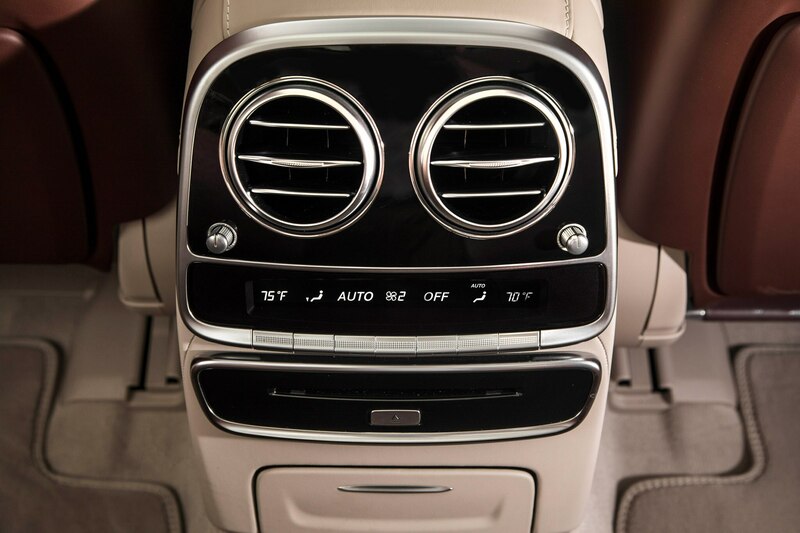 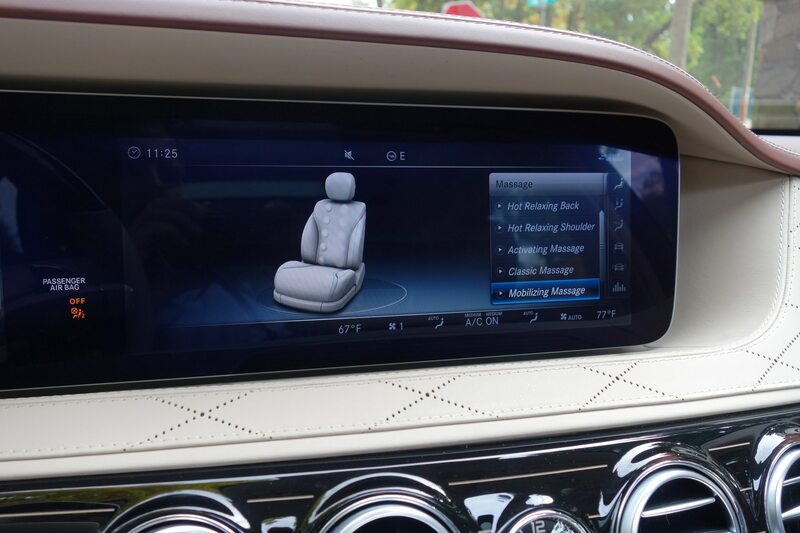 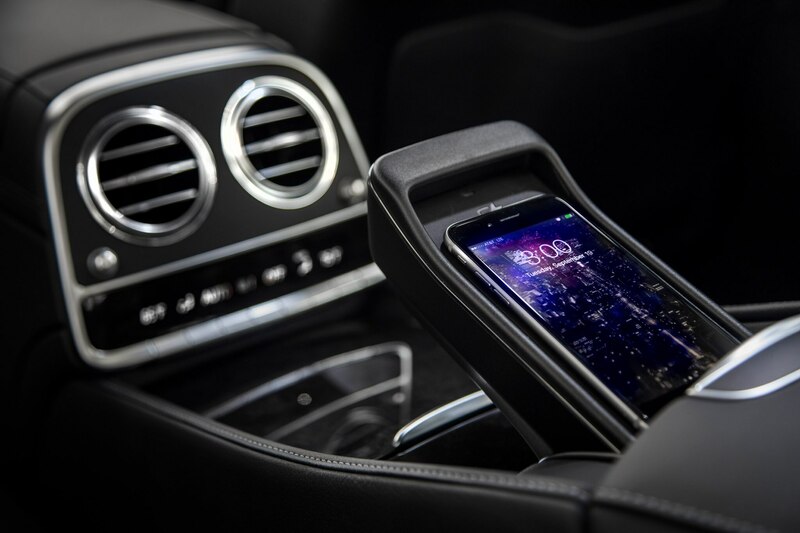 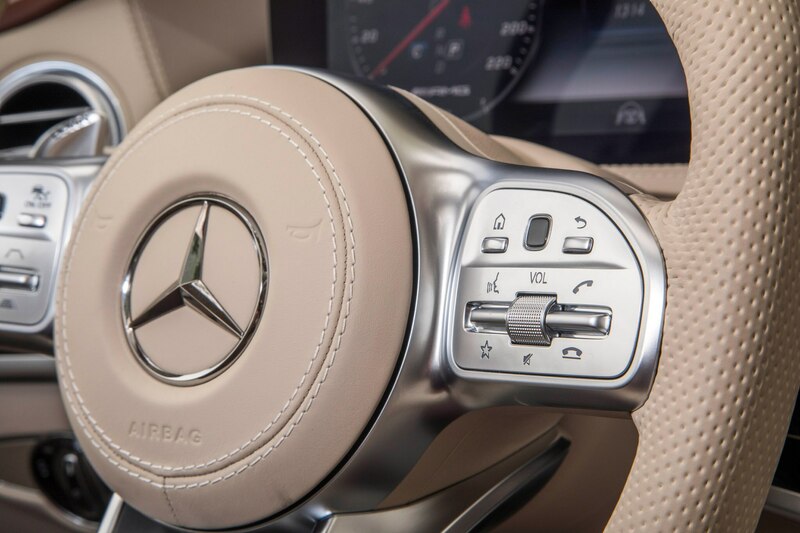 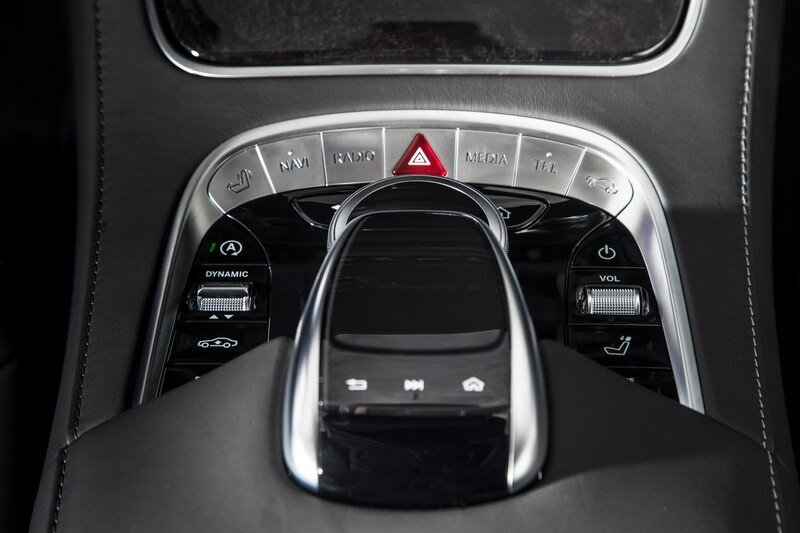 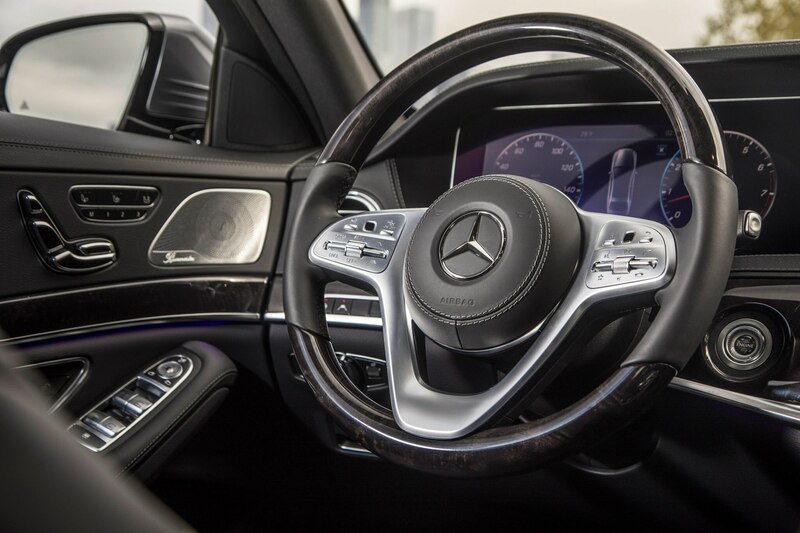 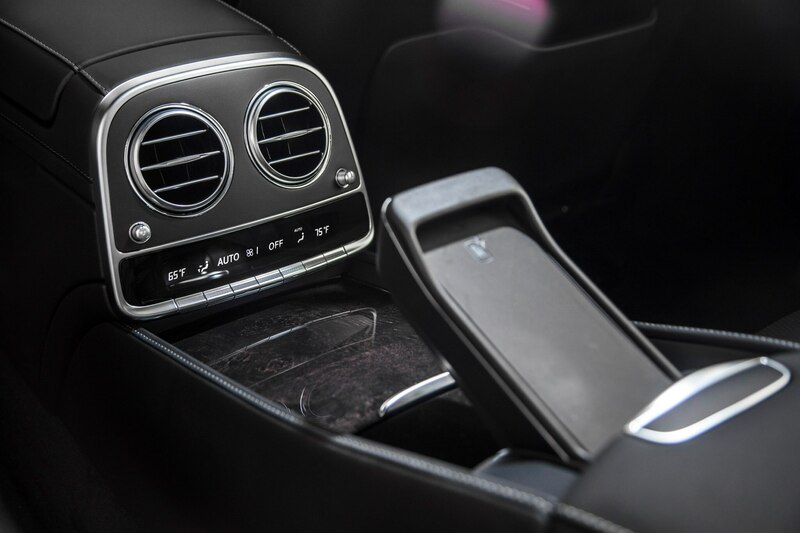 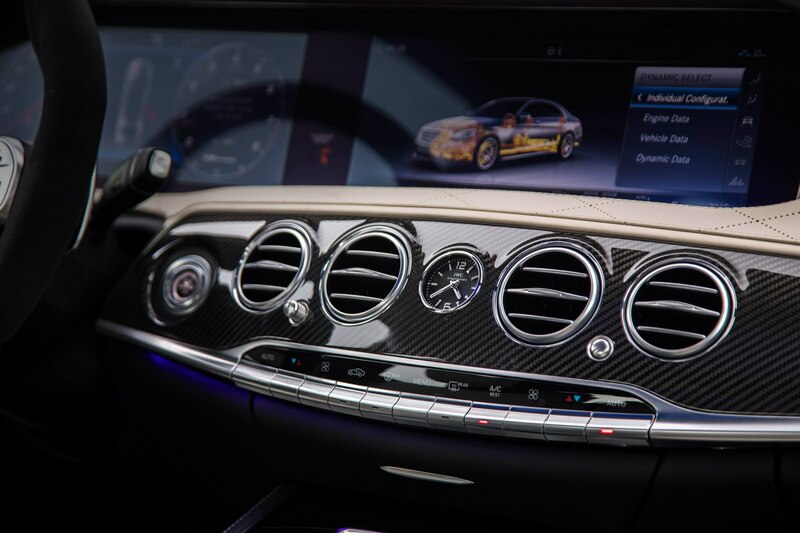 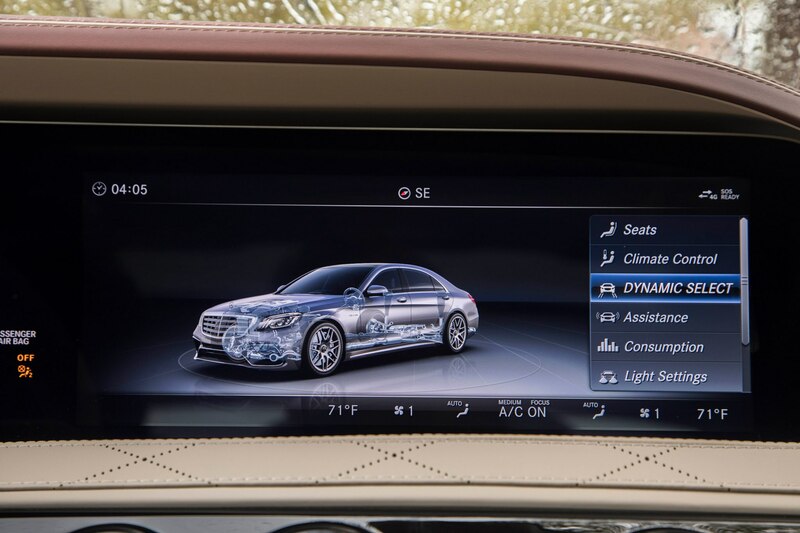 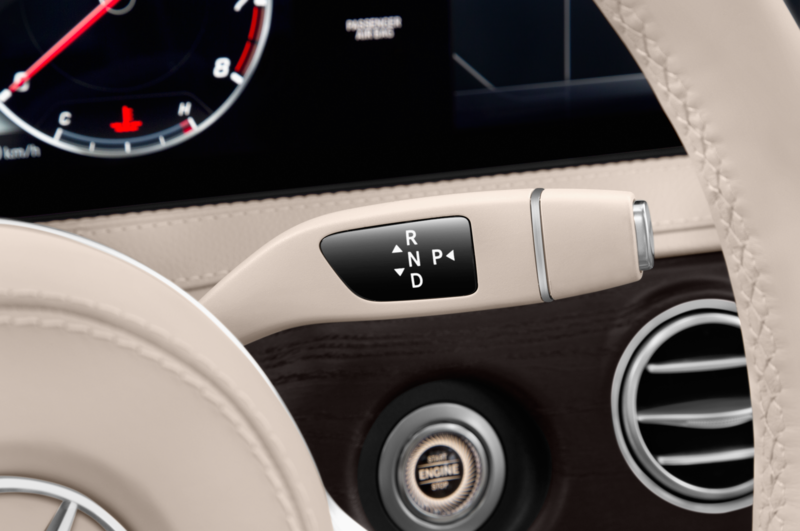 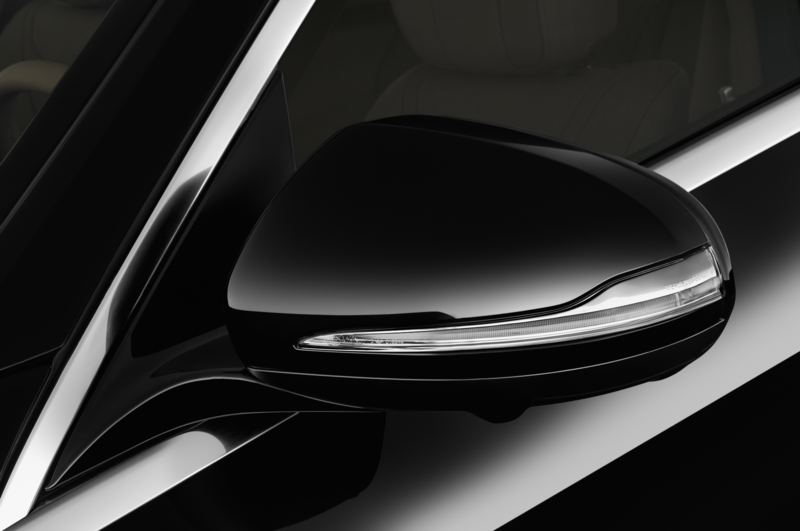 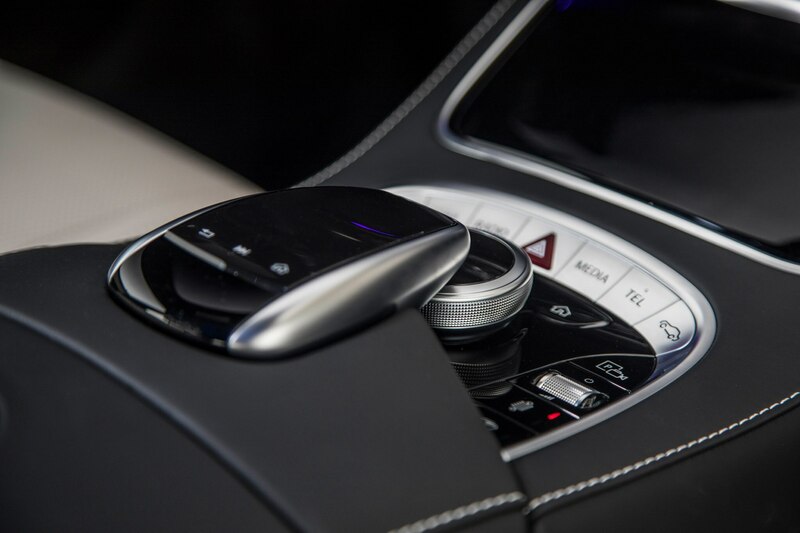 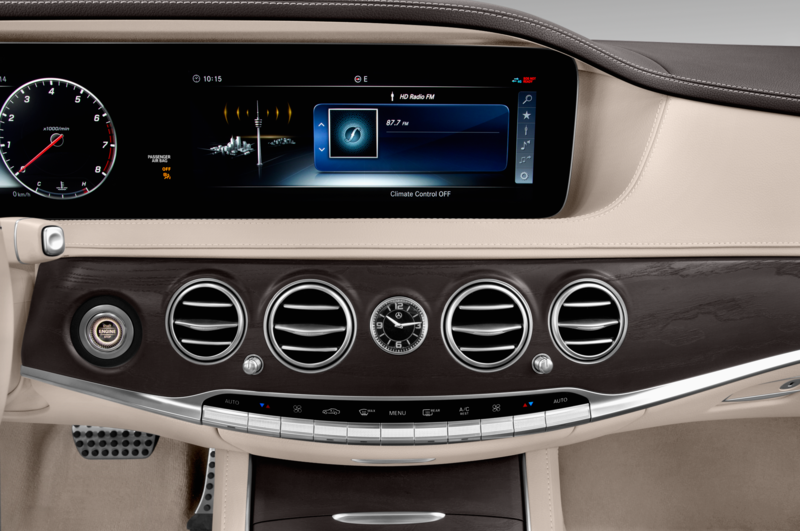 Control and display screens are now under a shared glass cover that forms a widescreen cockpit and all S-Class models are now Android Auto and Apple Play friendly. 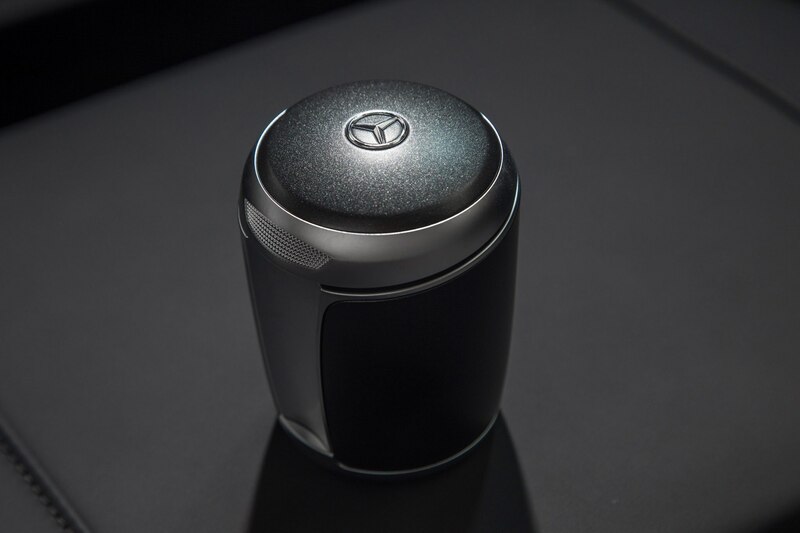 There’s also a silly type of scratch and sniff aromatherapy tech going on called the “Air Balance Cabin Fragrance System,” which is part of the optional energizing comfort control that pipes in scents and ionizes the cockpit air as you cruise. 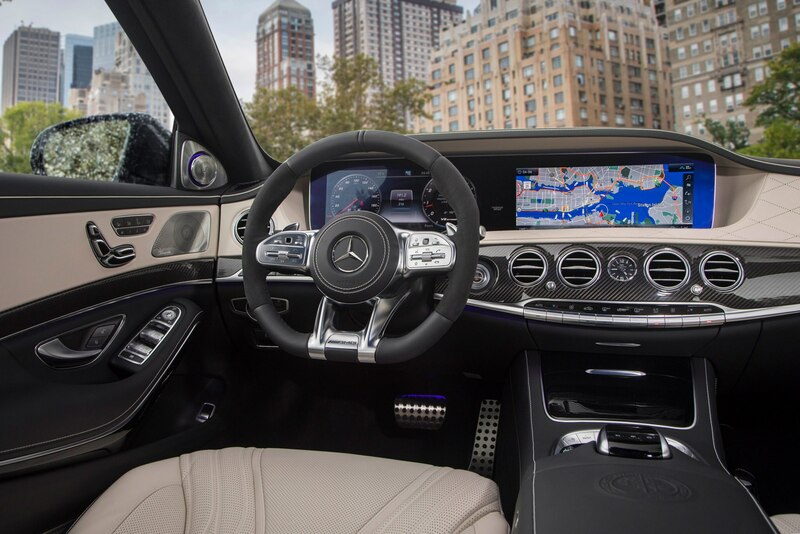 Without enough time to figure out how to disable the fragrancing function, which apparently you can, I drove with the windows and epic panorama roof open—score one for Mother Nature. 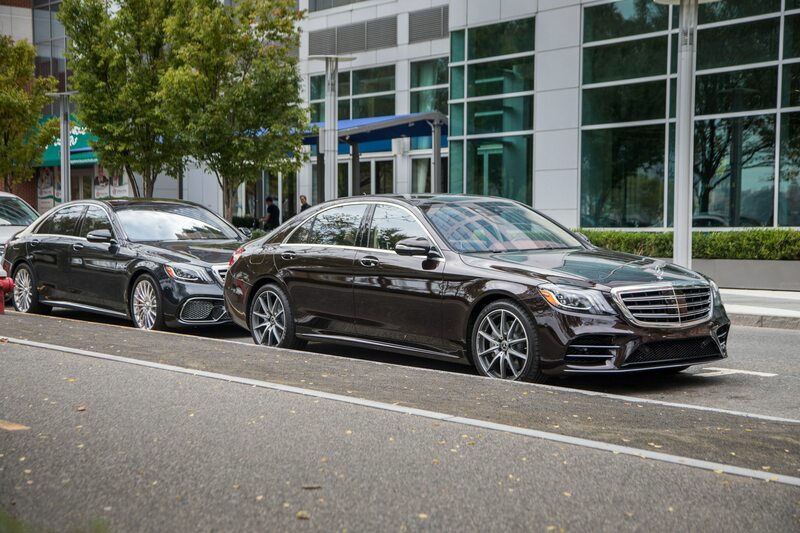 Having driven all three of the S-Class variants back to back, if I had to choose between the Mercedes-AMG S63/S65 and/or a Mercedes-Benz S560 4MATIC sedan, I’d really have to recommend the S560. 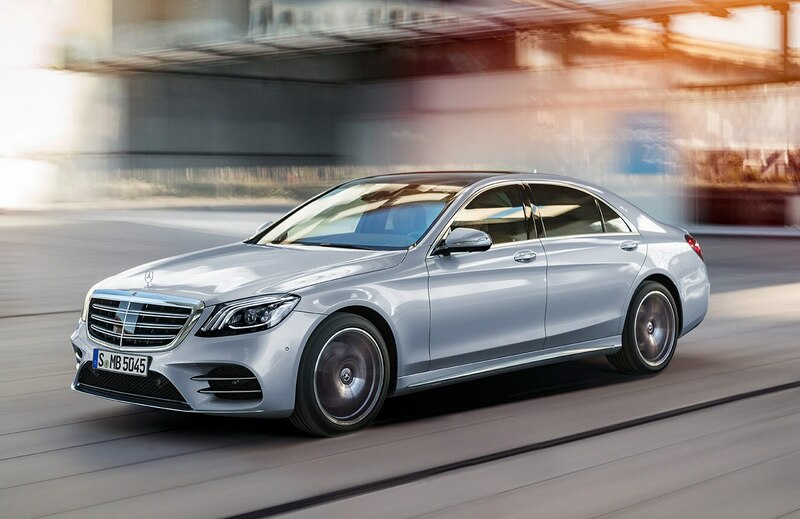 Not because it’s nearly half the price of a fully loaded S65 or S63, but because it offers a more satisfying motoring experience for everyday driving despite having fewer horses under the hood. 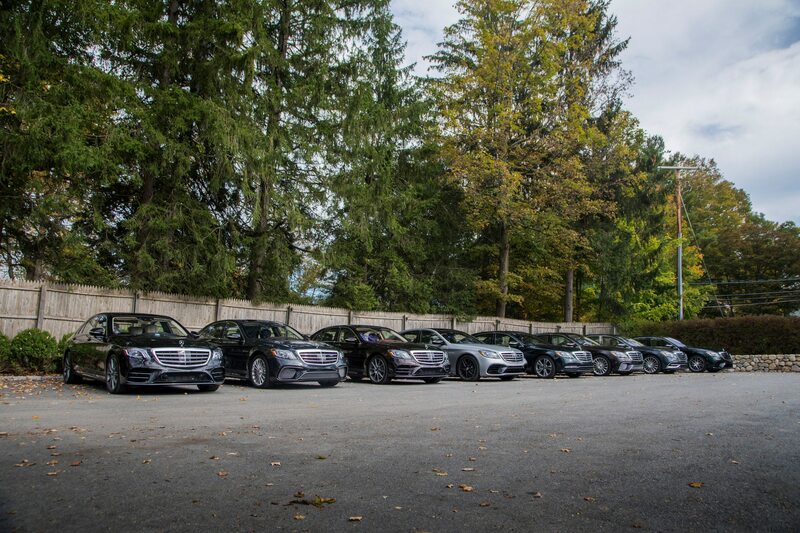 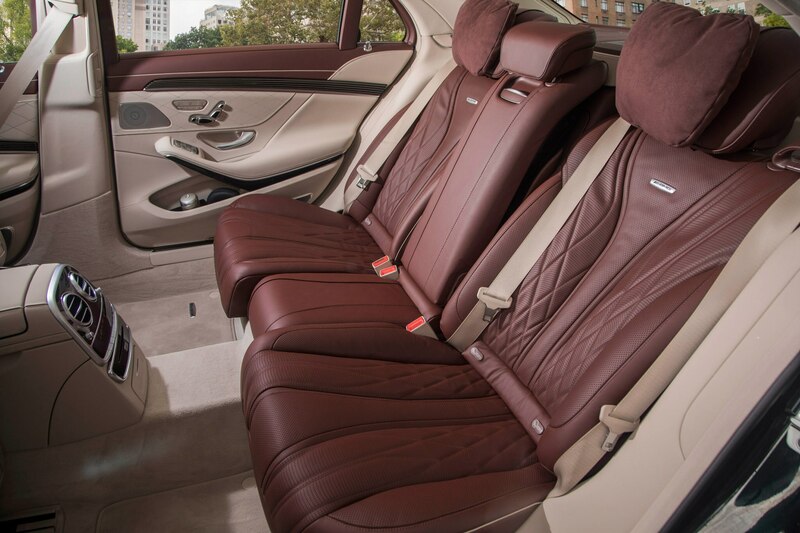 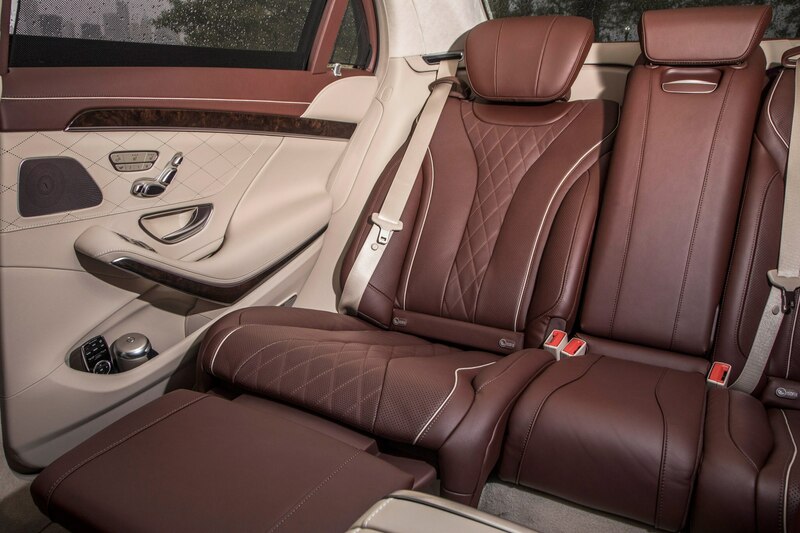 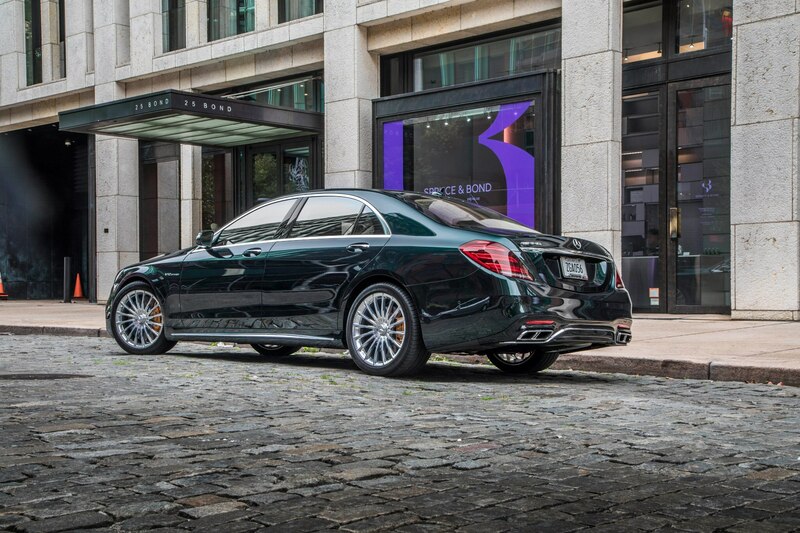 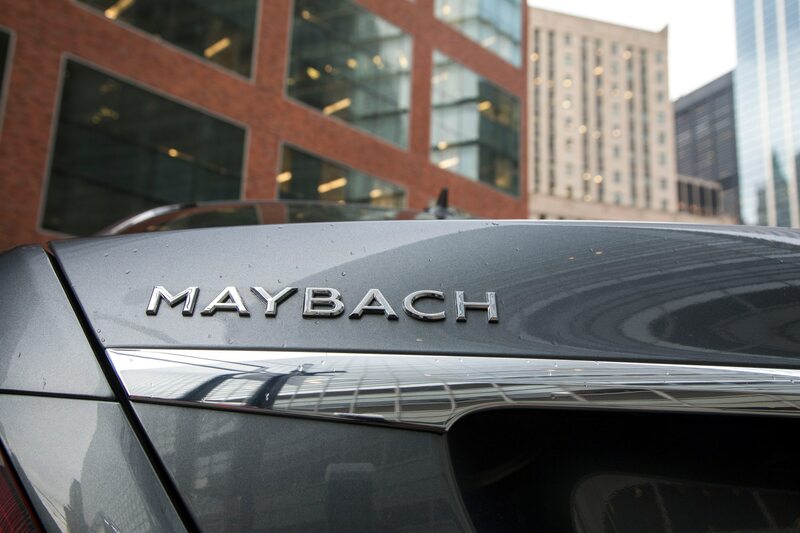 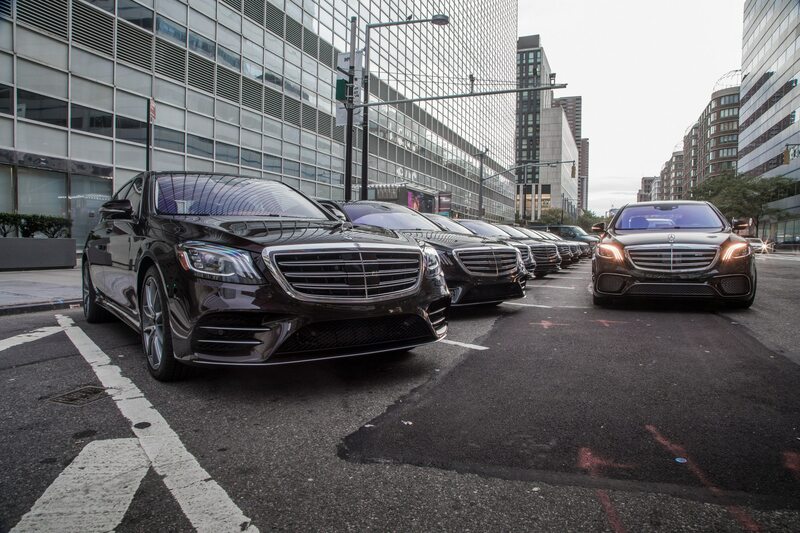 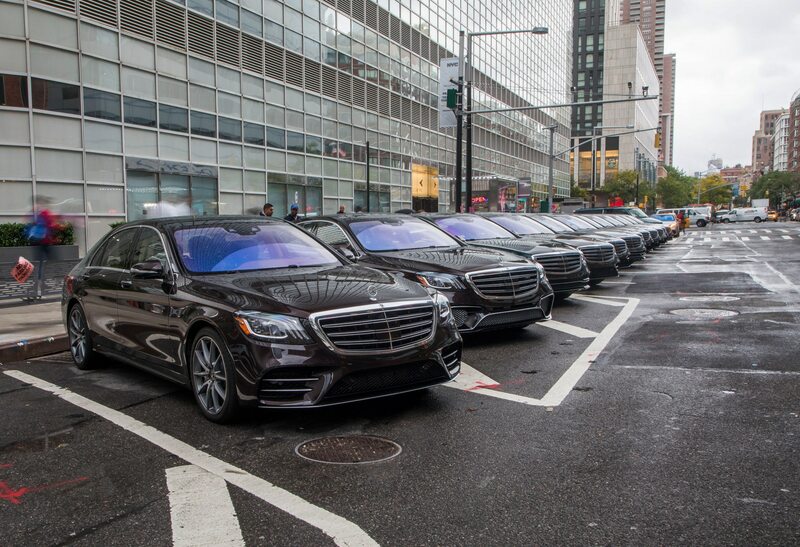 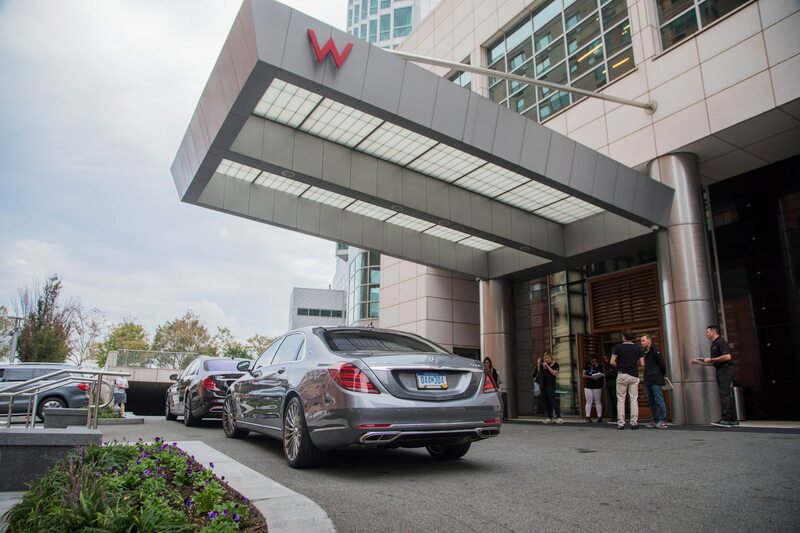 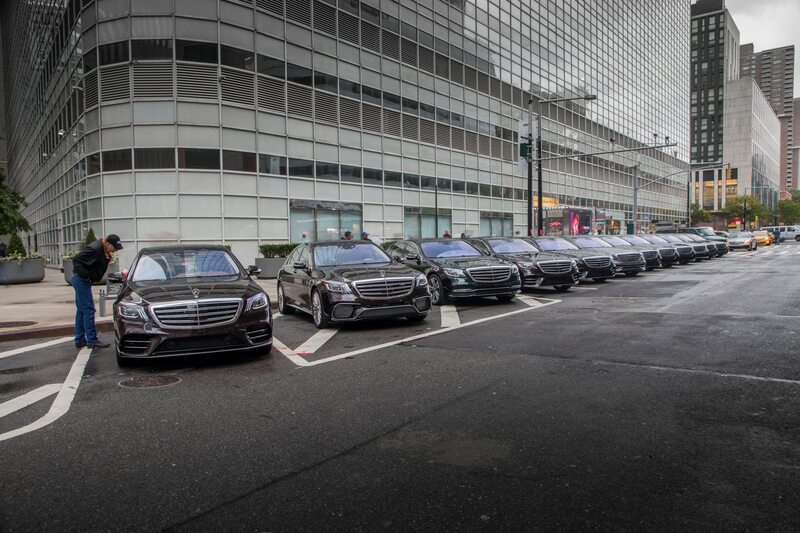 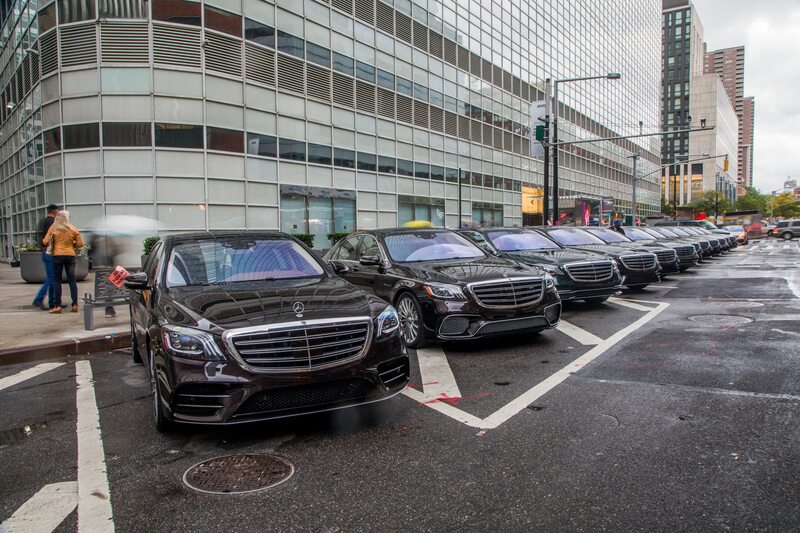 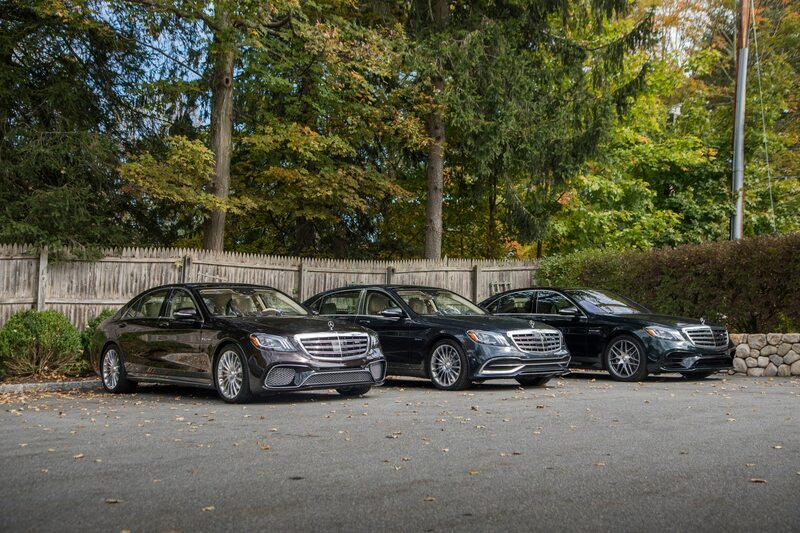 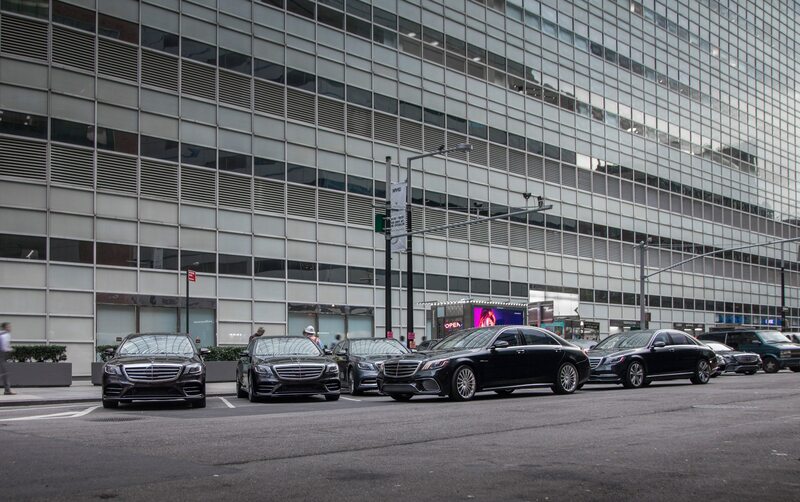 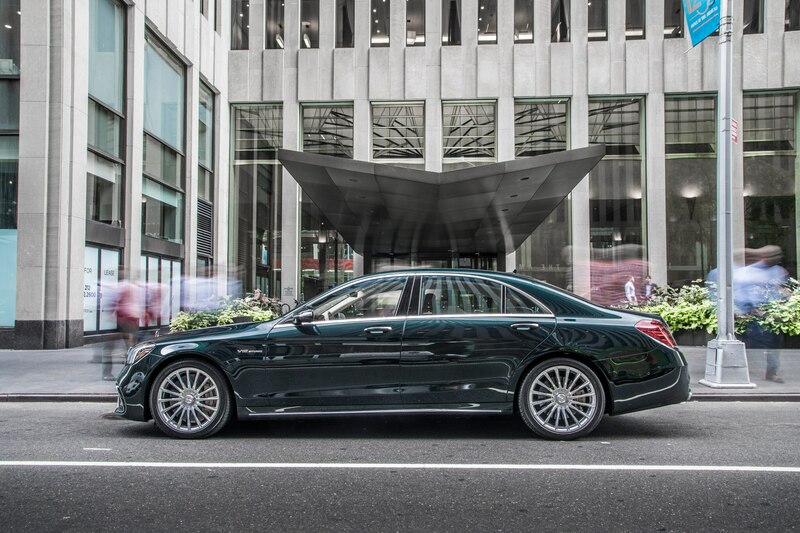 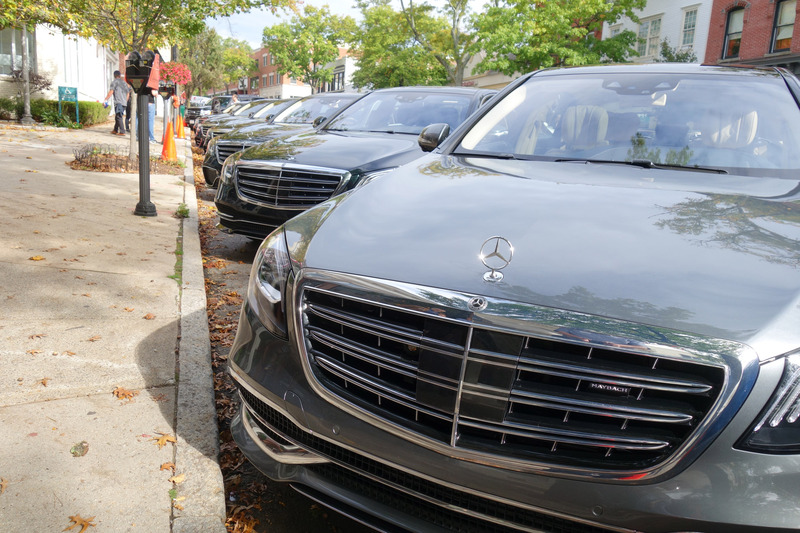 To be fair, Mercedes-Maybach S650 versions were also available to drive, but we didn’t have time to sample them on our brief East Coast excursion and will have to get back to you with an update for comparison. 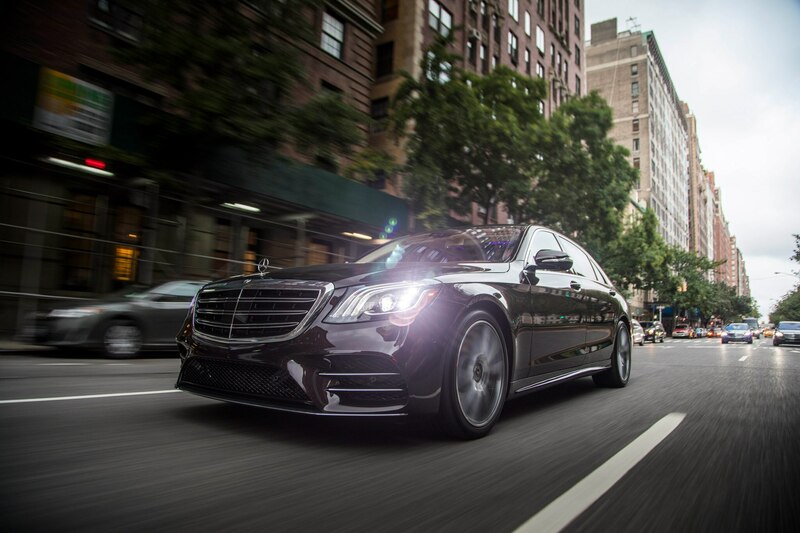 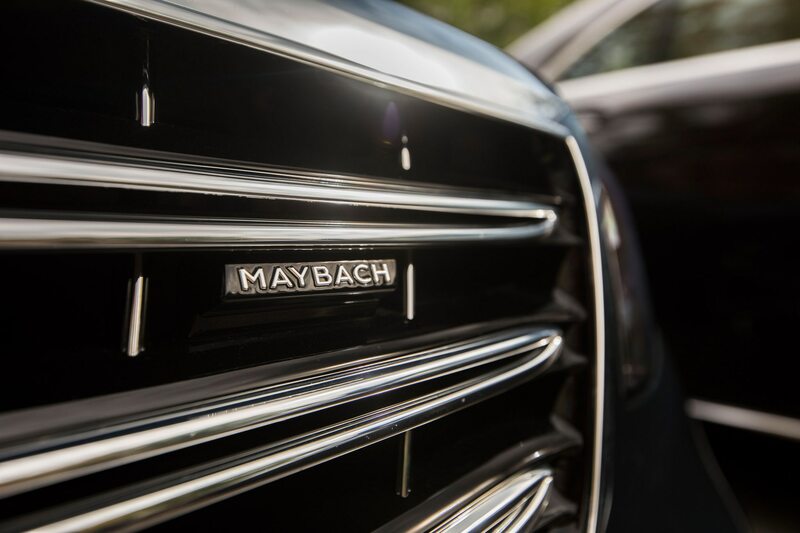 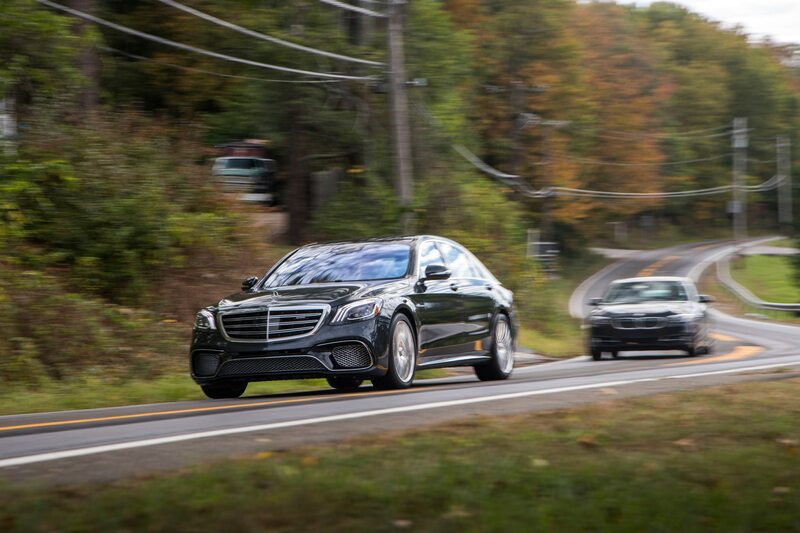 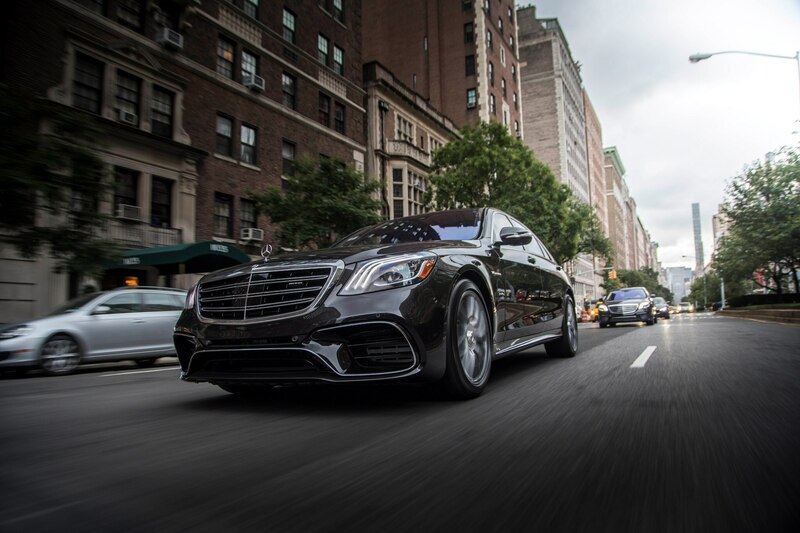 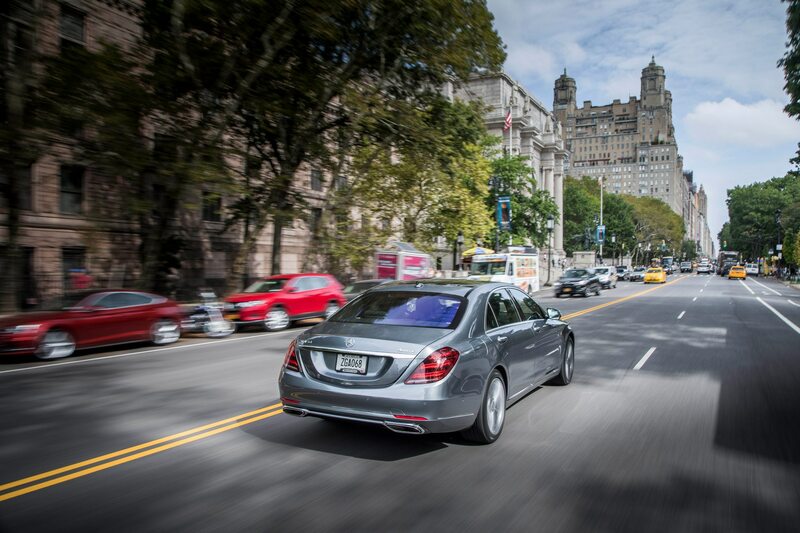 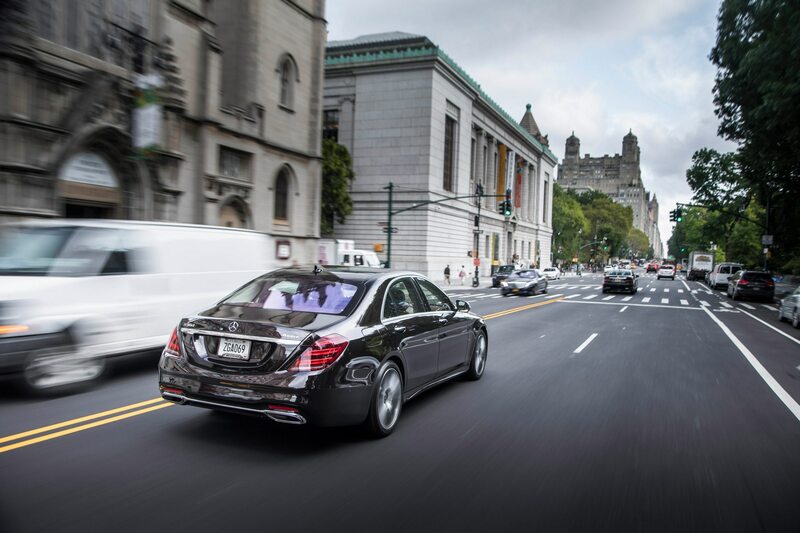 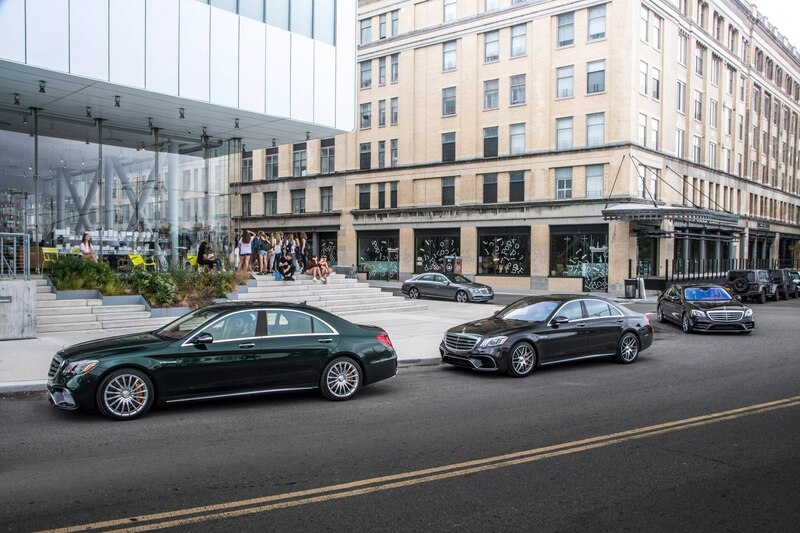 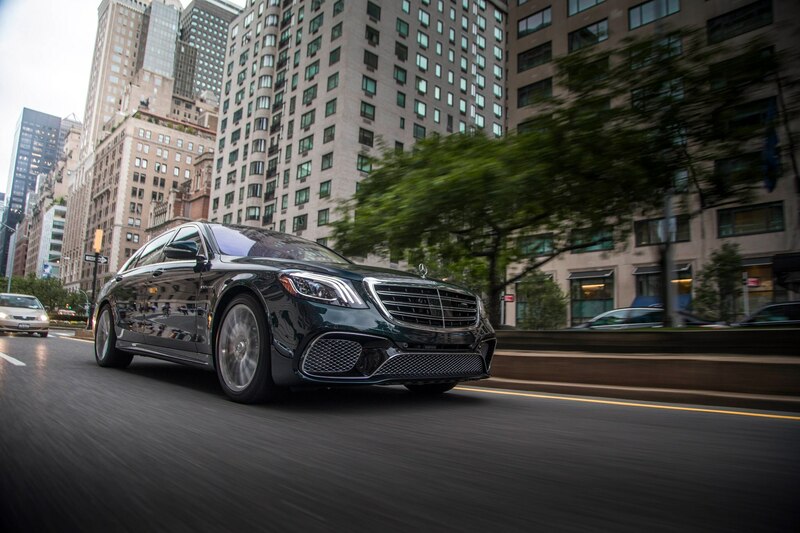 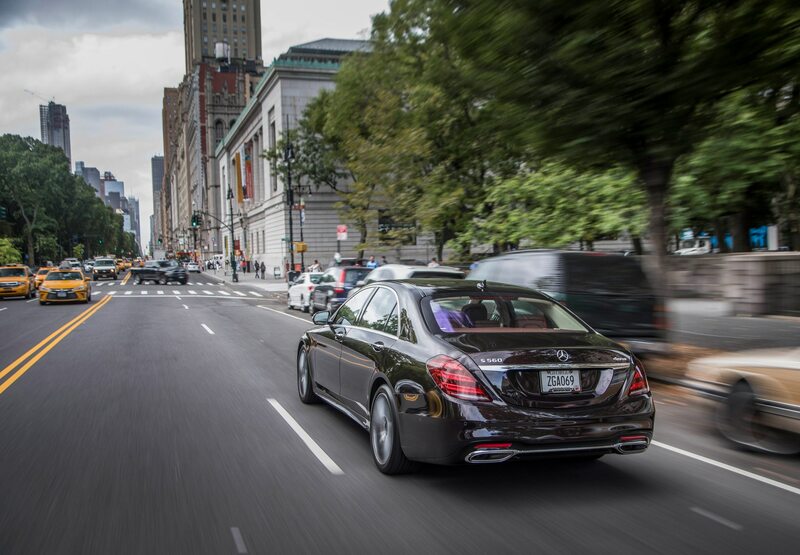 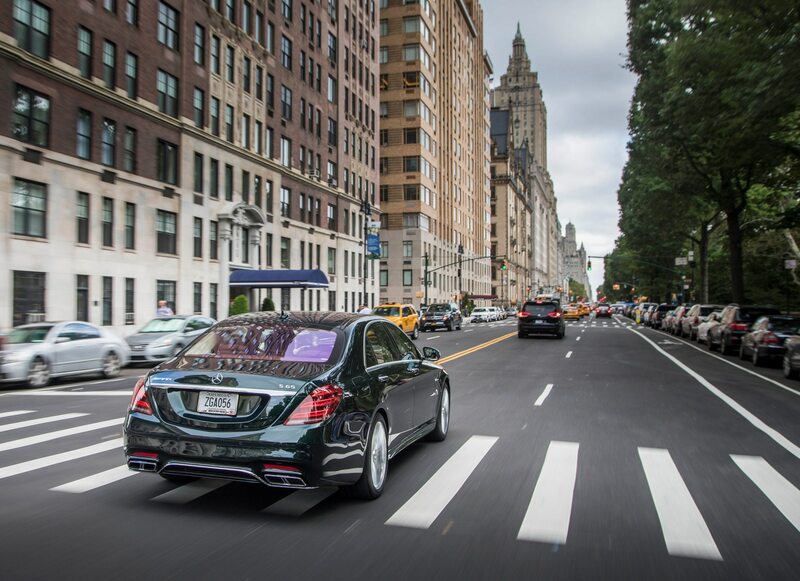 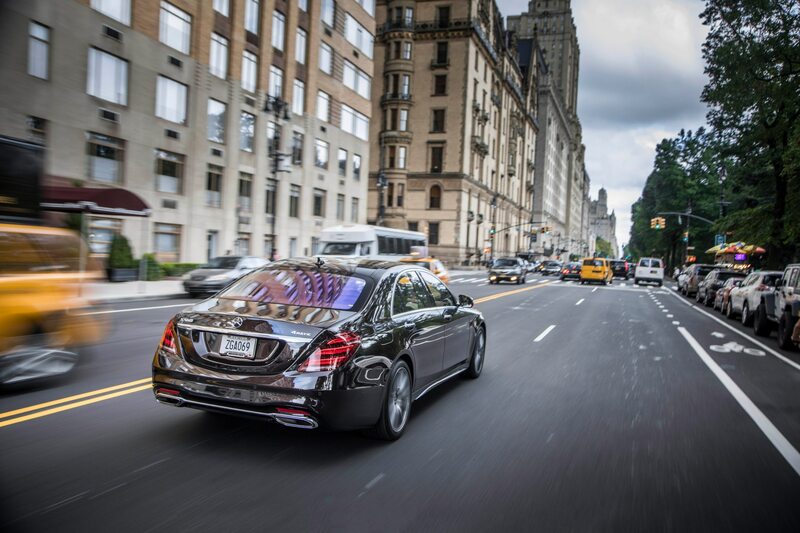 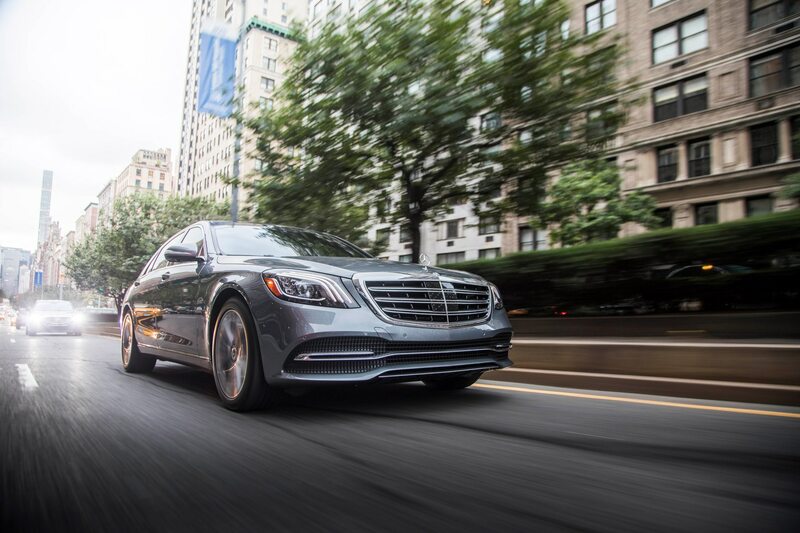 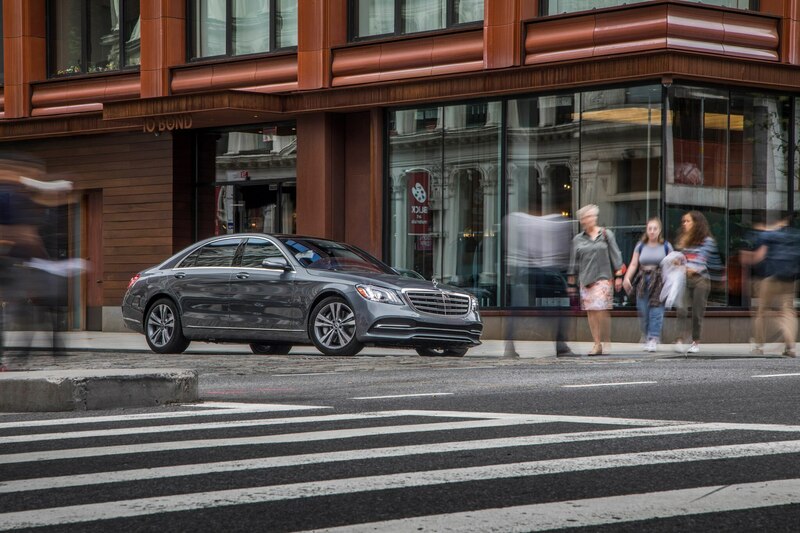 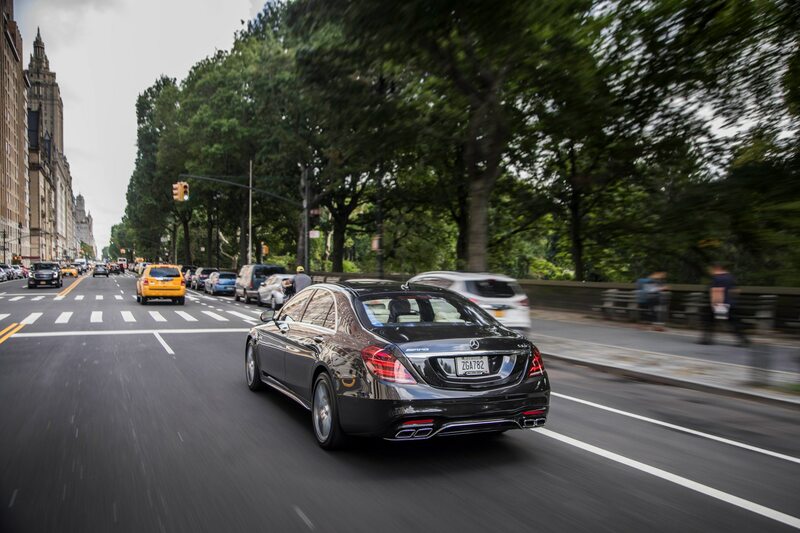 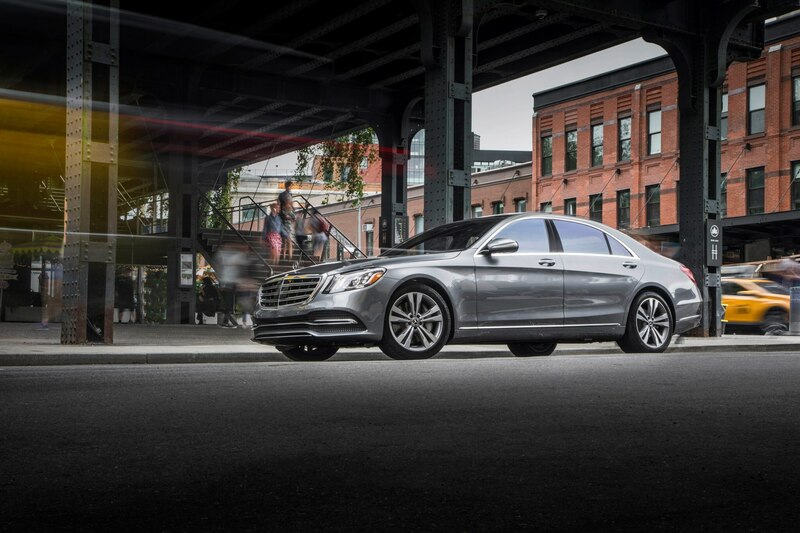 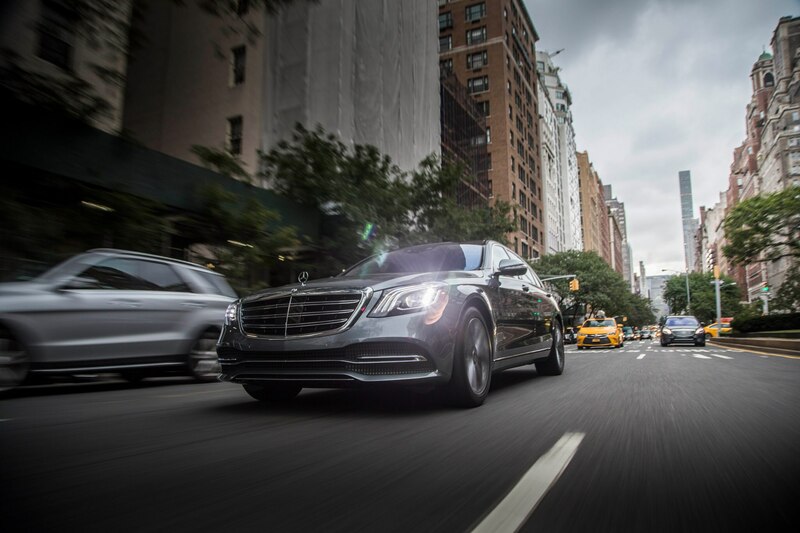 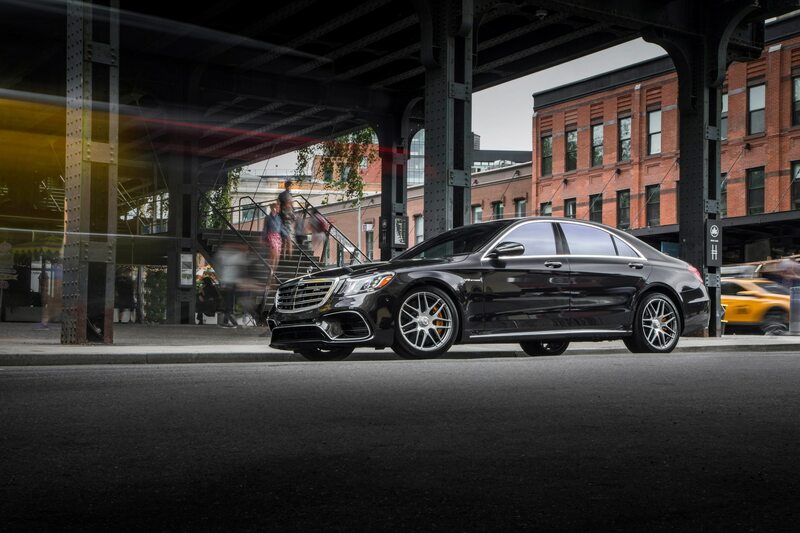 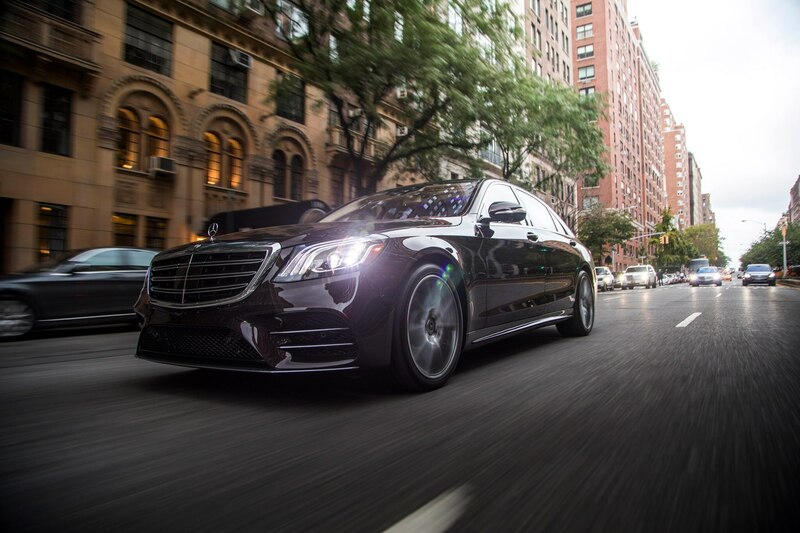 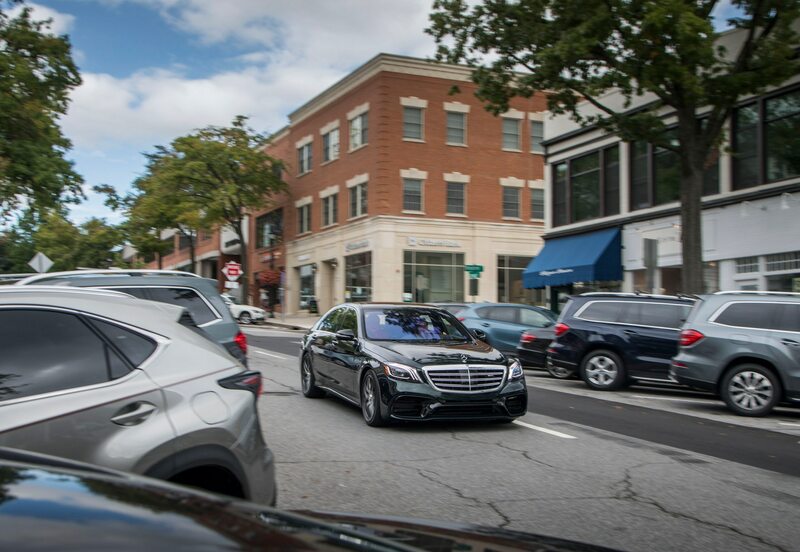 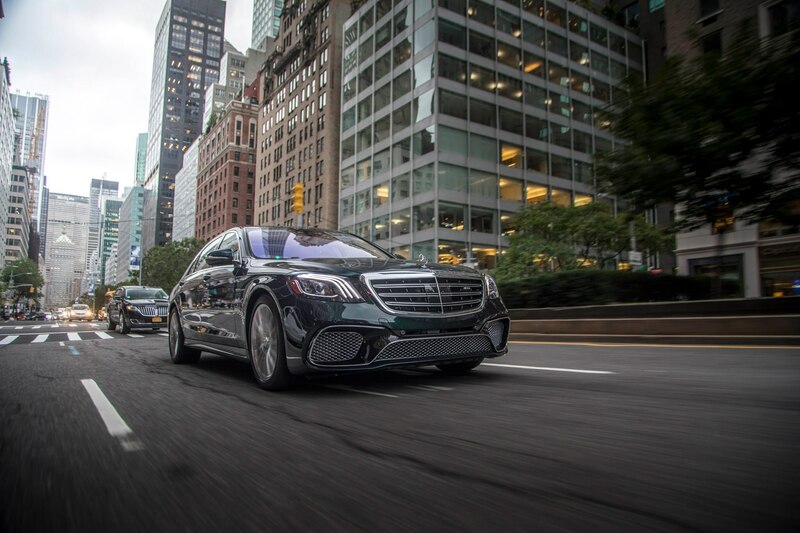 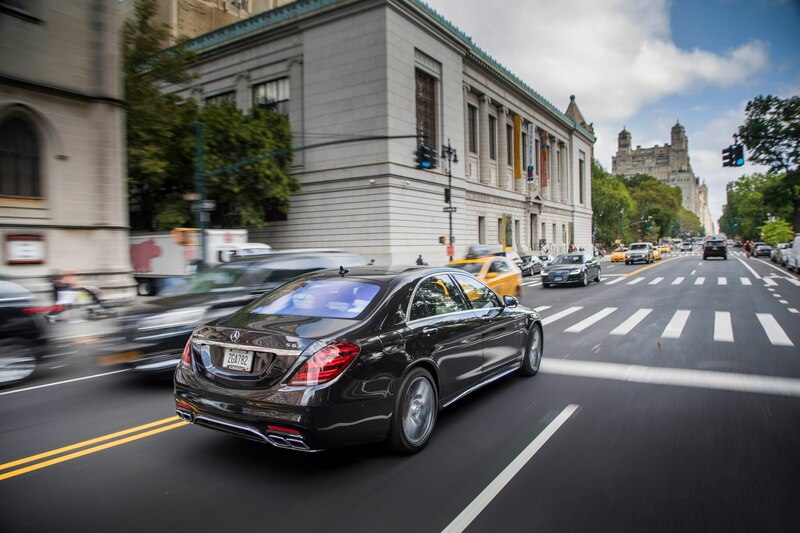 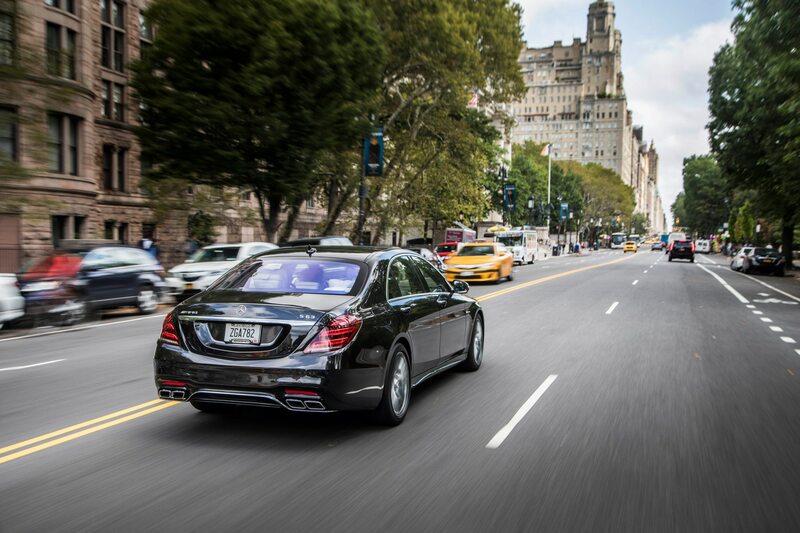 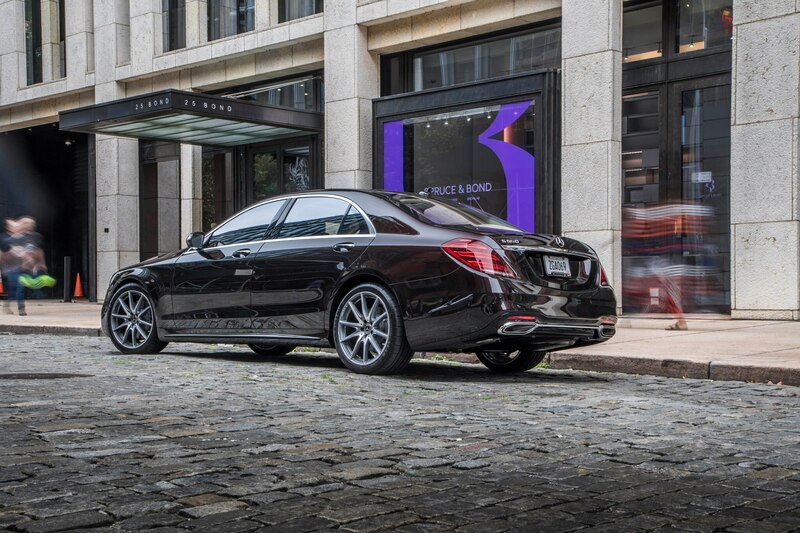 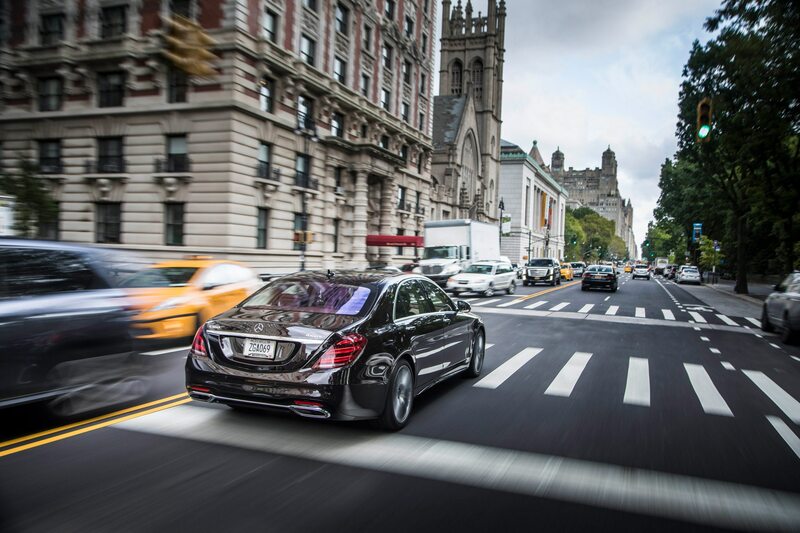 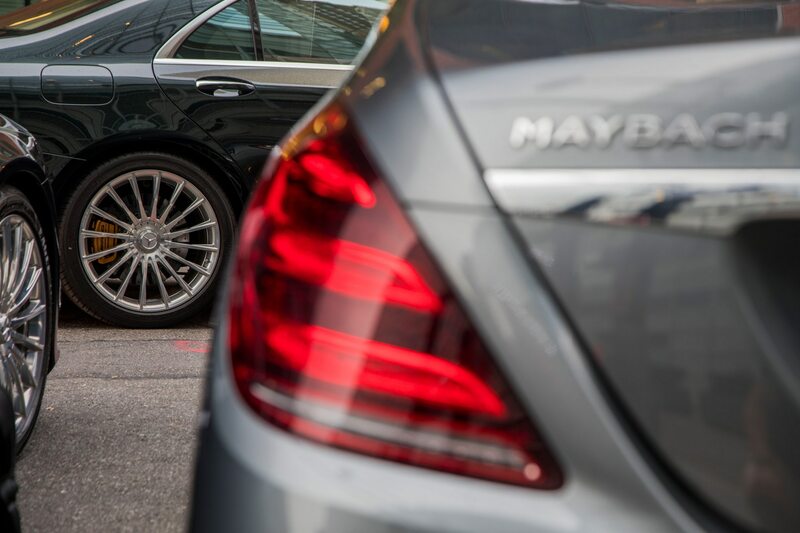 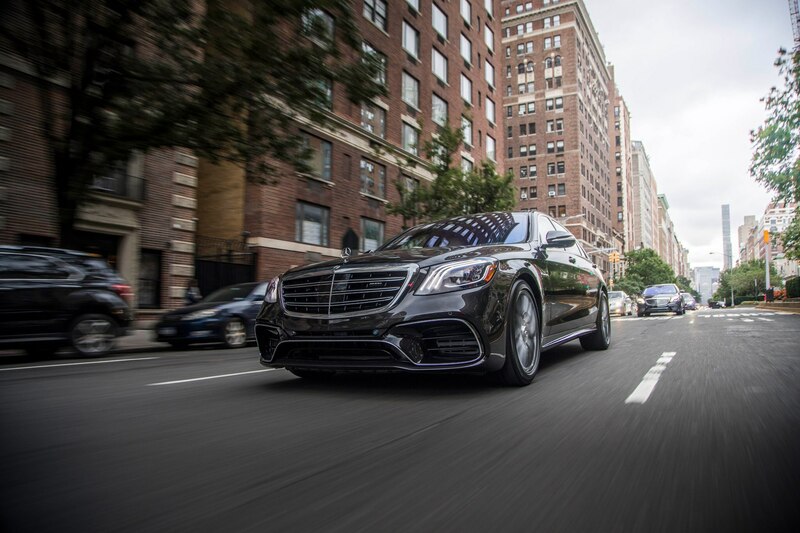 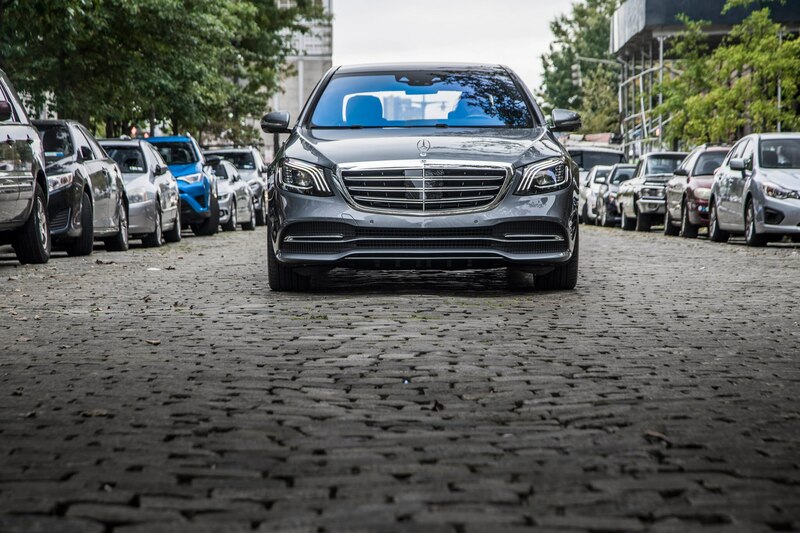 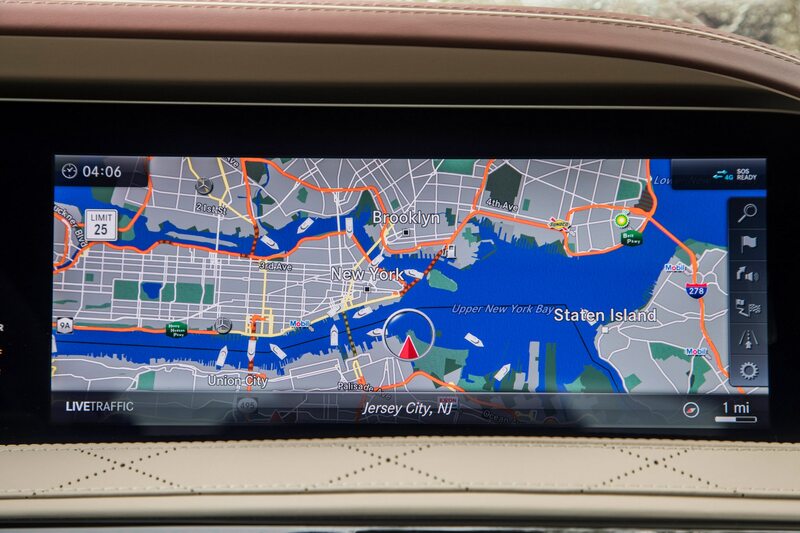 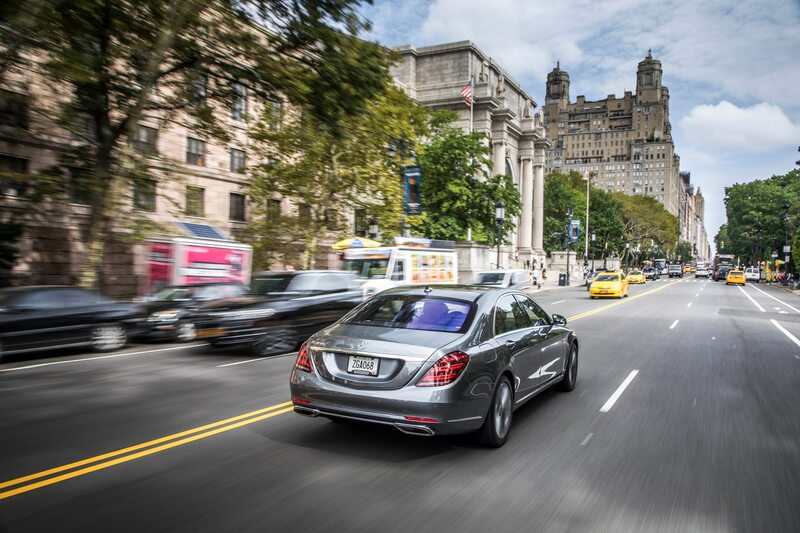 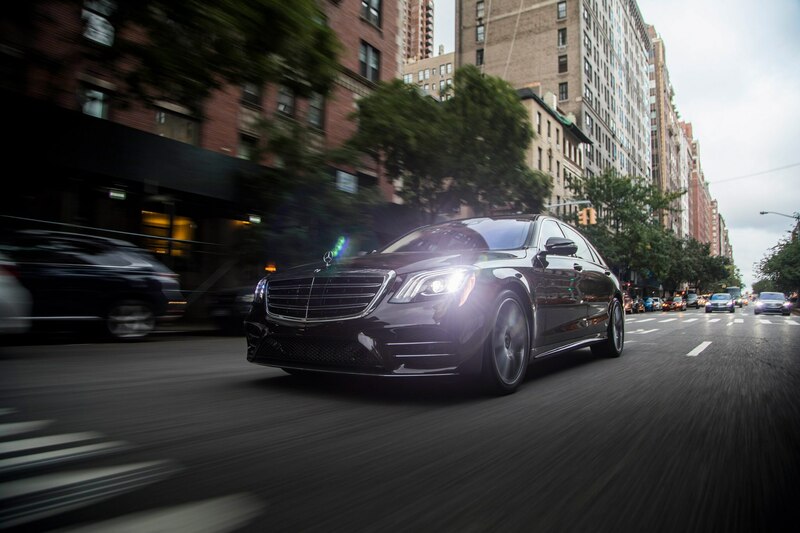 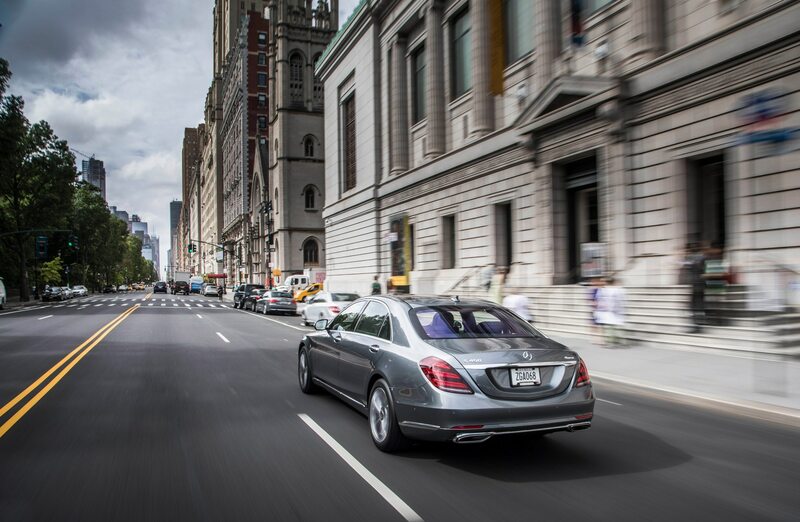 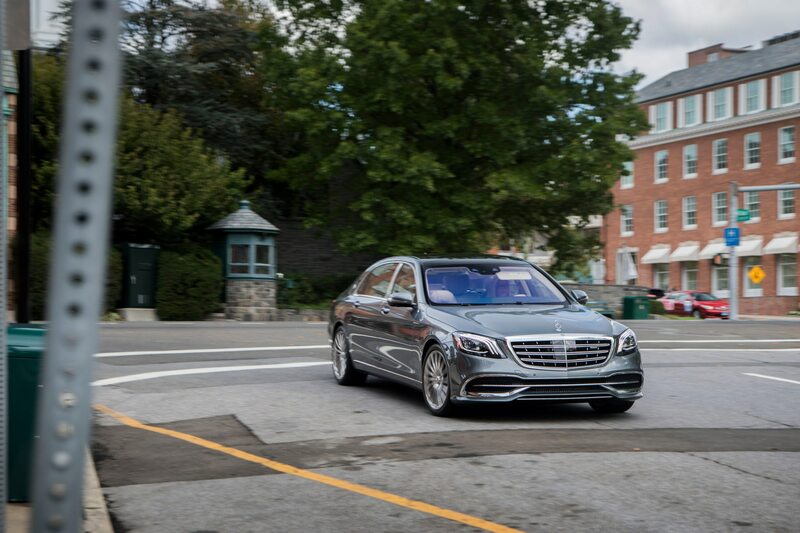 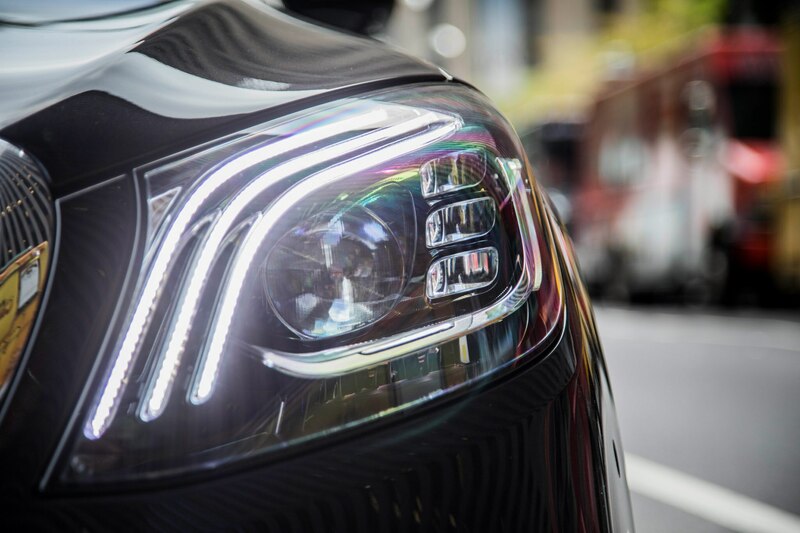 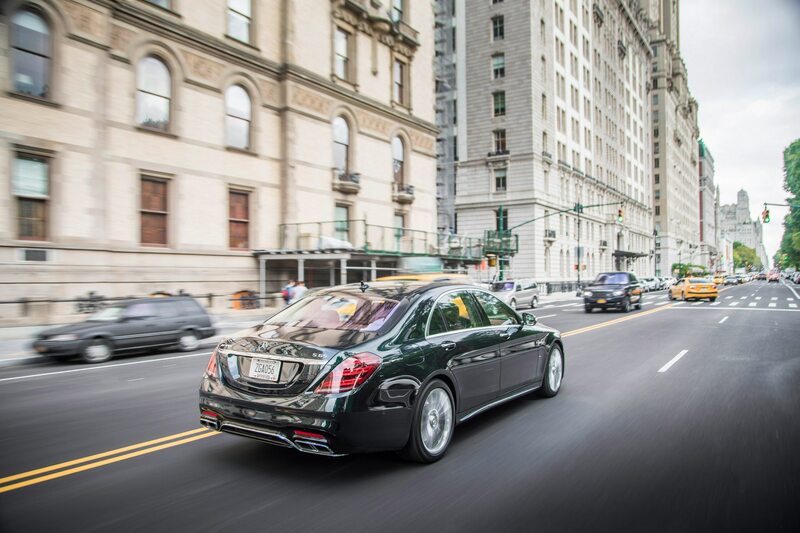 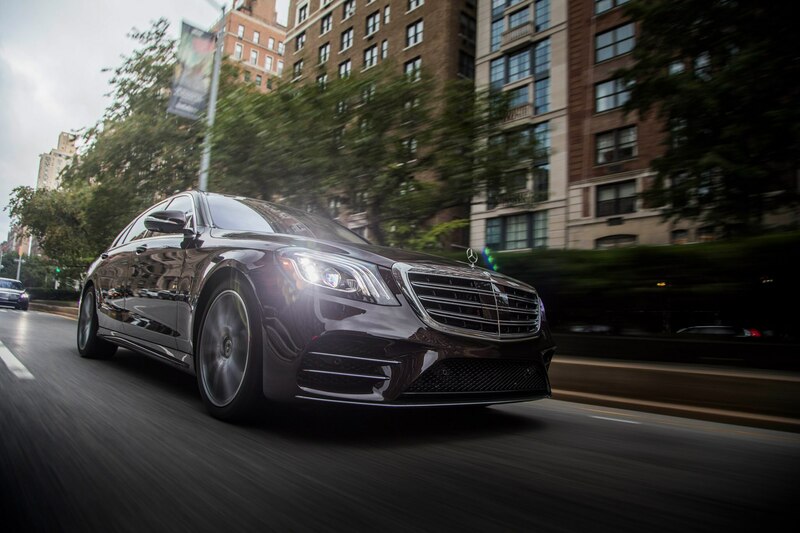 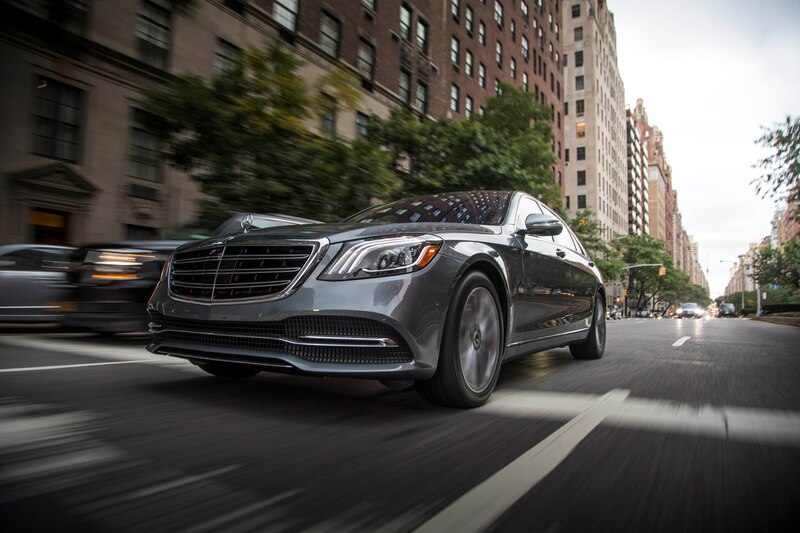 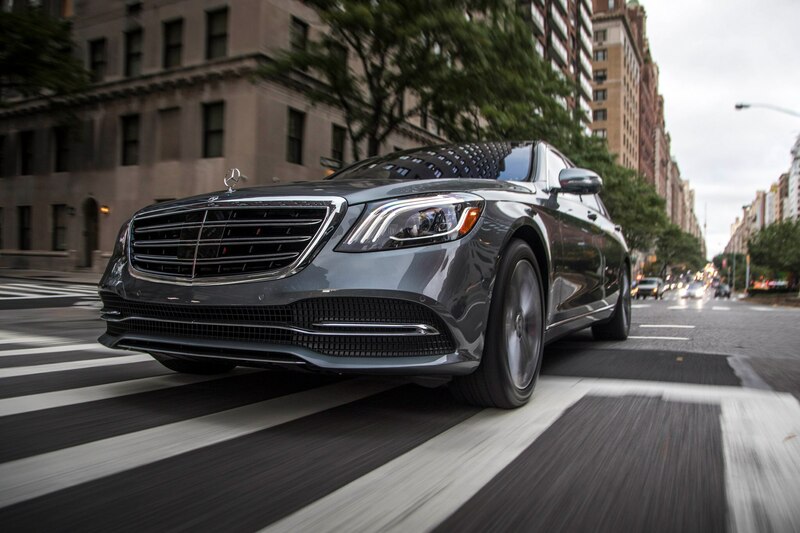 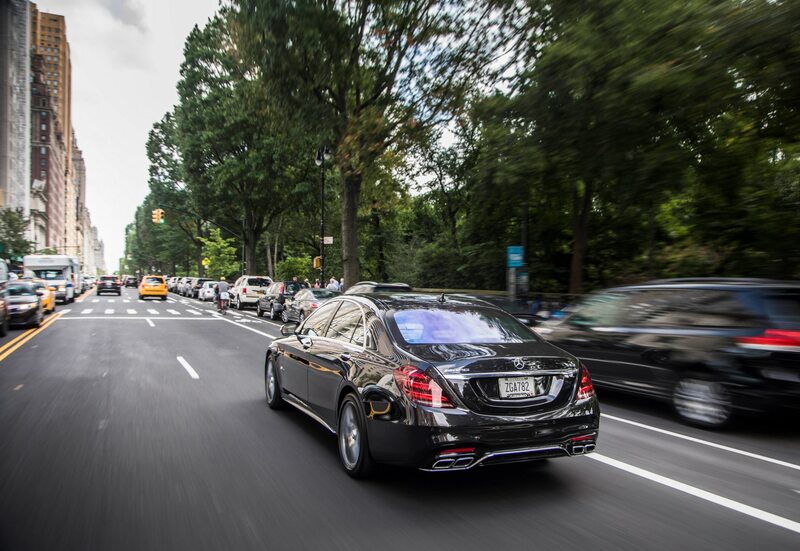 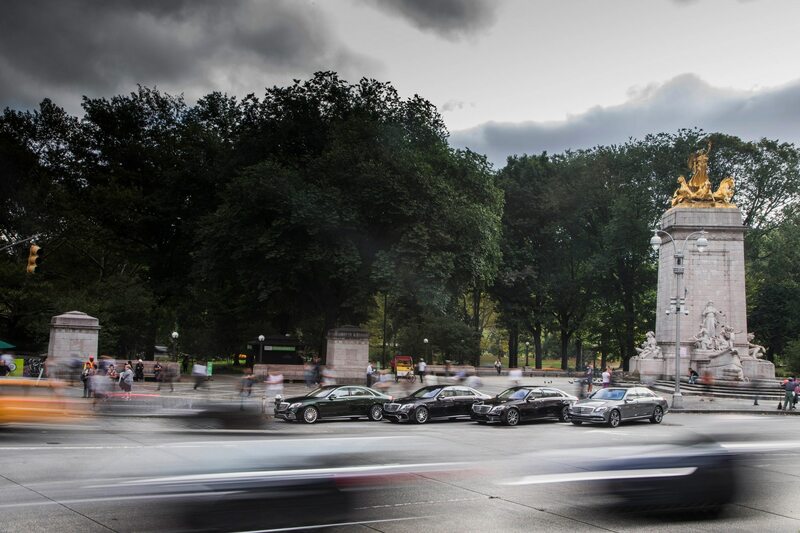 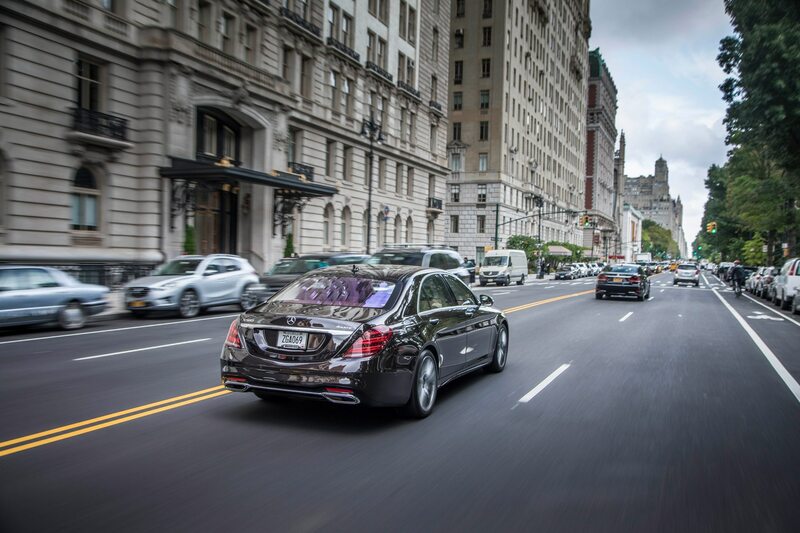 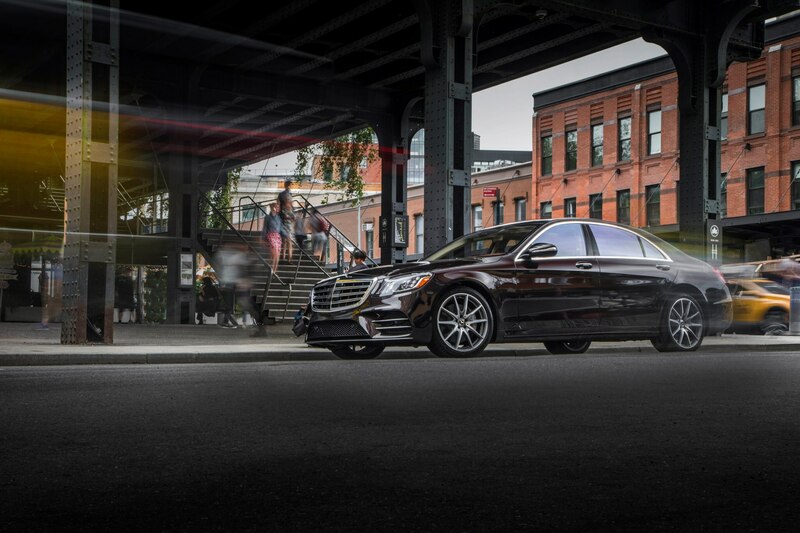 In Sport Plus mode with the Eco start/stop function turned off, the S65 roars up the highway towards the Henry Hudson and Cross County Parkways with ease. 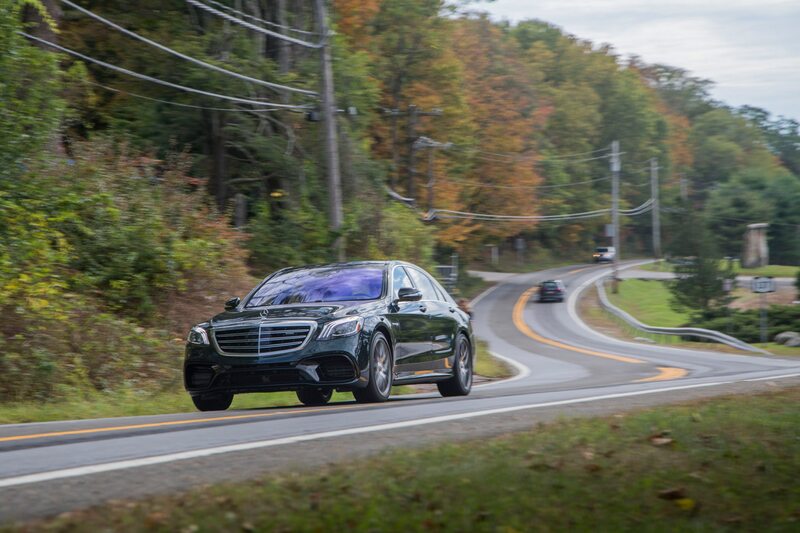 Magic body control suspension sorcery with curve tilting and road surface scanning helps detect potholes and smooth out the road bumps along the way. 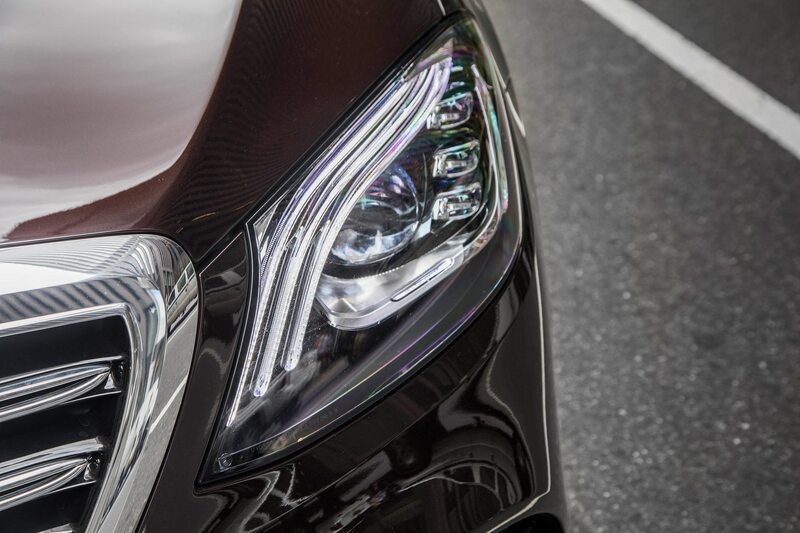 And there are plenty on these roads to watch out for. 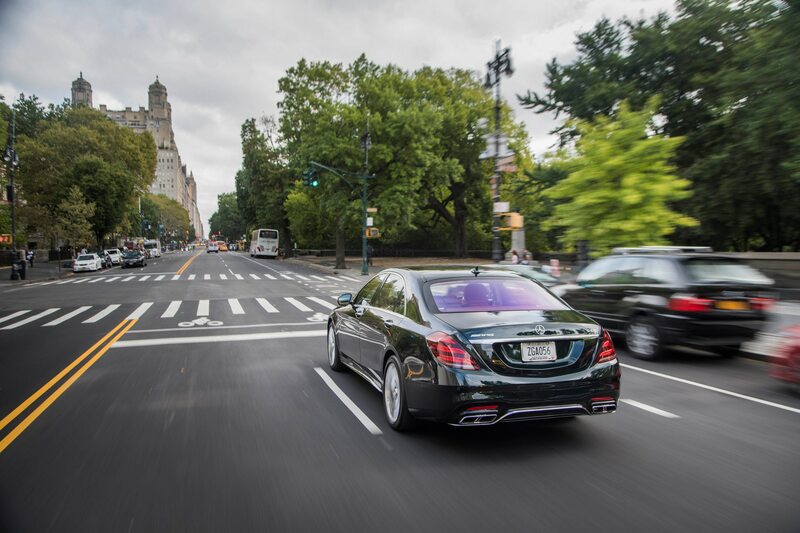 This system is a real must for cultivated commuters around the city. 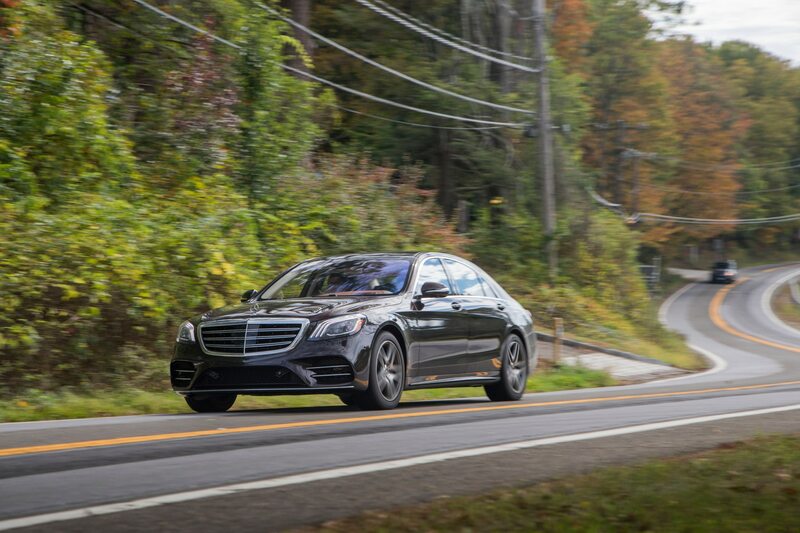 Driving the long sedan upstate, it feels big, brawny, and occasionally brash on the curvy Connecticut roads. 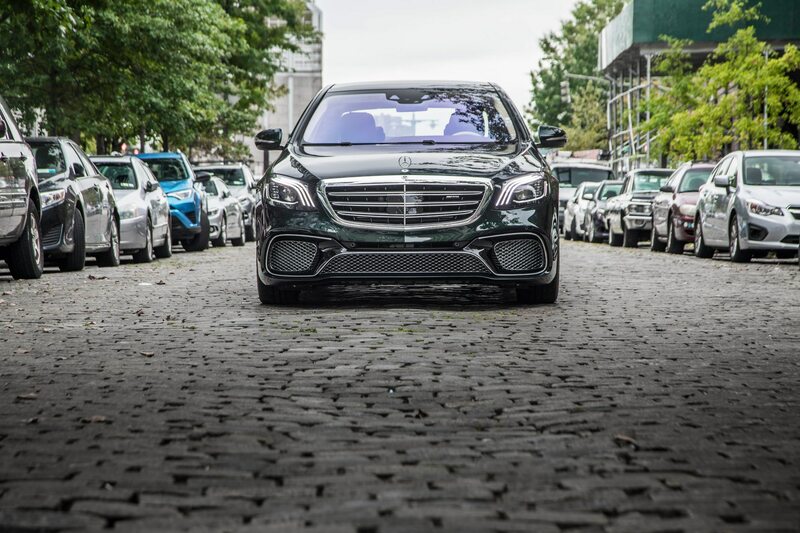 Its active safety assist technology comes in handy as errant SUVs drift into the narrow lanes of the Bronx River Parkway on the drive towards Greenwich. 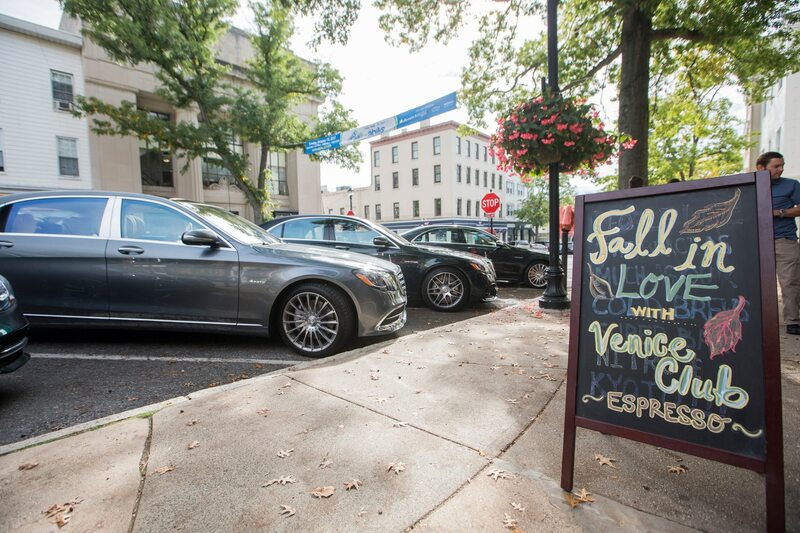 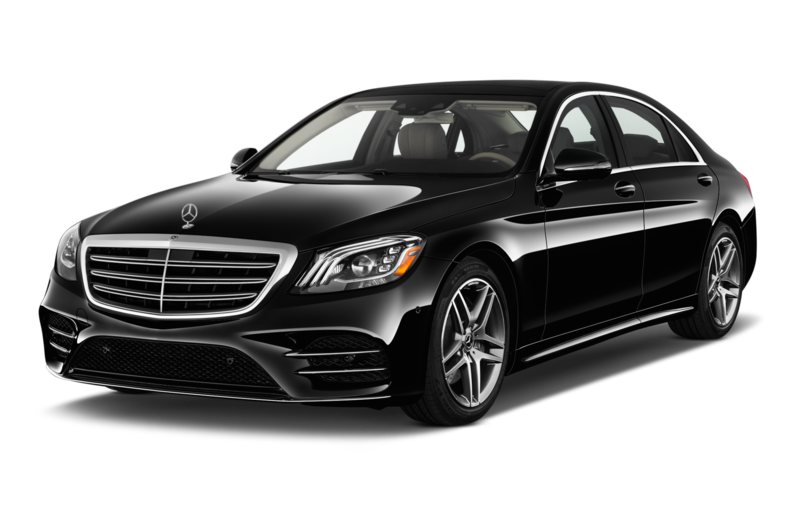 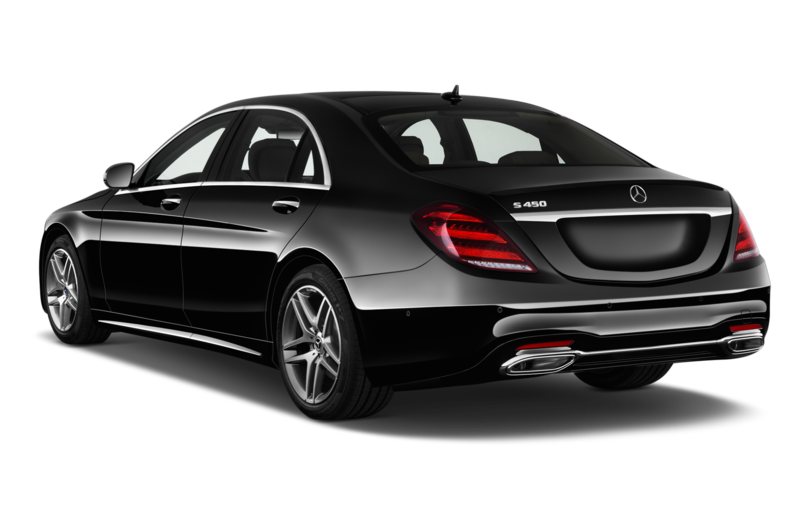 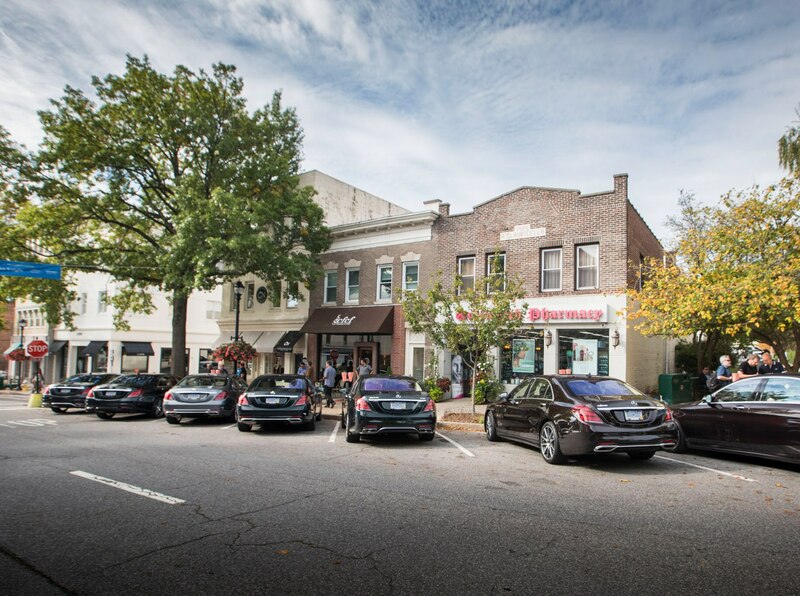 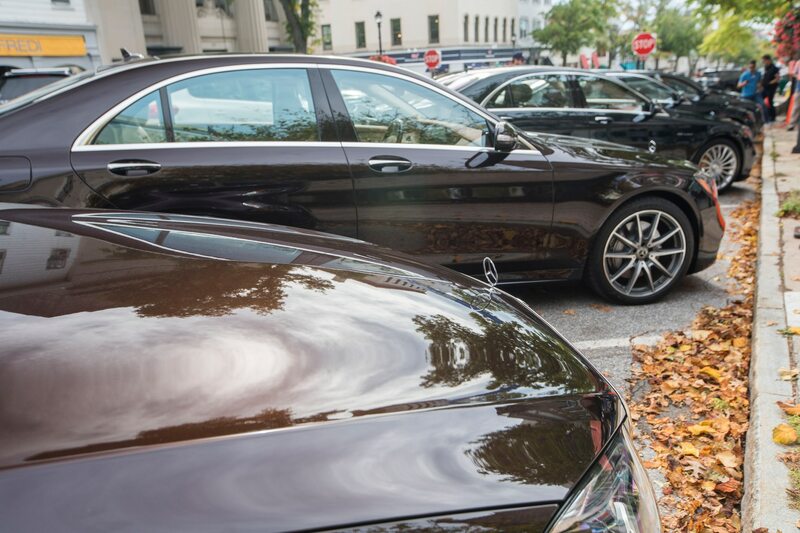 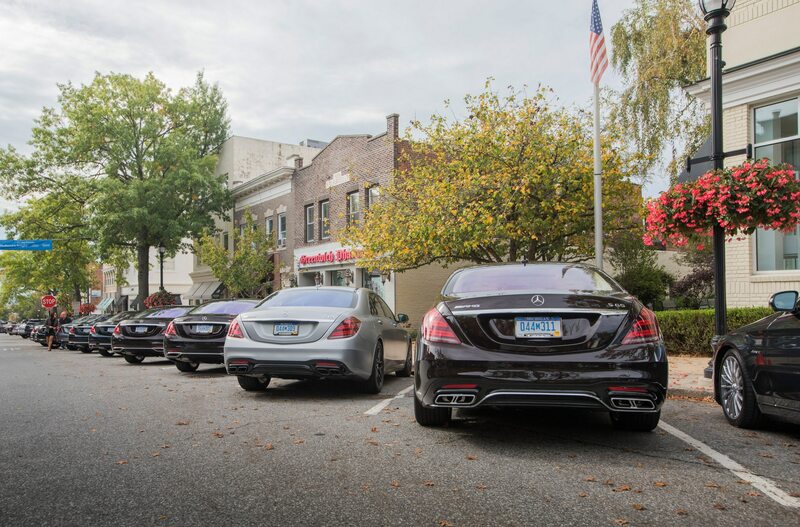 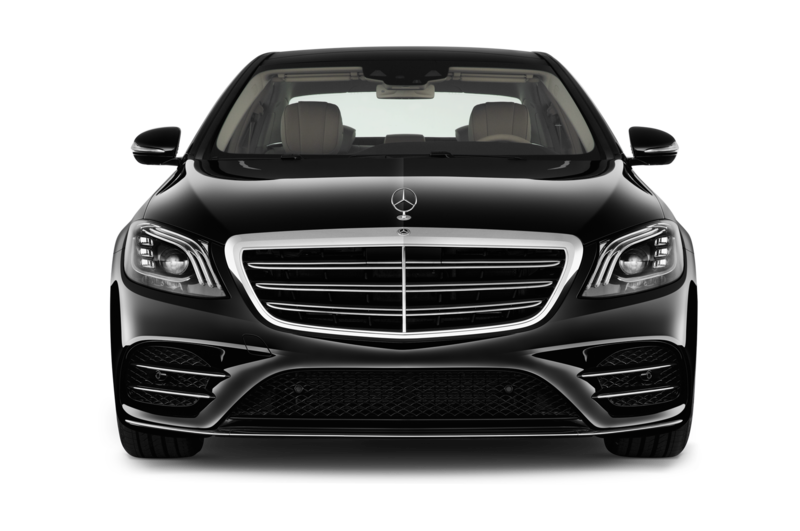 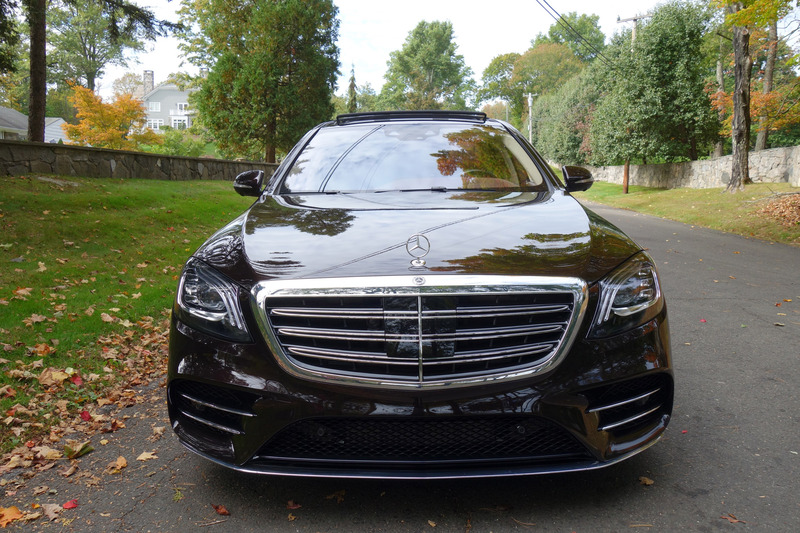 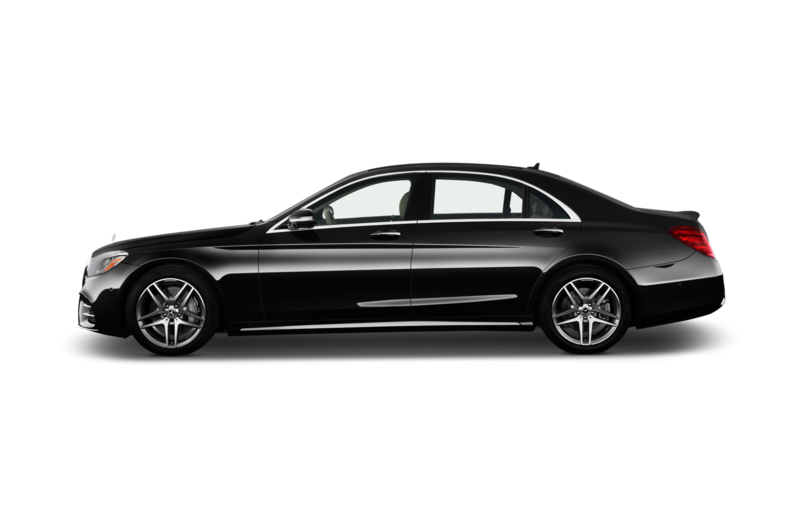 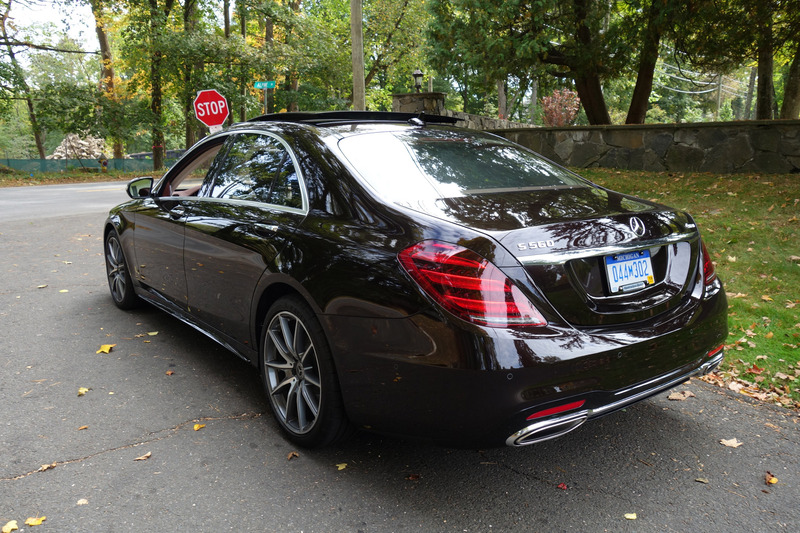 After a quick stop at Coffee Cafe Roasters and a switch into a Ruby Black Metallic painted 2018 Mercedes-Benz S560 4MATIC Sedan, I can immediately feel the difference between the two vehicles. 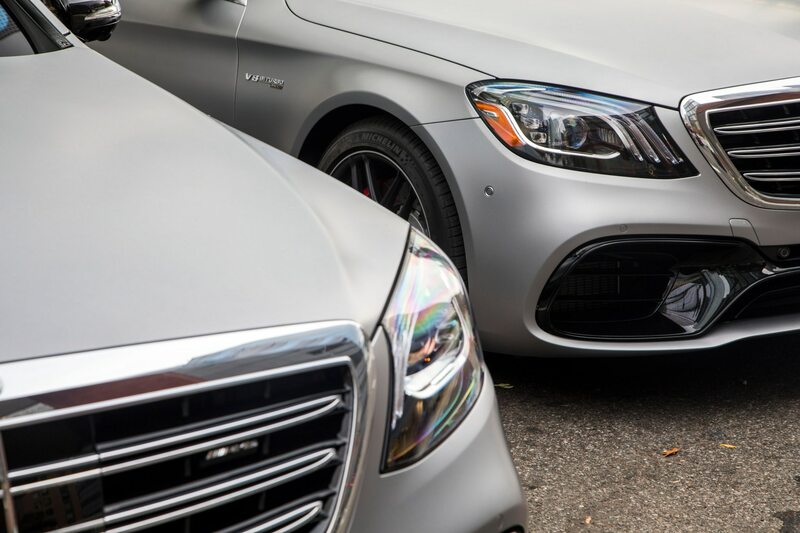 They may look similar on the outside and share the same wheelbase of 124.6 inches, but the S560 is 24 pounds heavier than the S65 at 4,850. 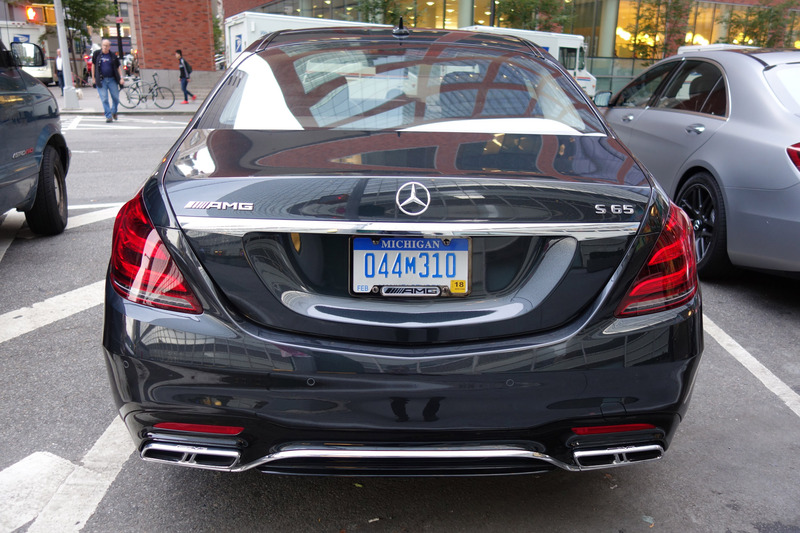 Surprisingly, the S560 feels more agile, smooth, and like everything else one would expect from Mercedes-Benz compared to its AMG upgrade. 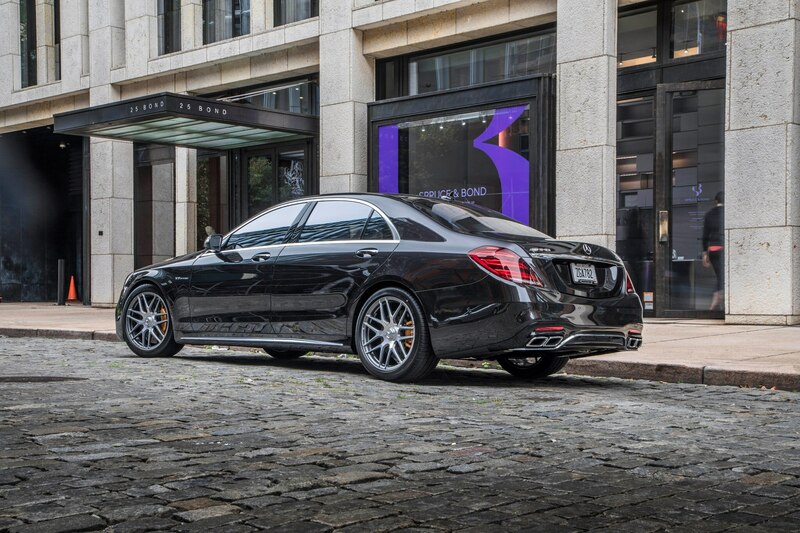 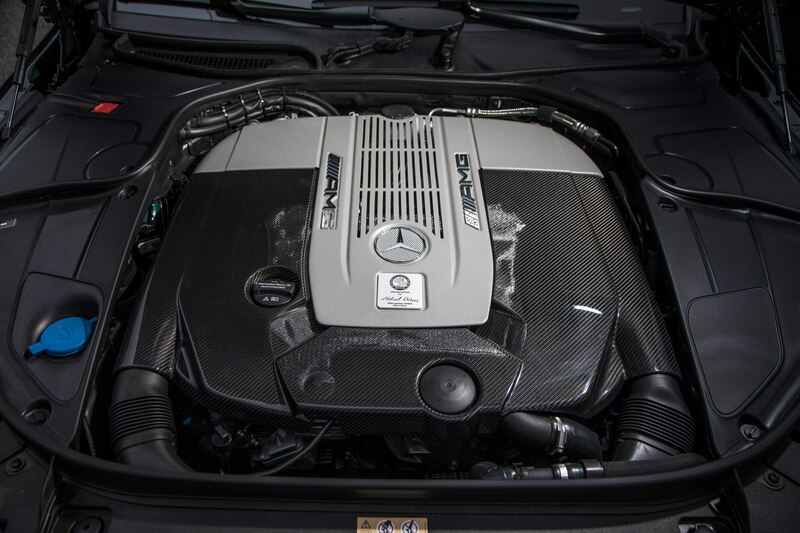 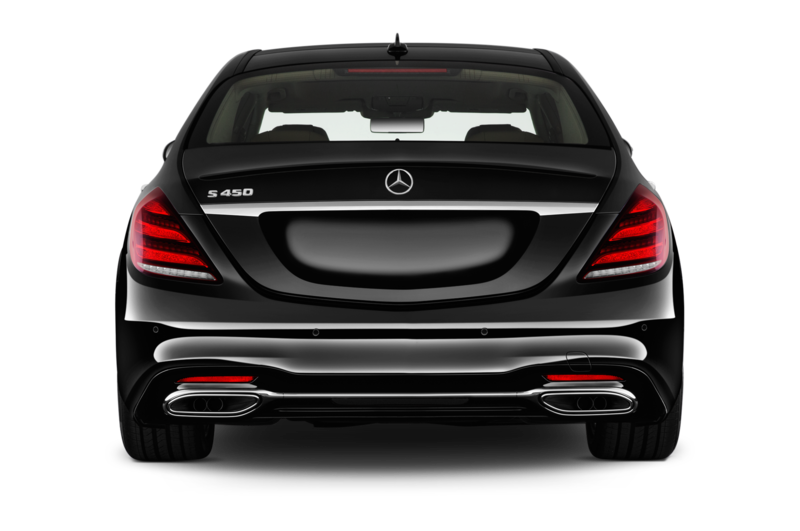 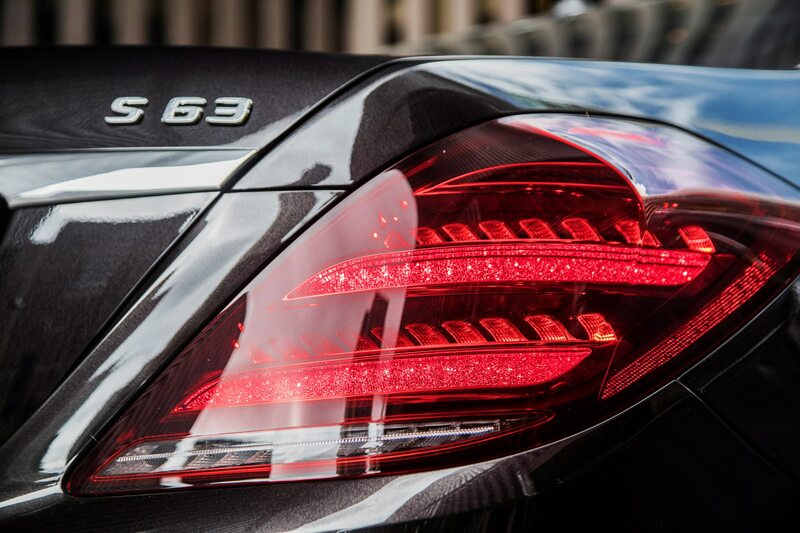 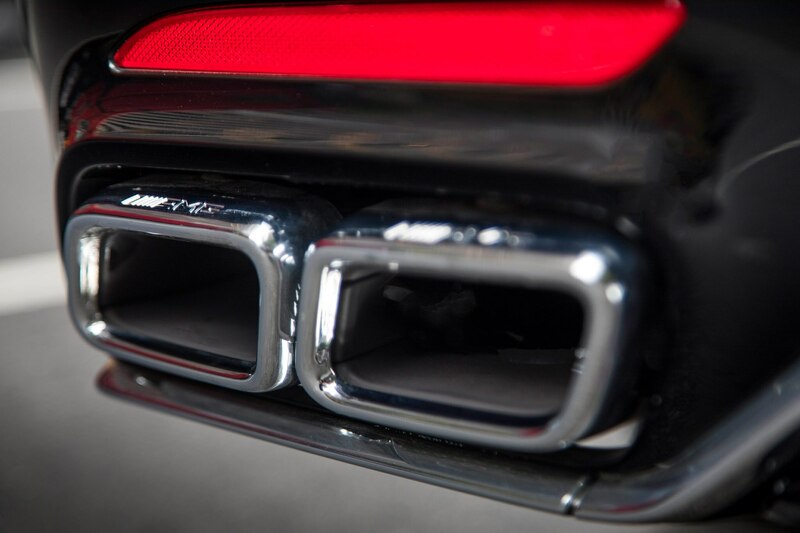 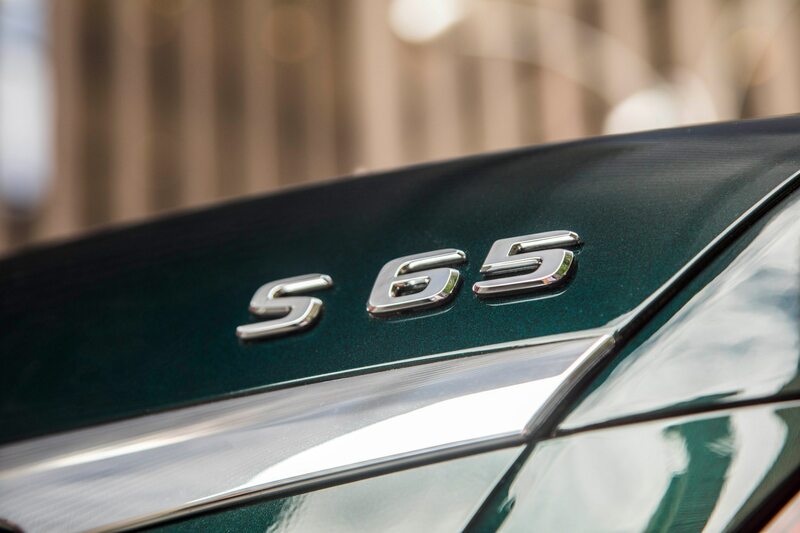 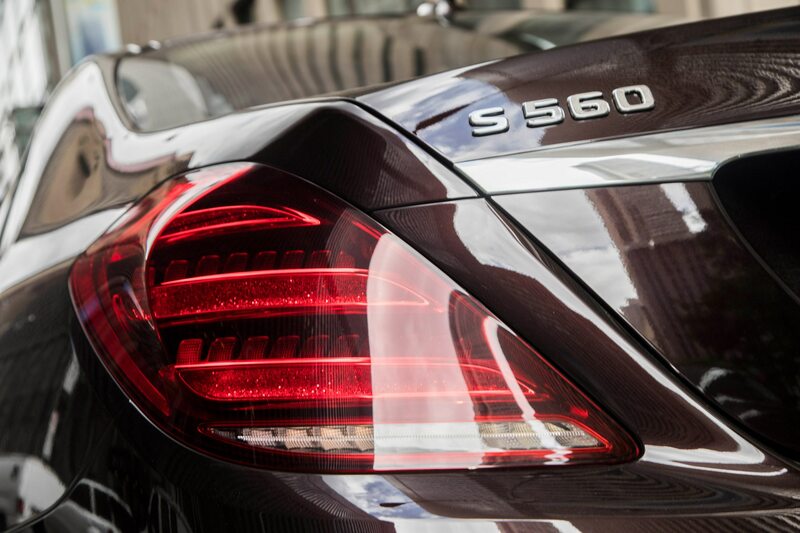 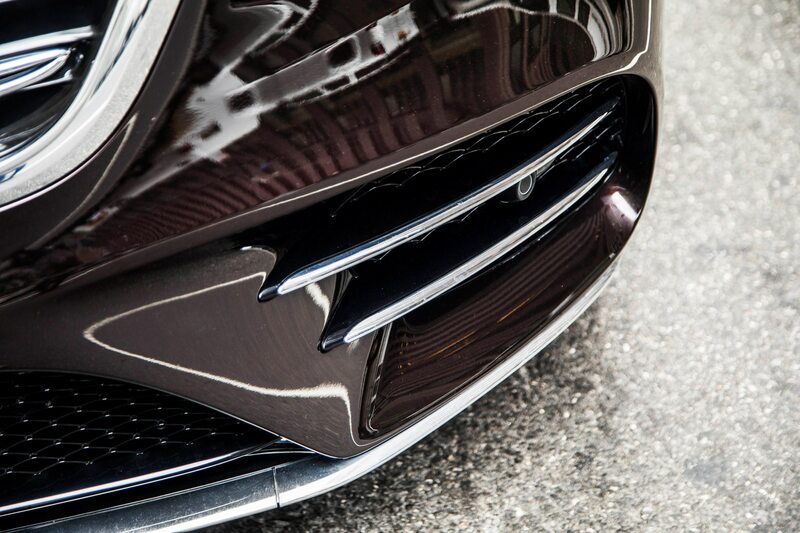 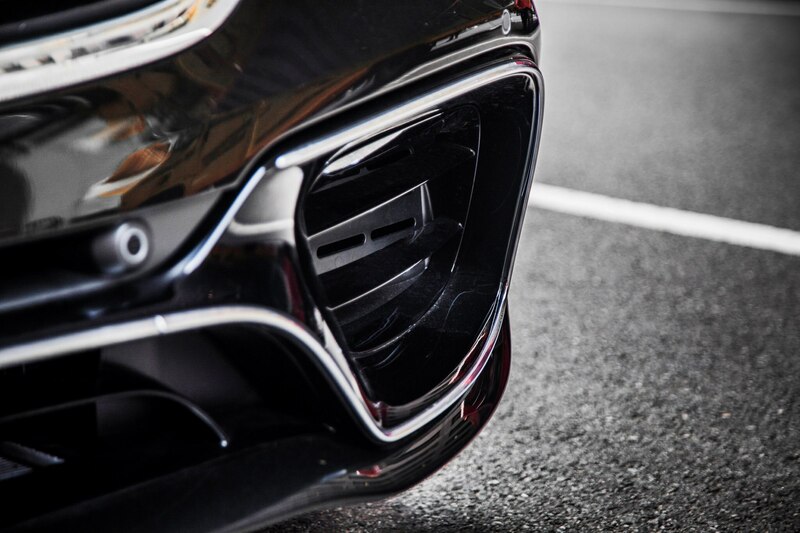 The S560 packs a 4.0-liter twin turbo V-8 engine that offers 463 hp and 516 lb-ft of torque. 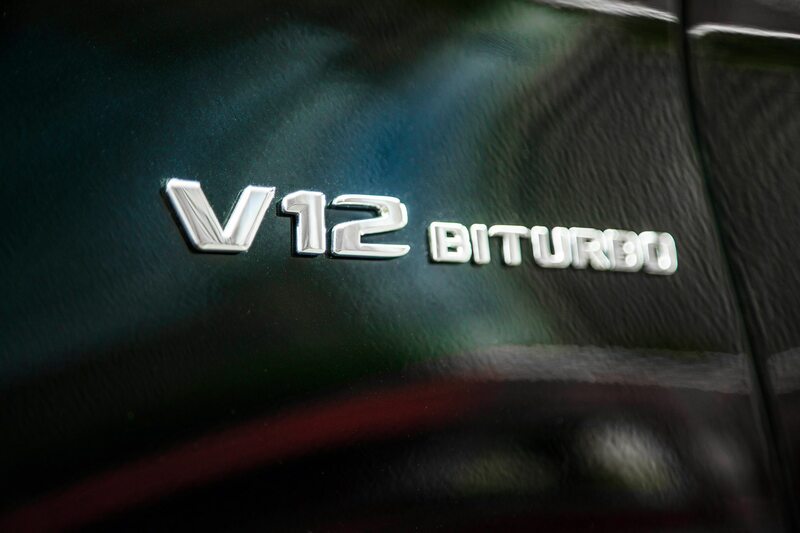 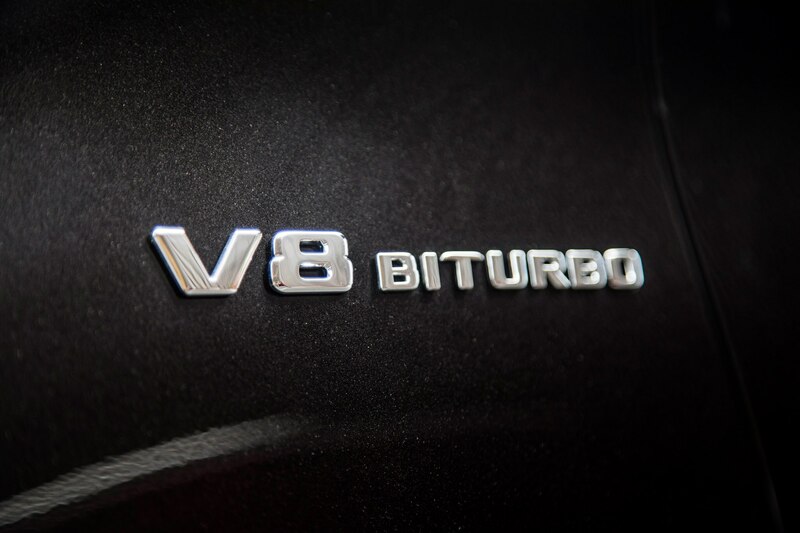 The V-8 is mated to a super smooth 9-speed automatic transmission with a 4MATIC all-wheel drive system. 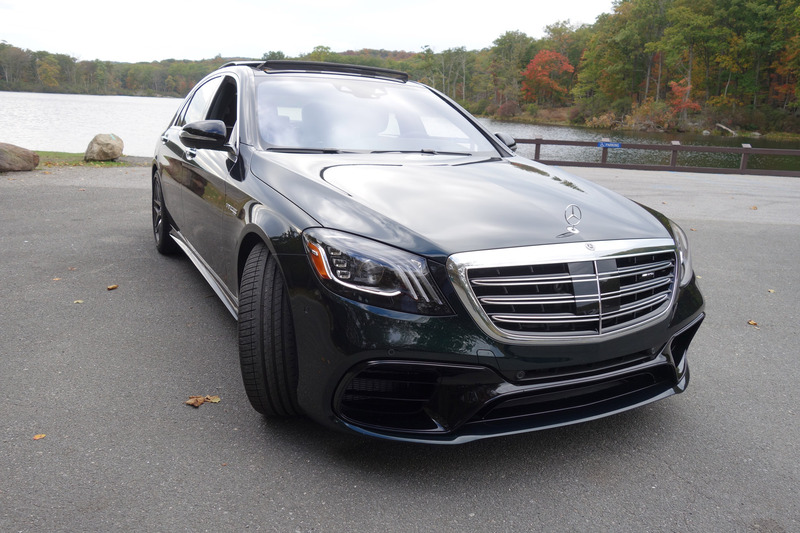 It has a base price of $103,895 and has optional AMG line 20-inch wheels and other goodies that include premium, warmth and comfort, and driver assistance packages that help bring the total up to $134,455. 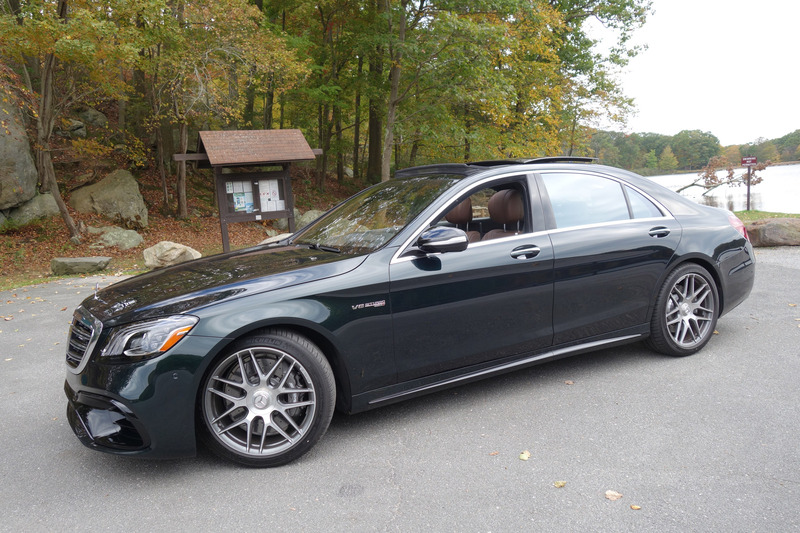 I spent the next hour floating tranquilly up, down, and around Connecticut’s scenic back roads in one of the finest touring automobiles at this price point. 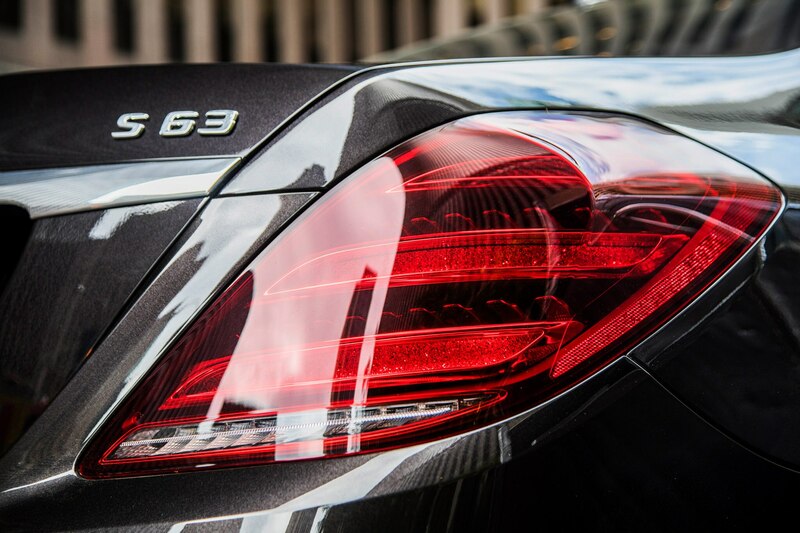 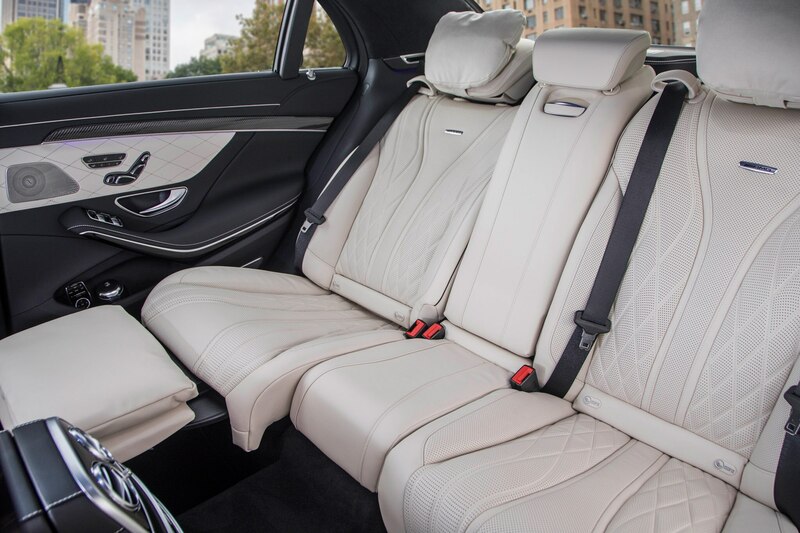 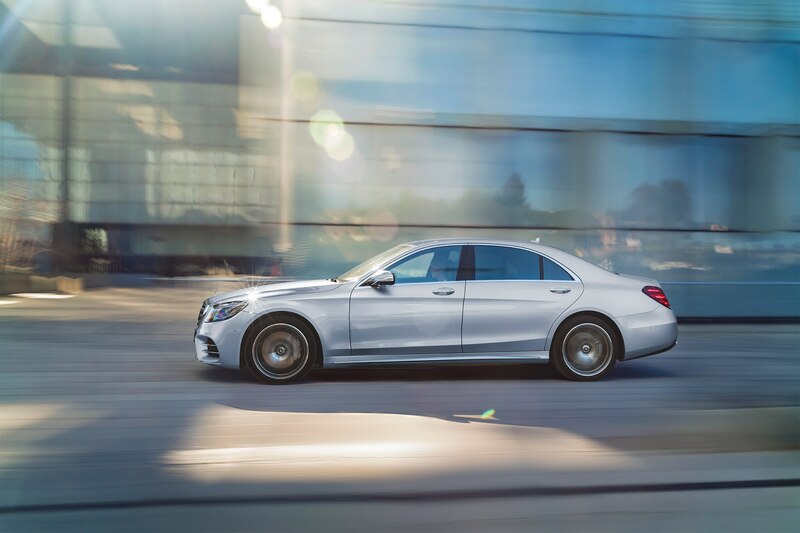 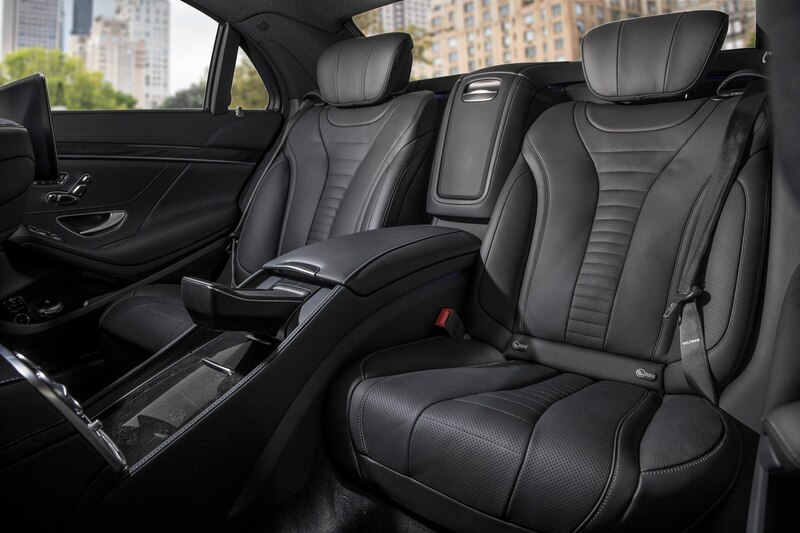 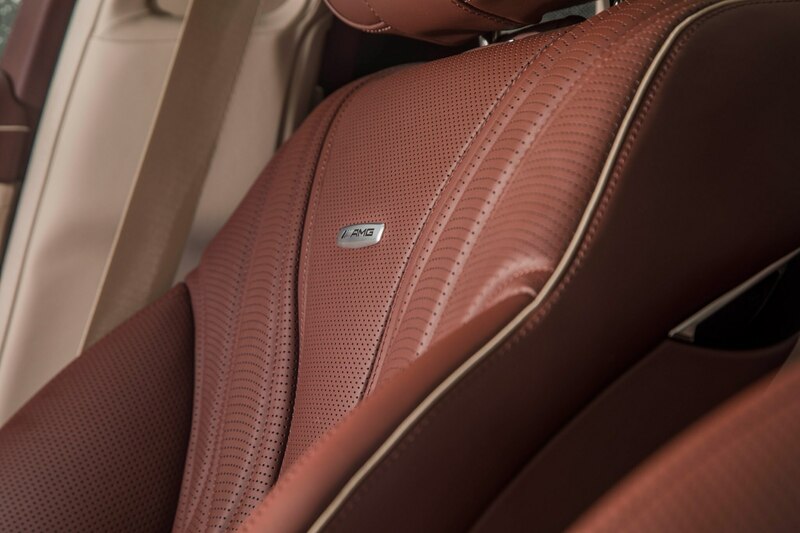 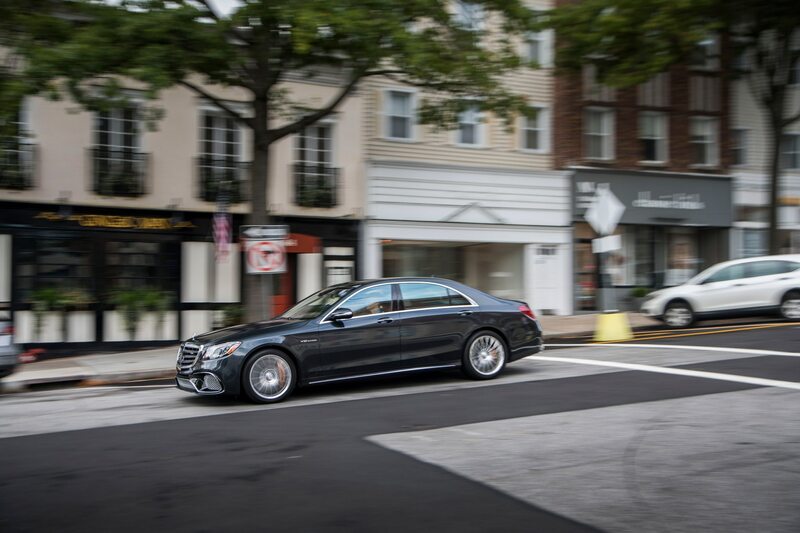 The Mercedes-Benz S560 is the kind of daily driver you can live with and it can most likely take you anywhere in the U.S. with plenty of grace. 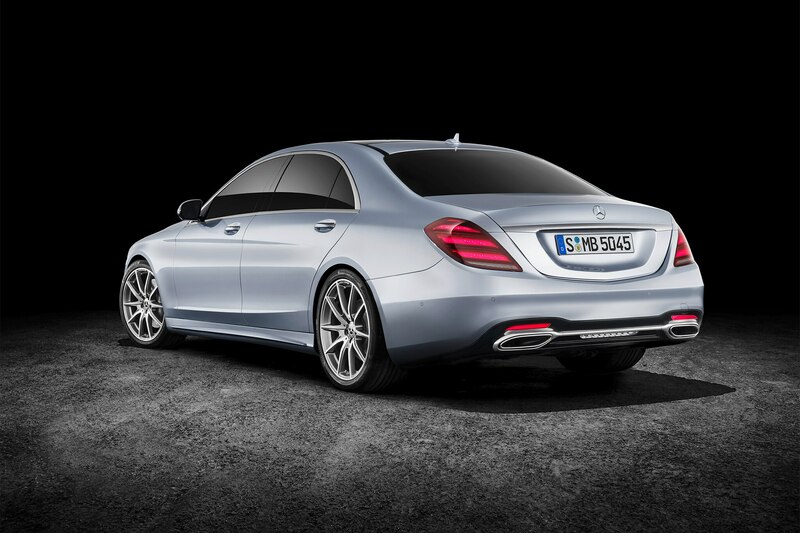 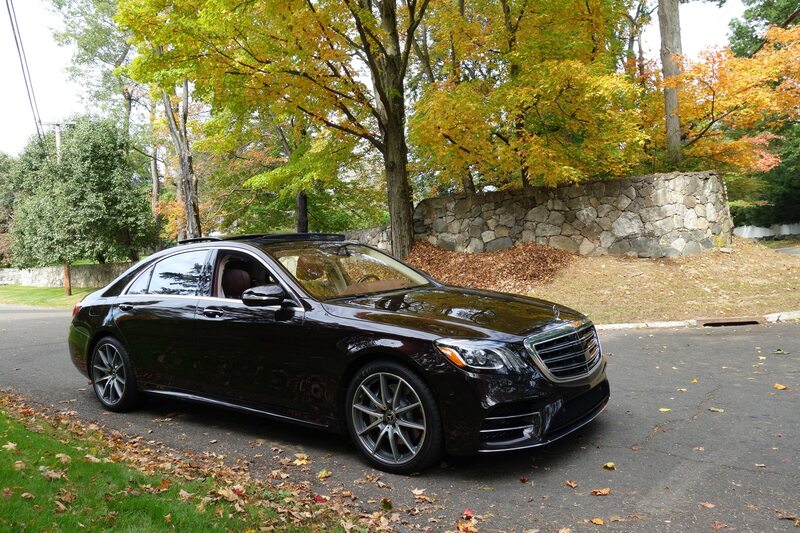 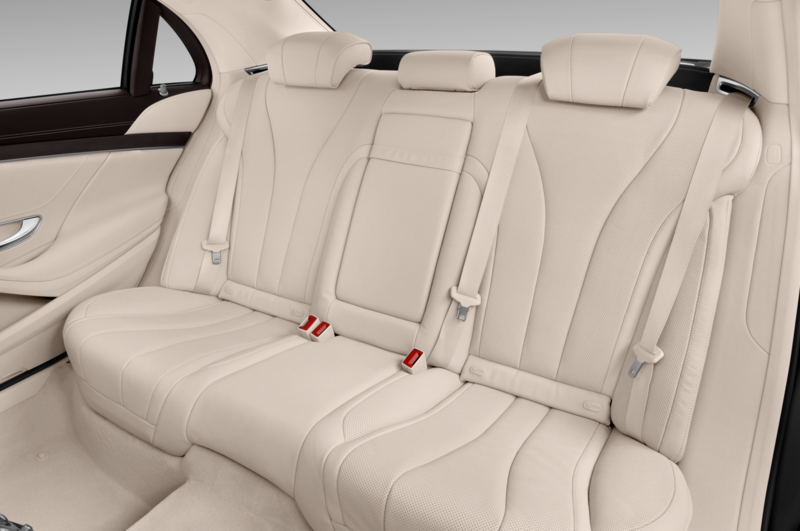 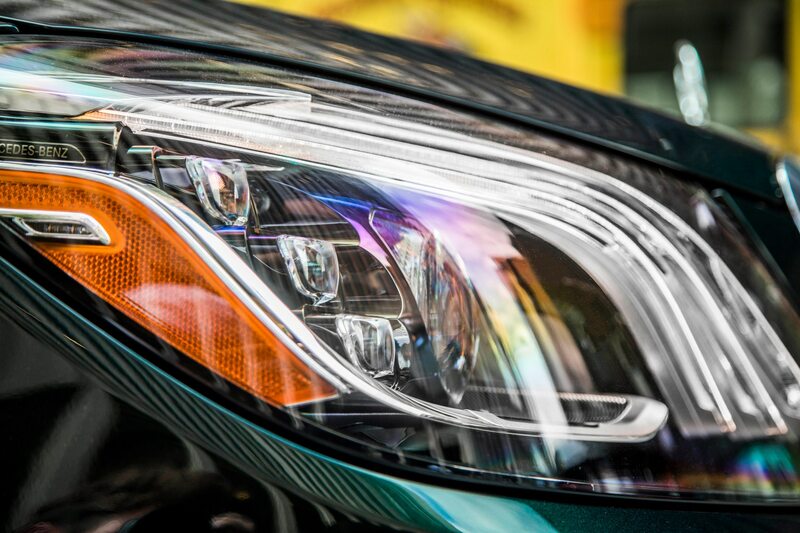 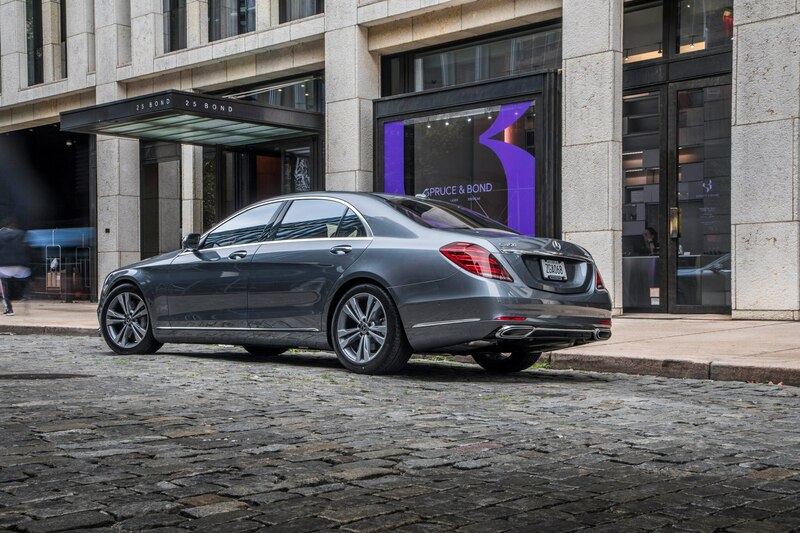 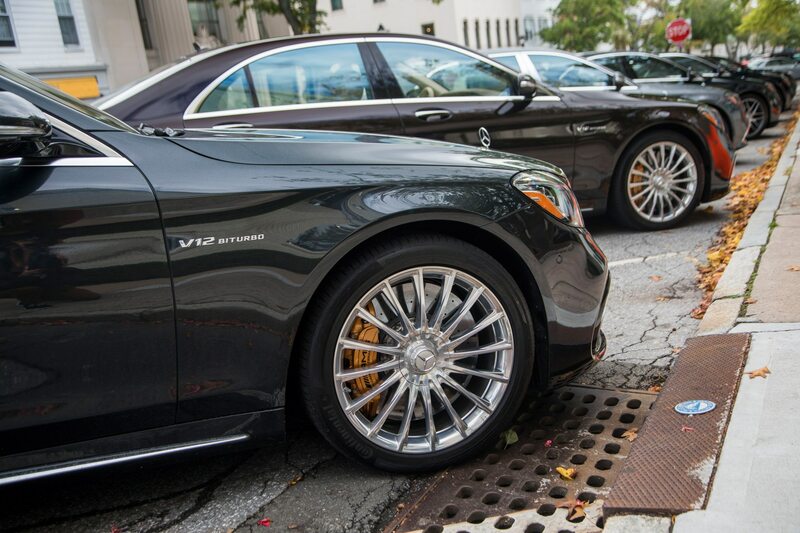 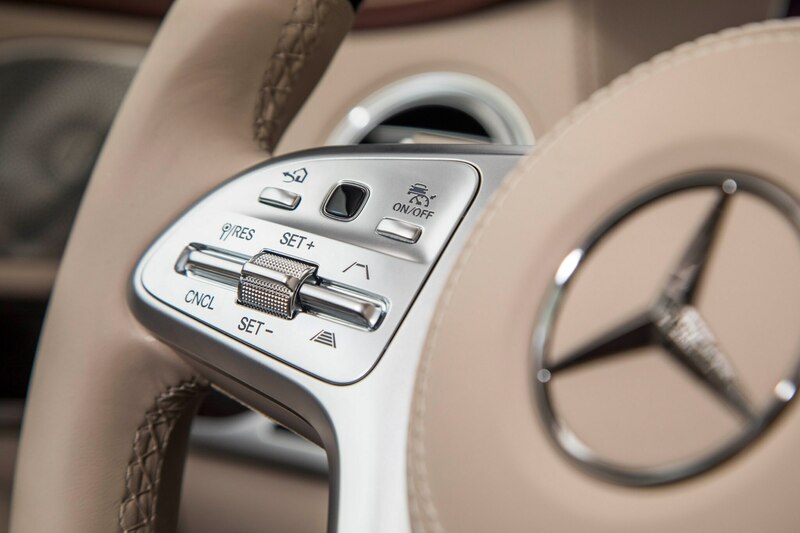 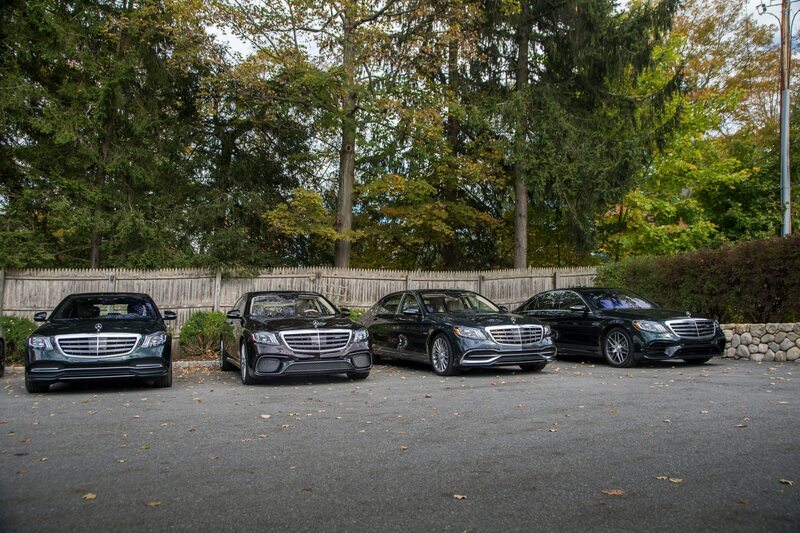 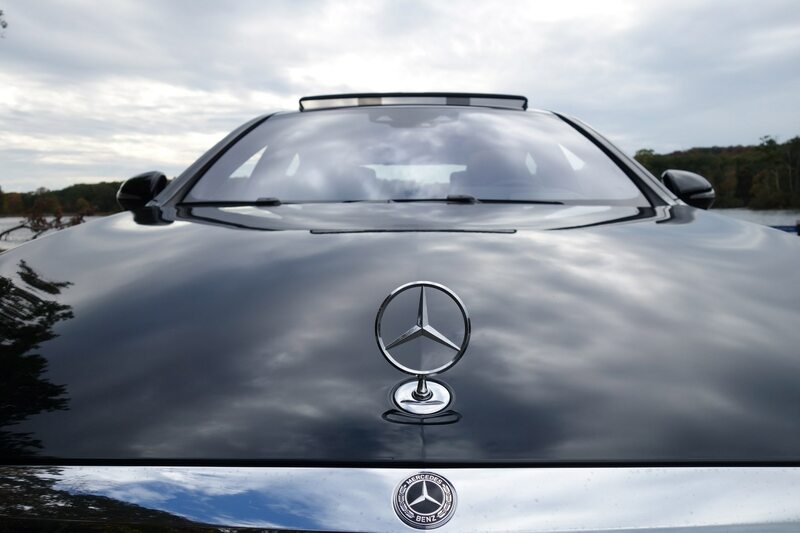 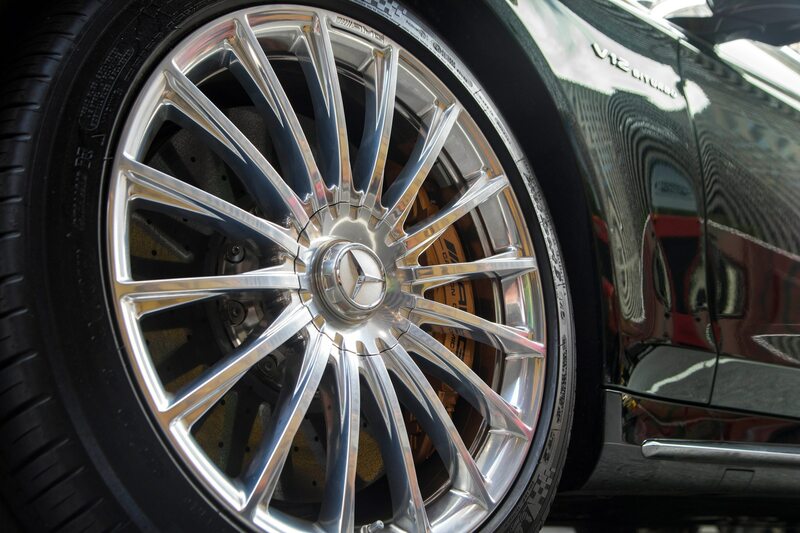 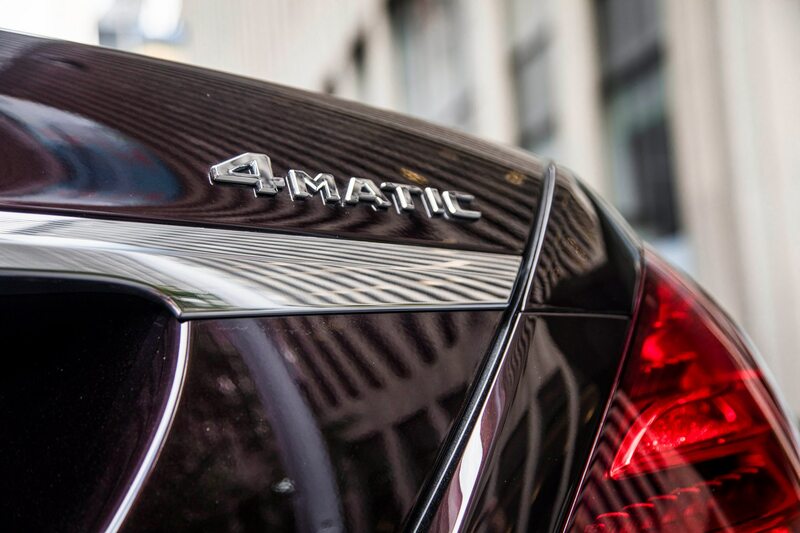 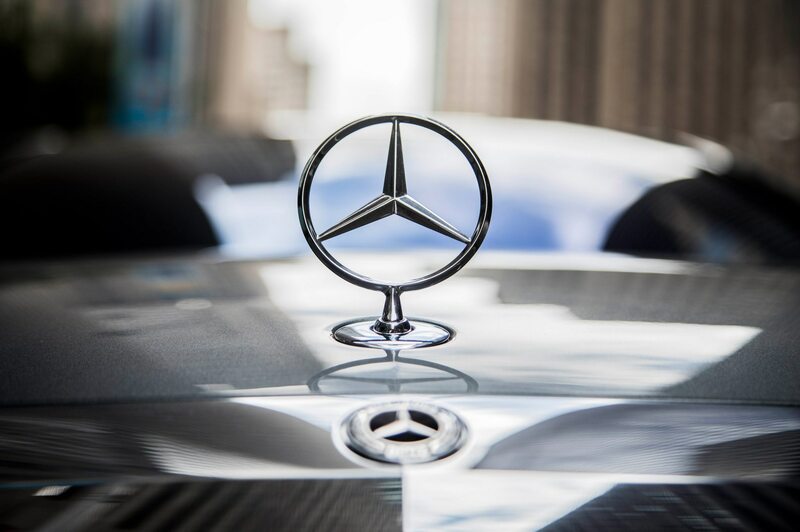 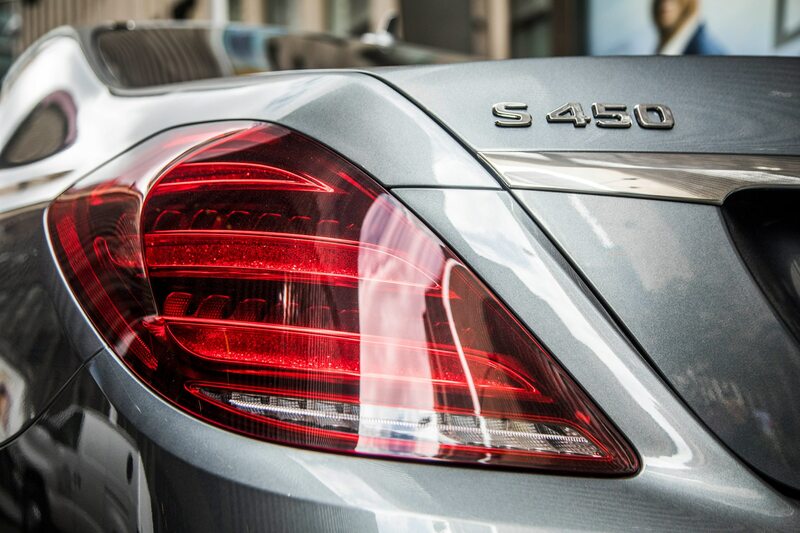 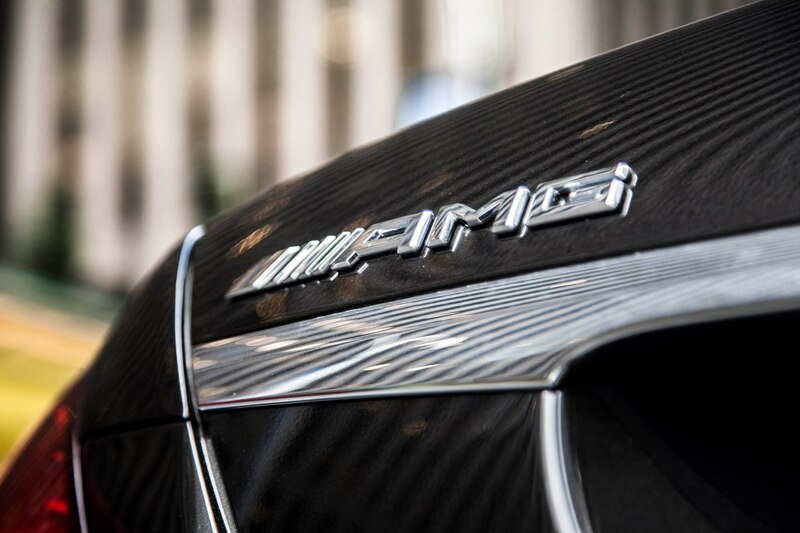 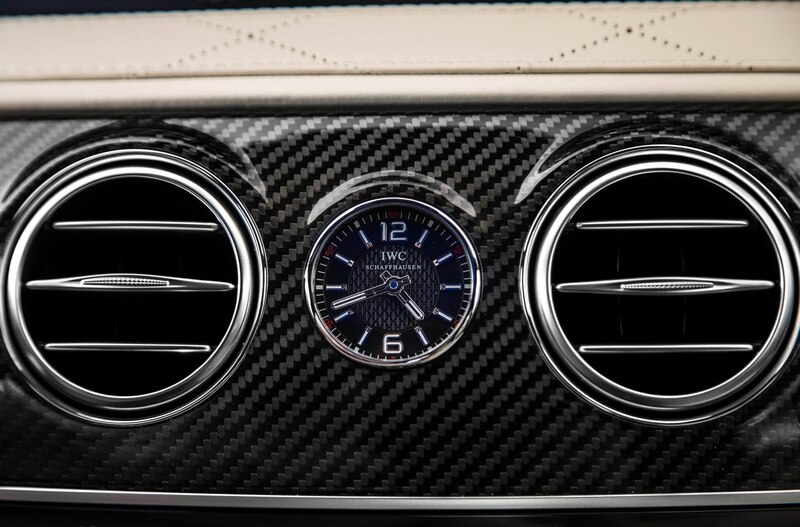 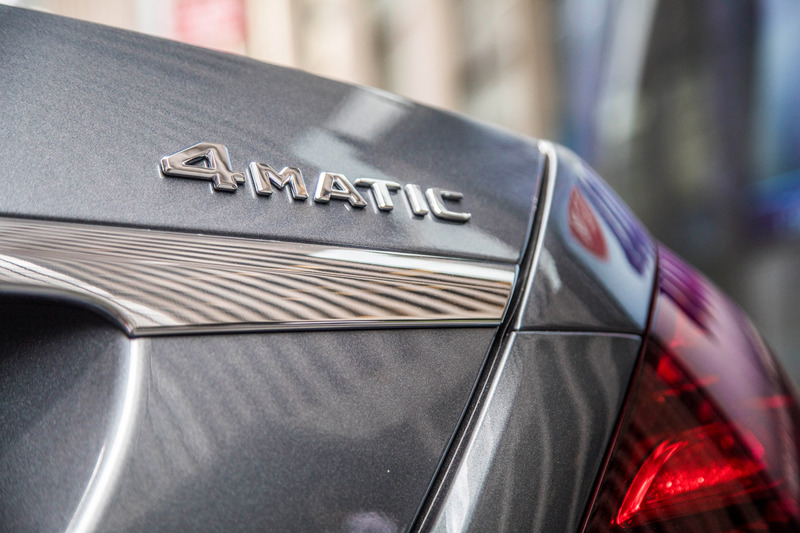 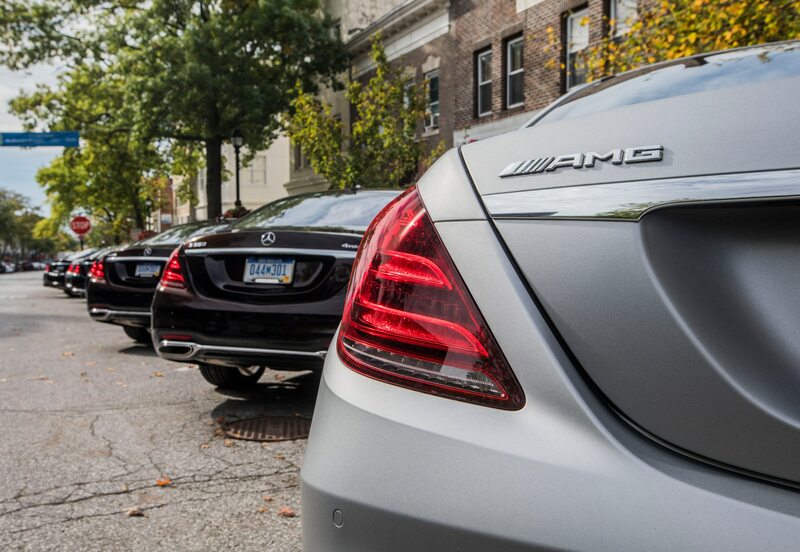 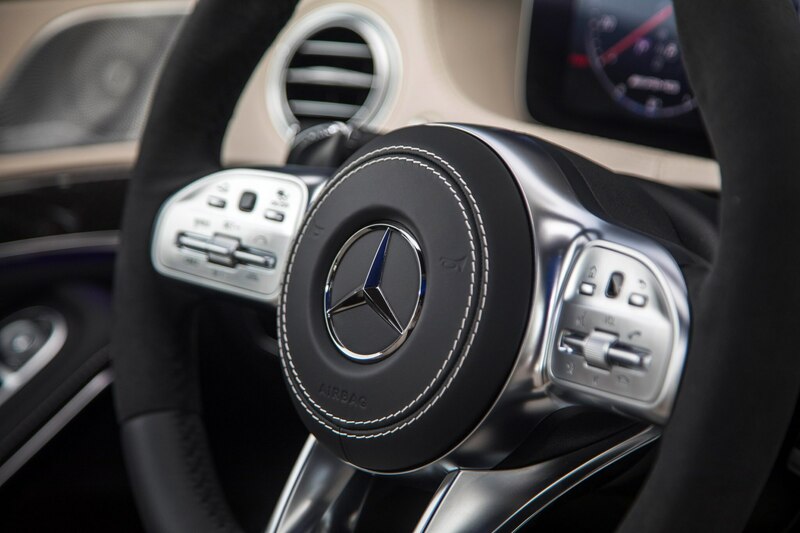 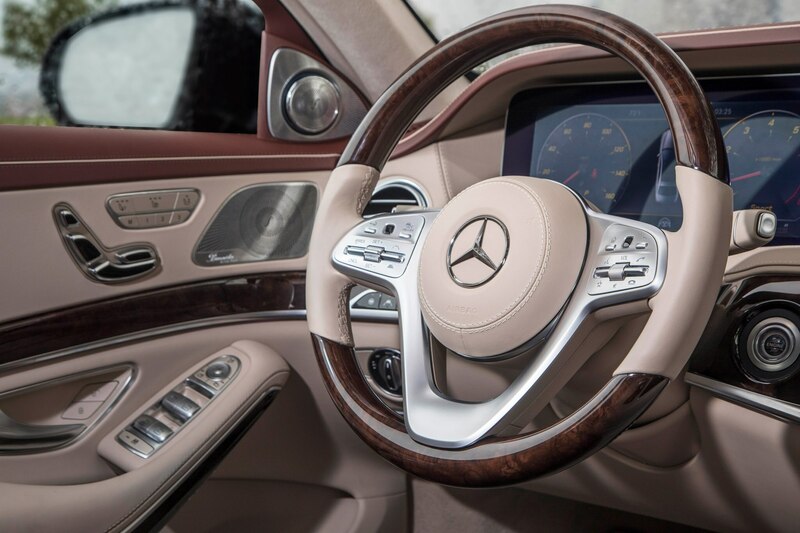 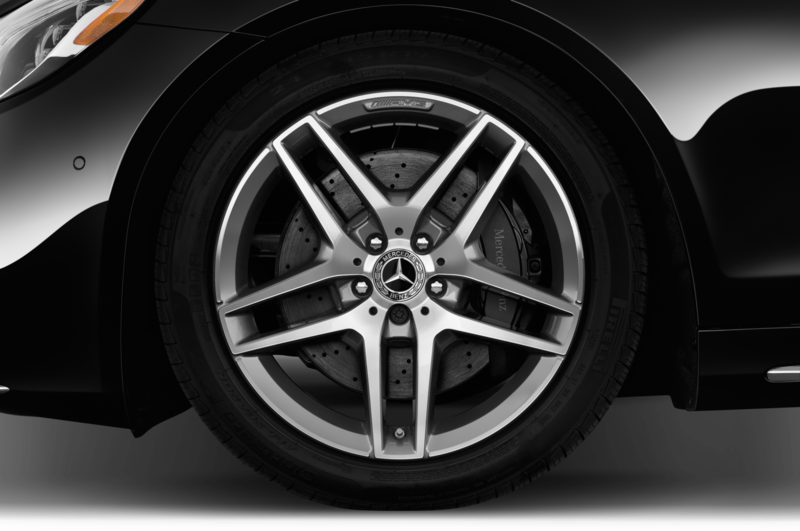 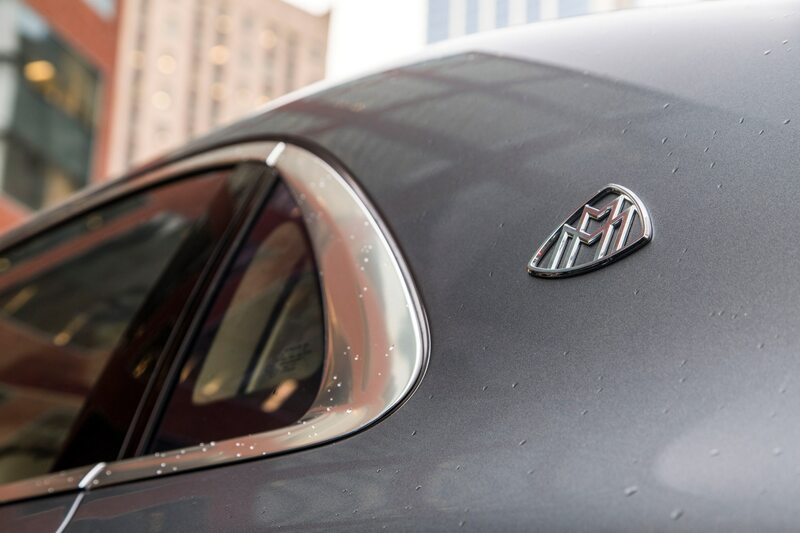 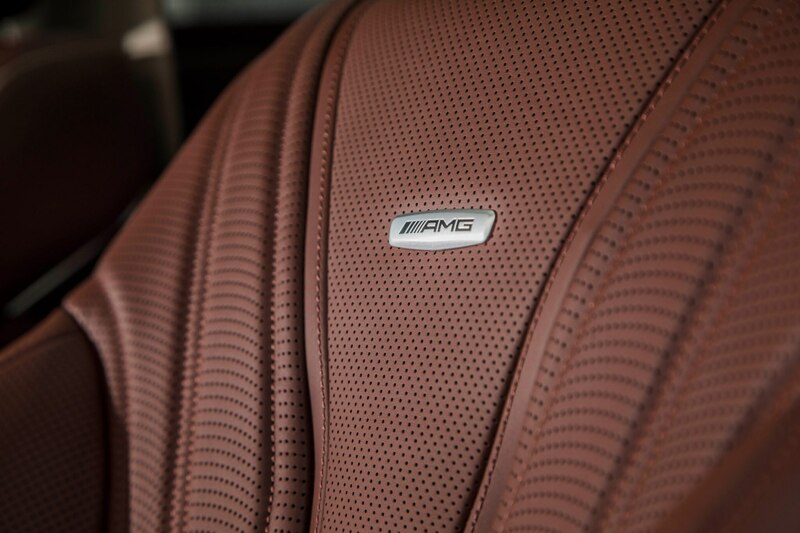 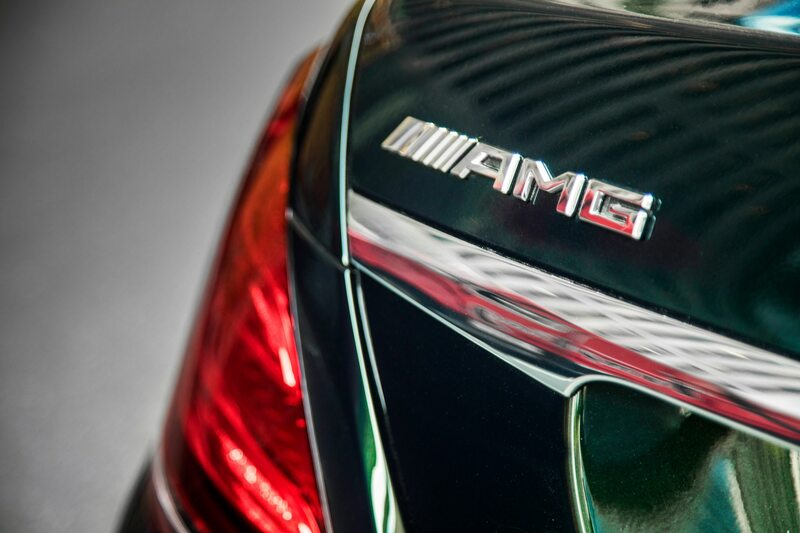 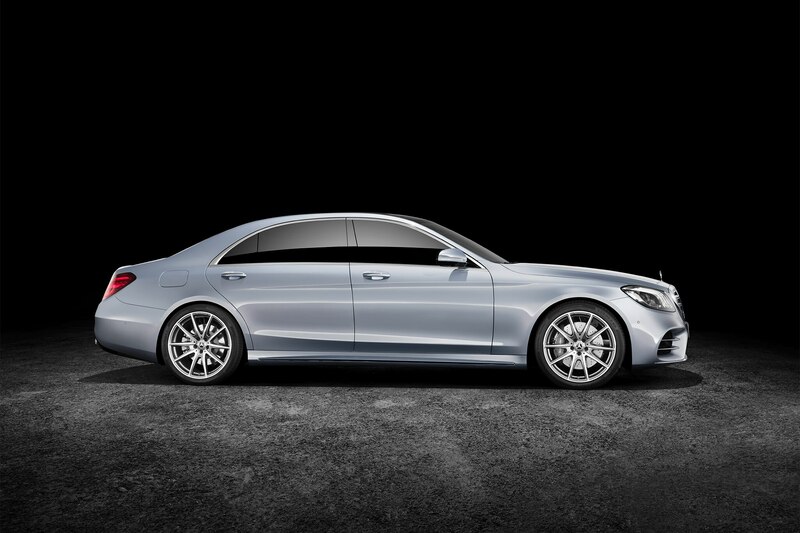 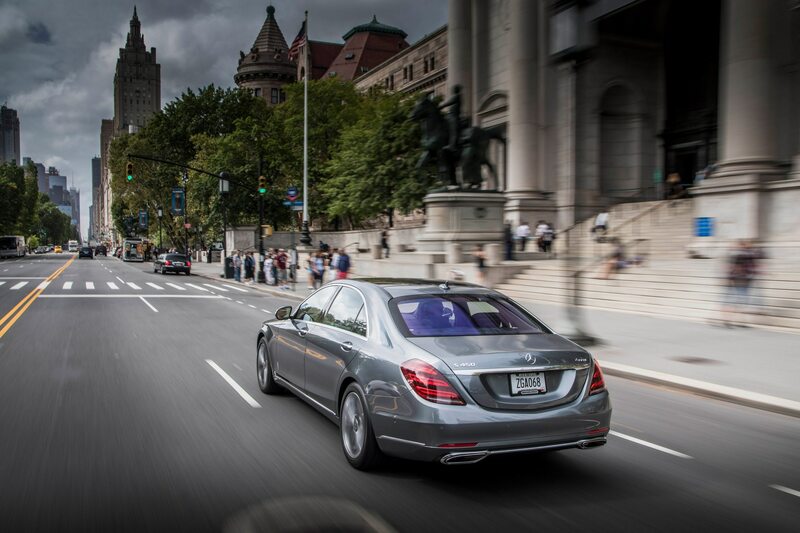 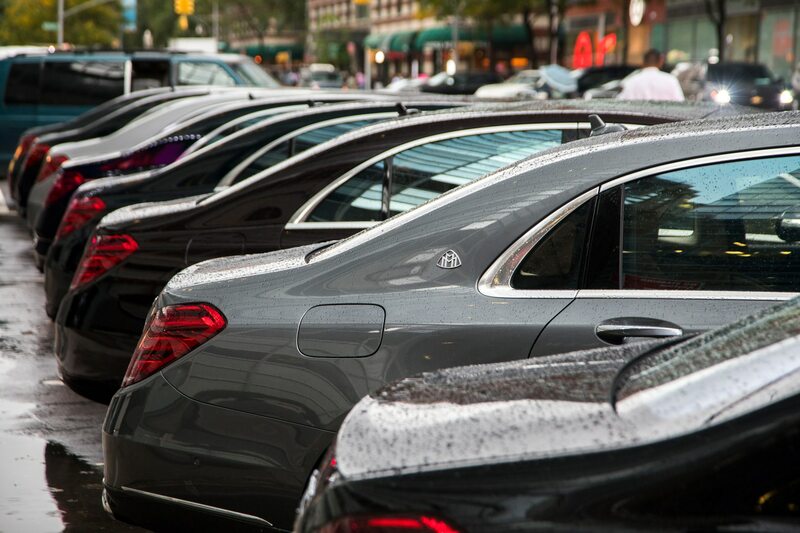 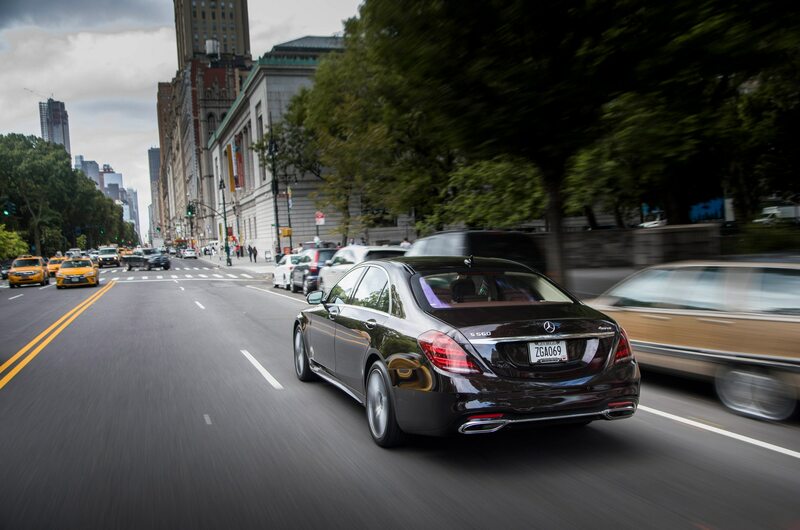 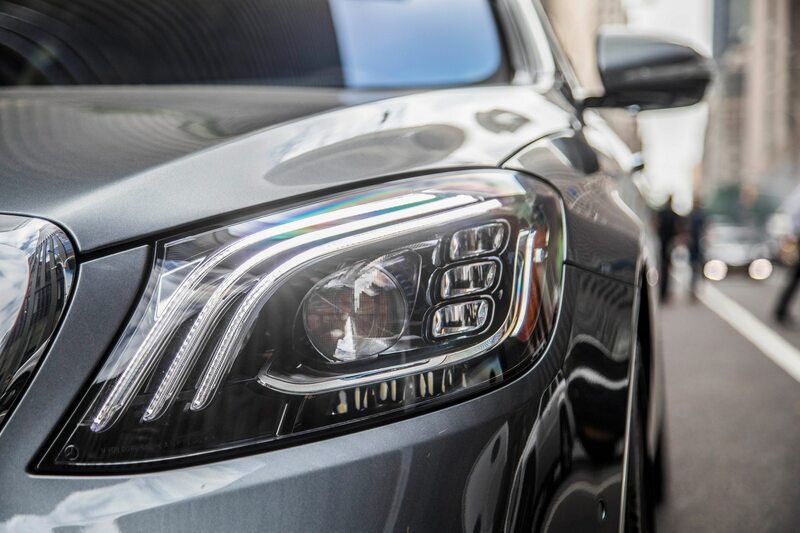 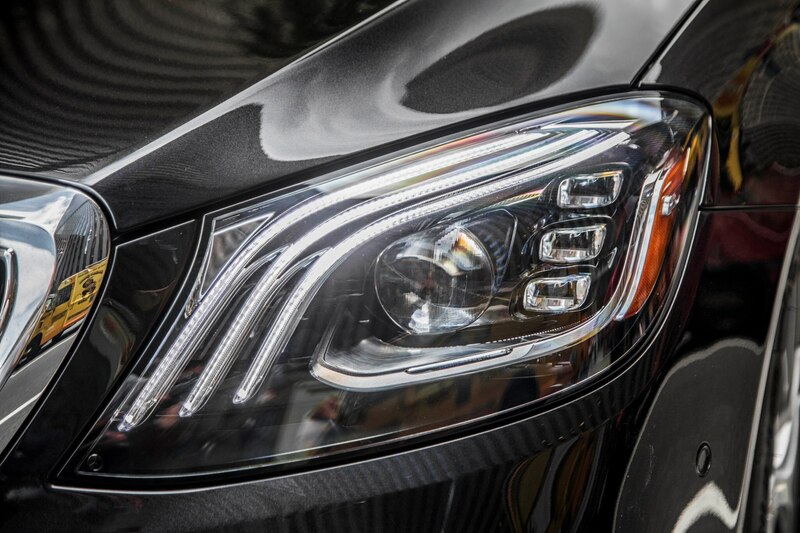 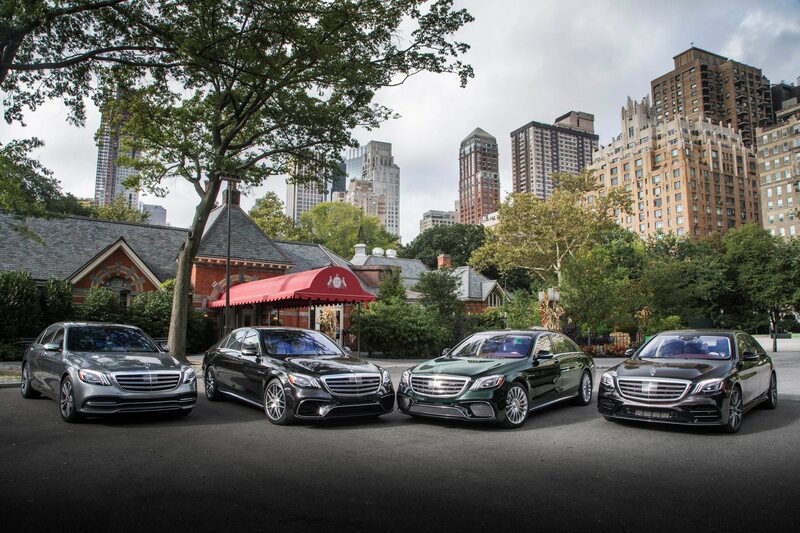 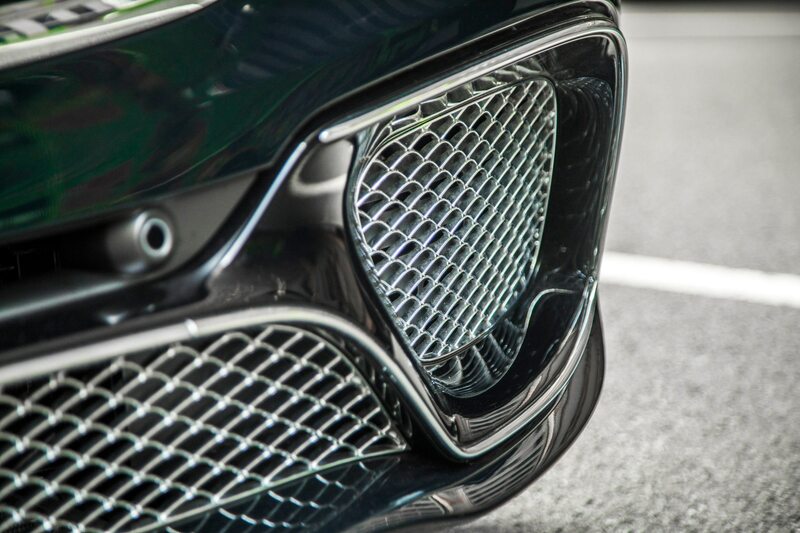 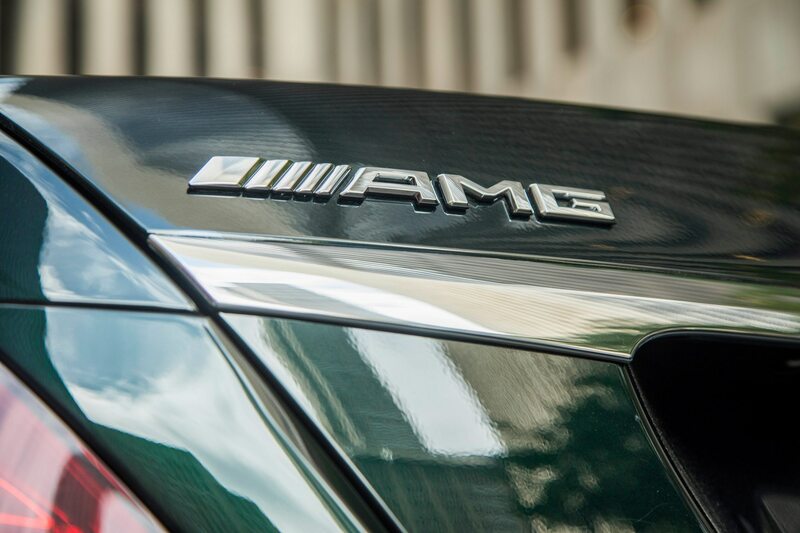 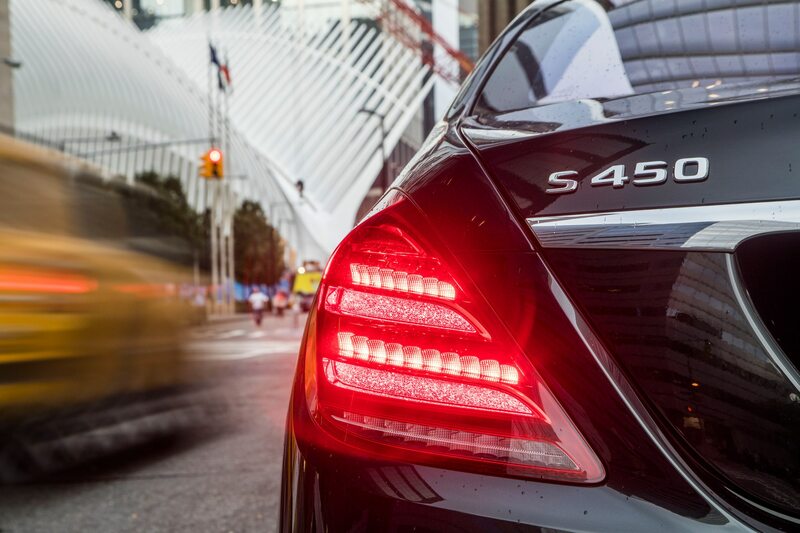 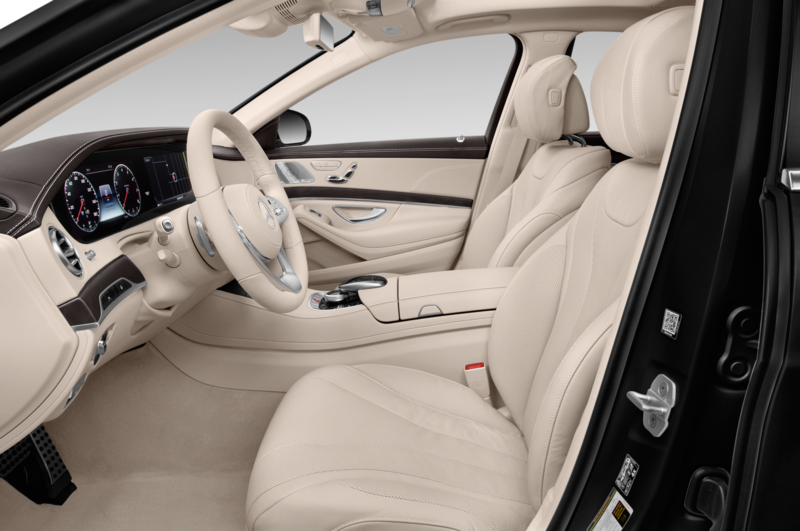 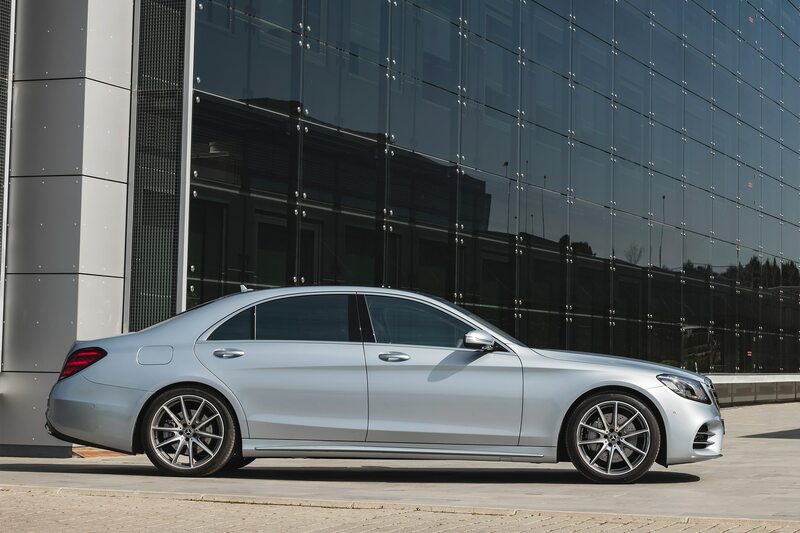 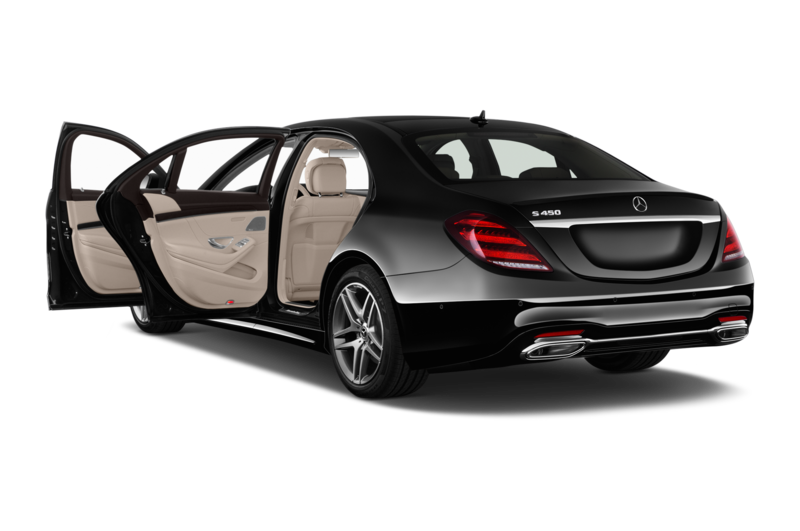 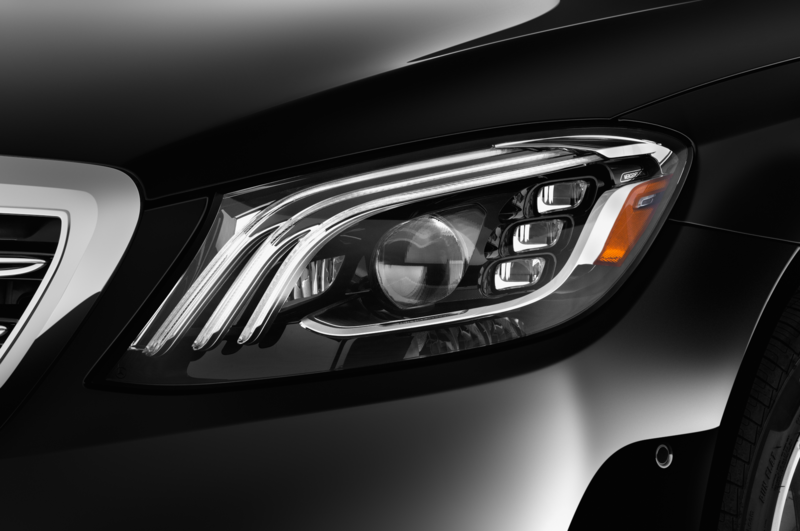 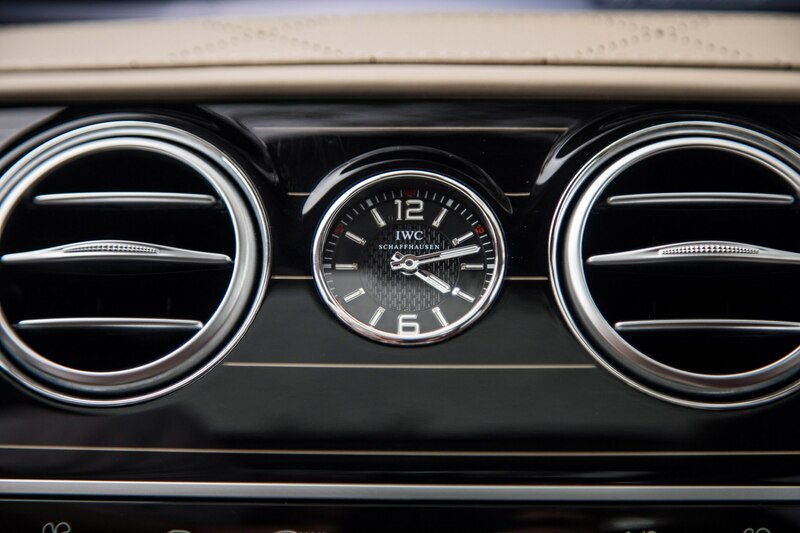 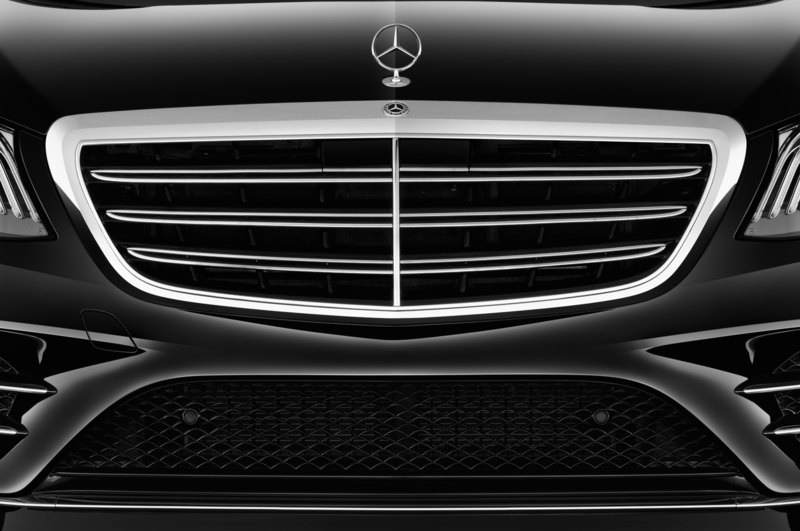 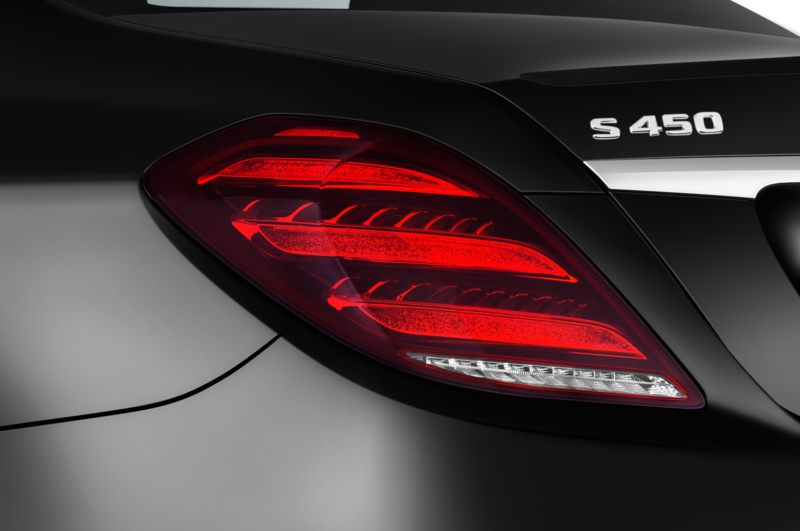 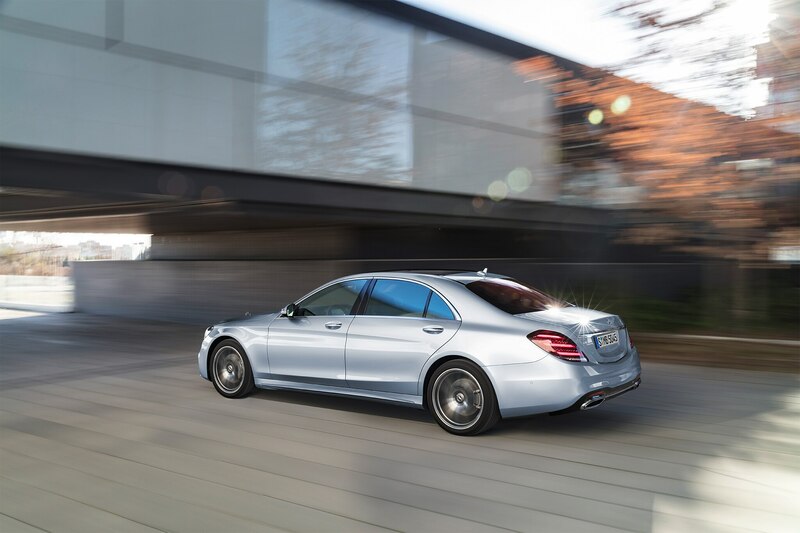 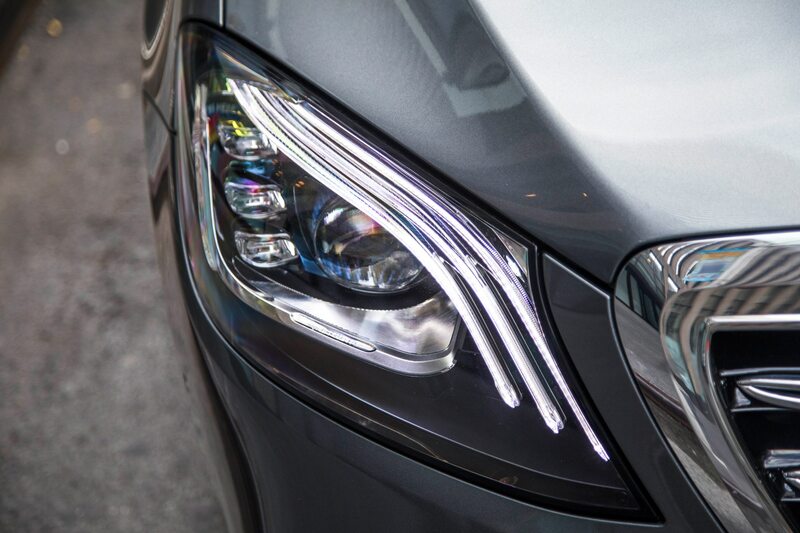 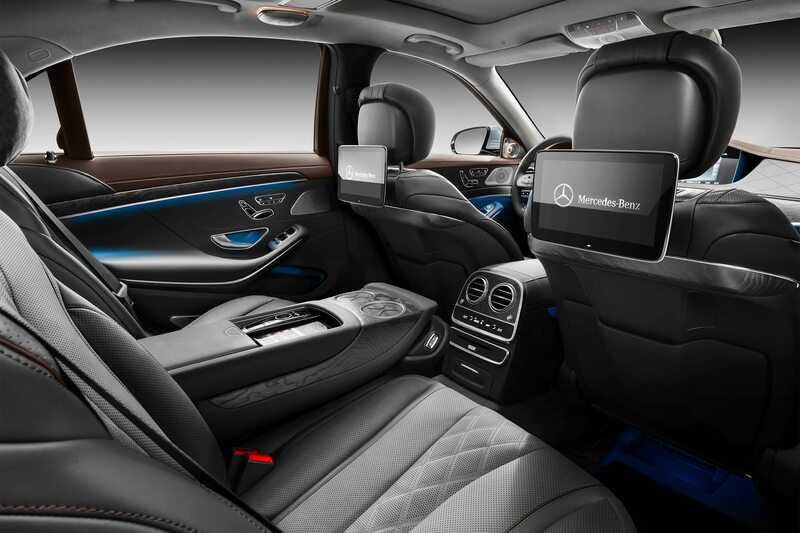 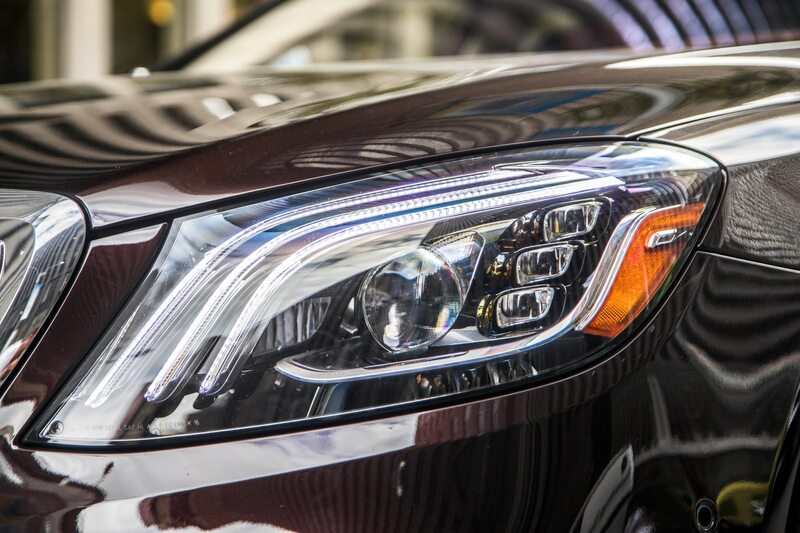 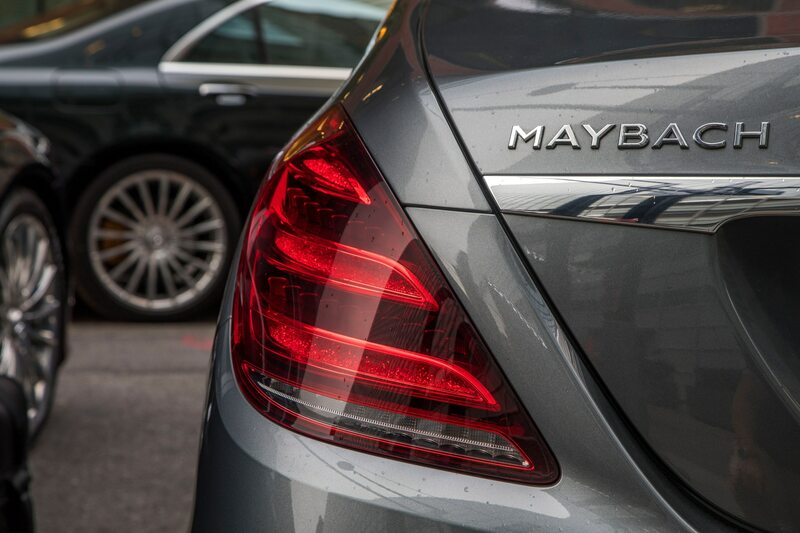 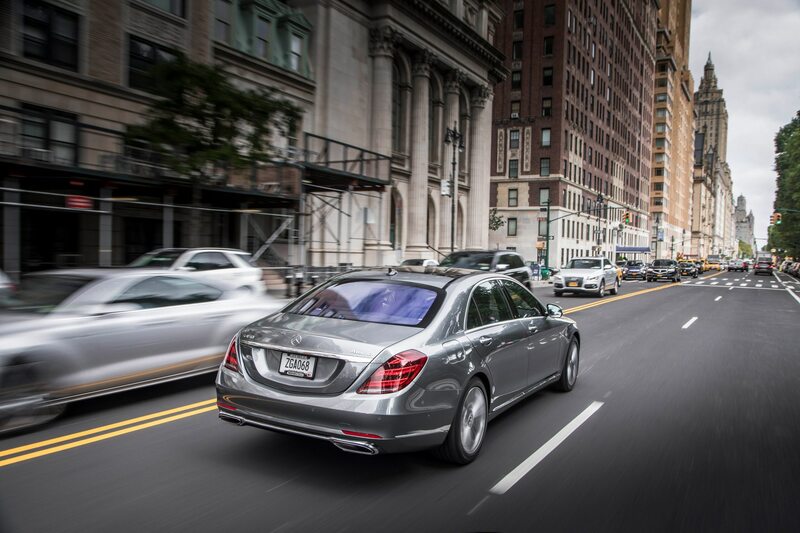 It’s no wonder this flagship model is a bestseller for Benz. 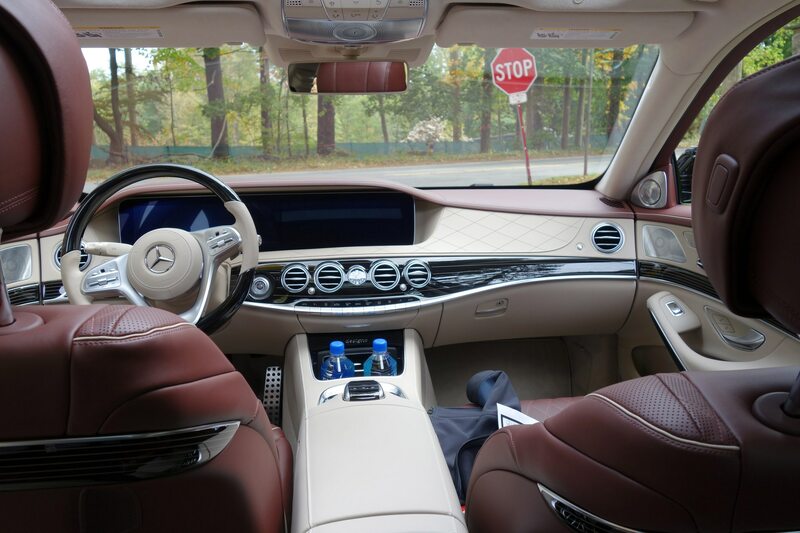 My brief ride from Greenwich to lunch at The Inn at Pound Ridge, New York took just over an hour, but aside from all the leaf peeper scenery, I used the massage functions to work my way through the S560’s multiple massage options while driving. 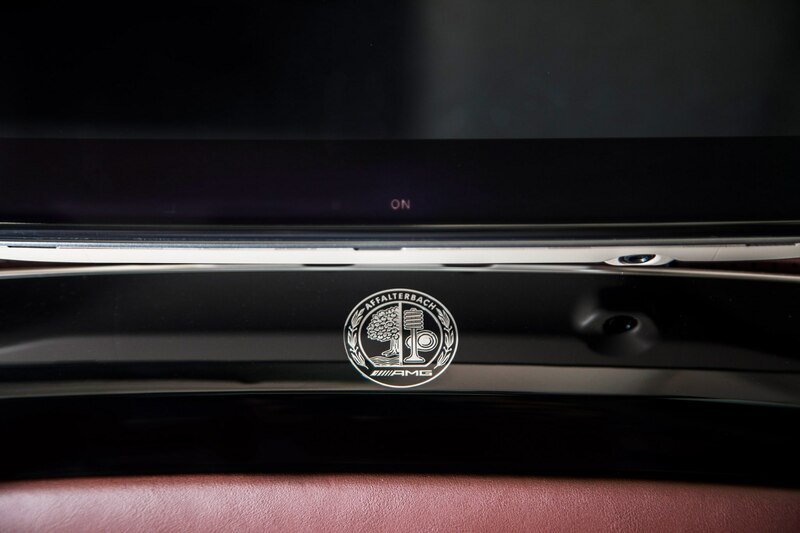 It was wonderful and I wish we had one in our office to fight over. 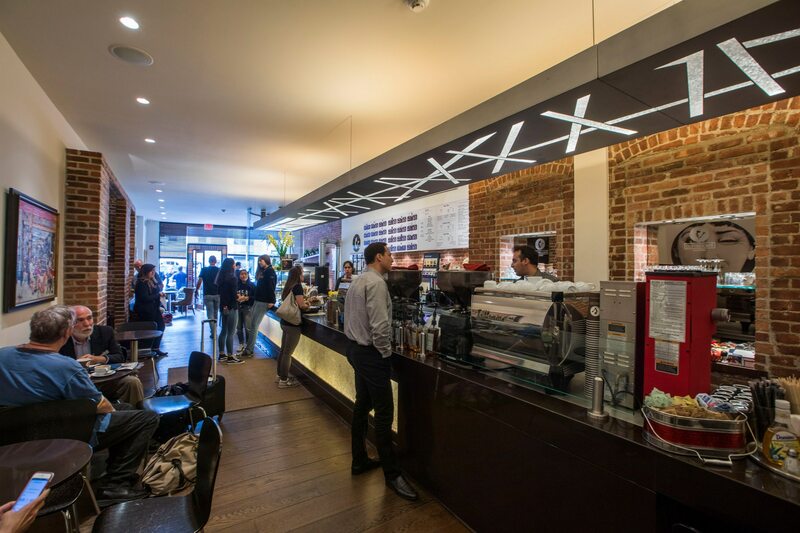 After a steady diet of dirty water dogs and pizza slices in NYC, the shrimp salad at the Jean-Georges eatery was much needed and highly recommended. 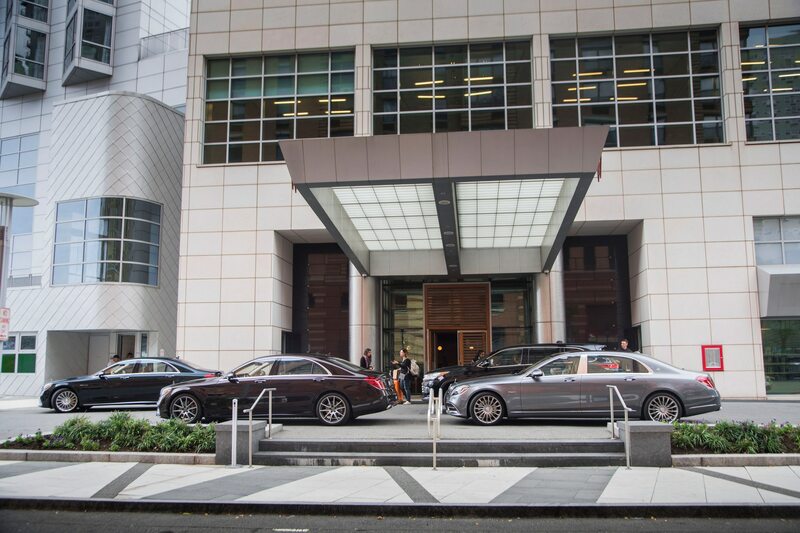 We chatted over lunch with Dieter Exler, Mercedes-Benz USA president and CEO. 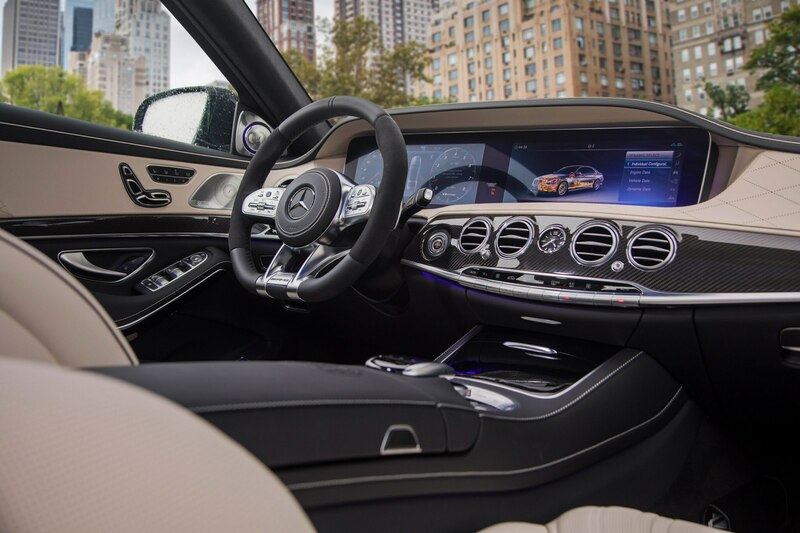 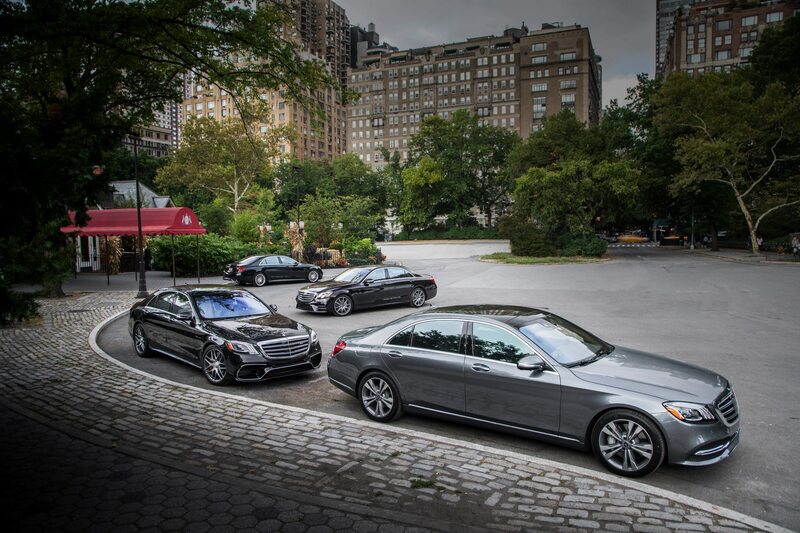 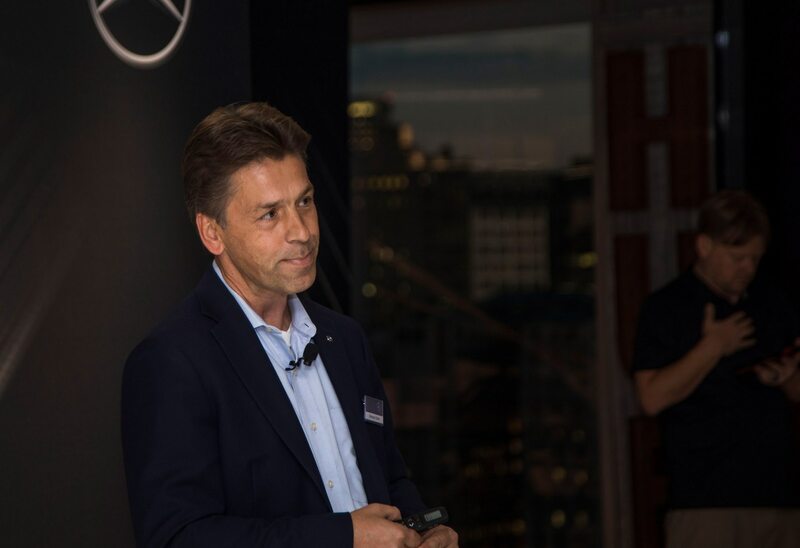 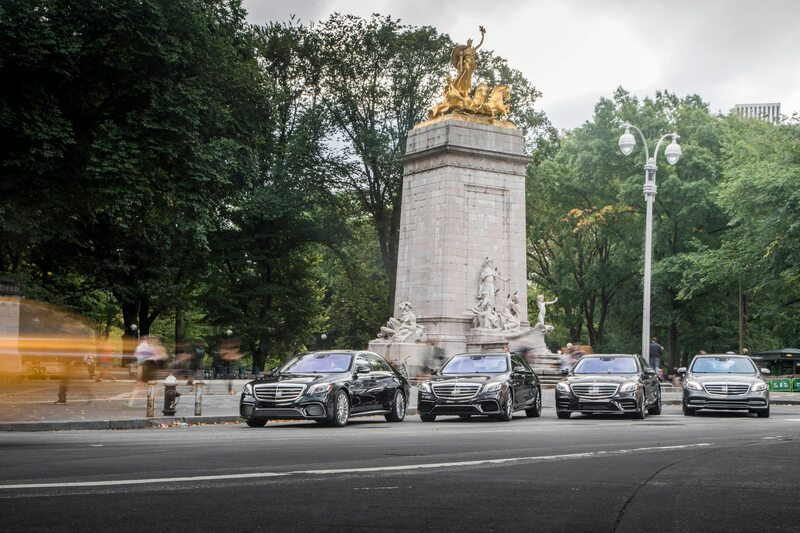 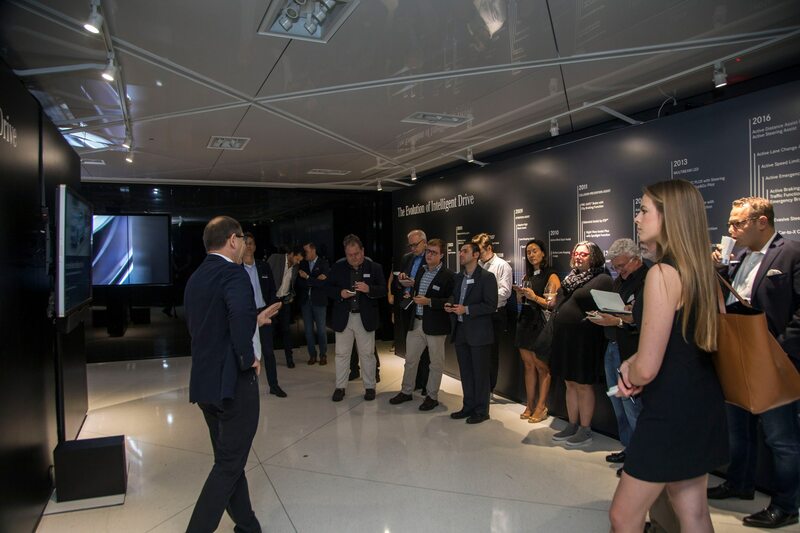 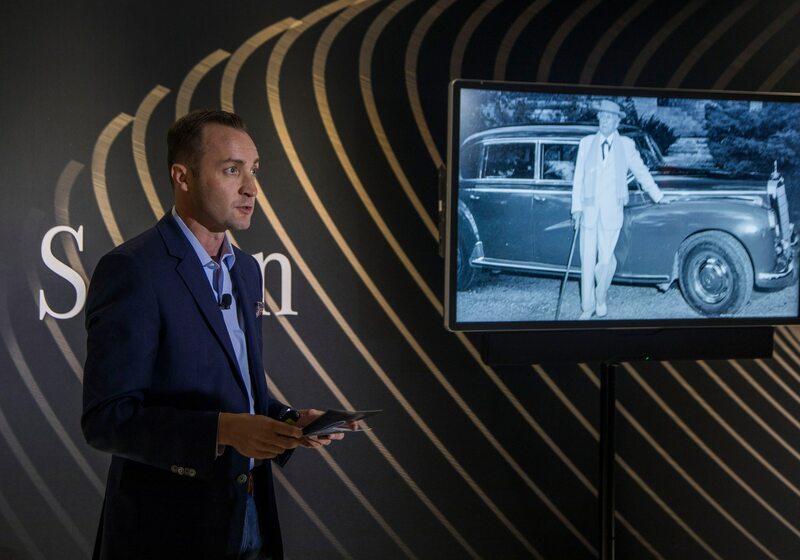 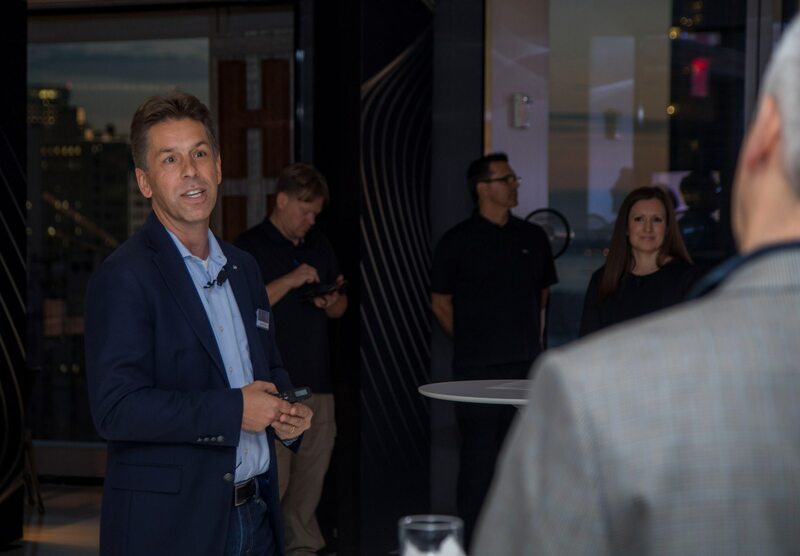 “Customer demand is huge for the S-Class and we sell a ton of them in Manhattan,” Exler told us during an earlier press briefing. 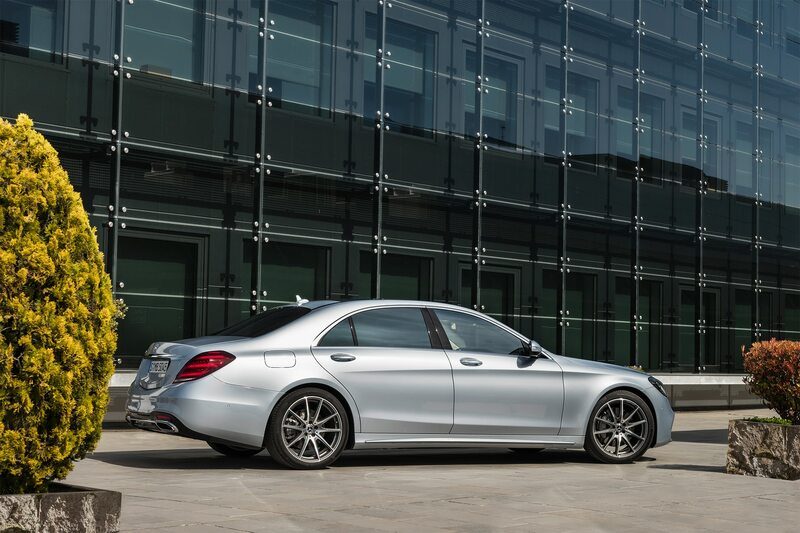 Over 300,000 have been sold in the past four years and four million have been sold since 1972. 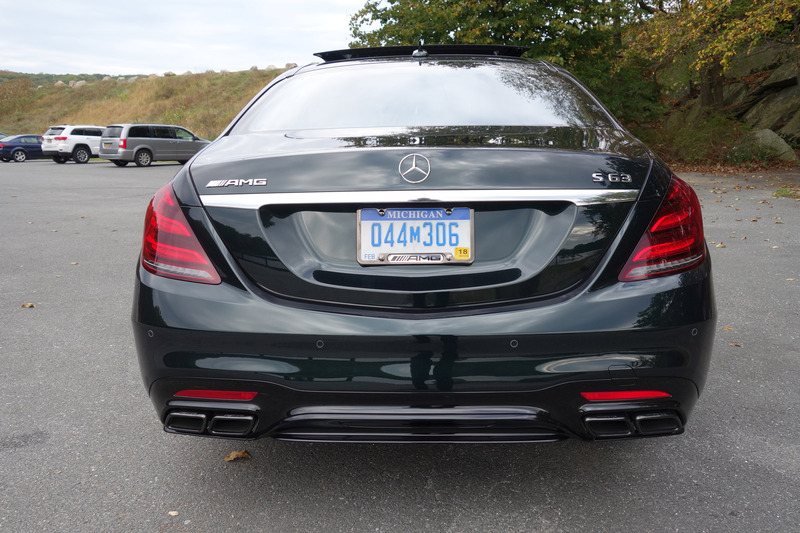 After dessert, I’m tempted to hang on to the S560, but switch to a 2018 Mercedes-AMG S63 for the last leg of our trip from New York State to Northern New Jersey. 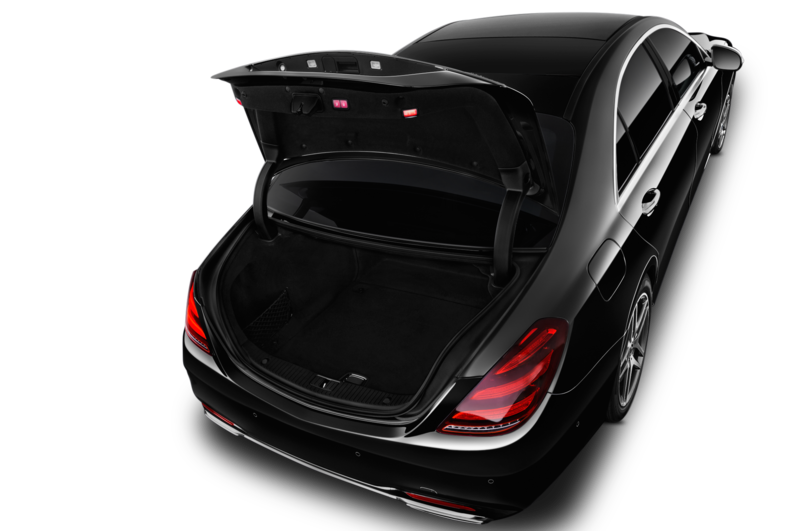 Recently, we had a sporty S63 in matte black paint around the office that was a blast to drive, though I heard a few complaints about rear passenger space from friends as I chauffeured them around Southern California. 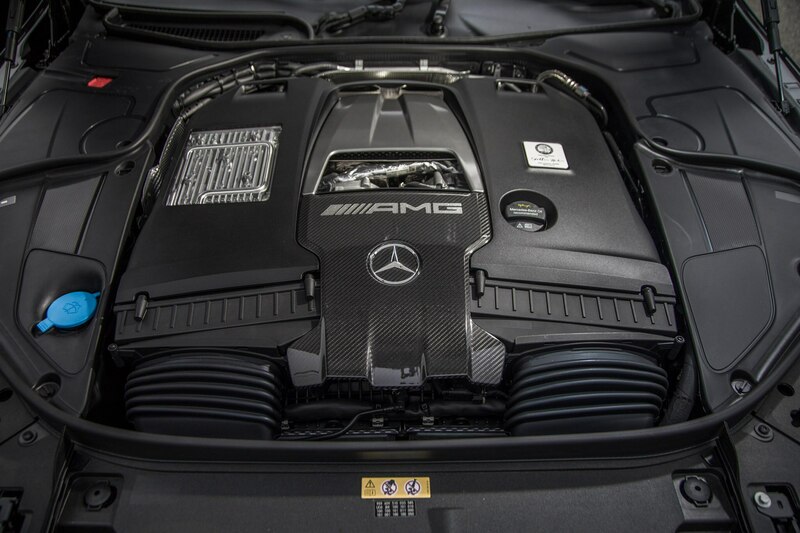 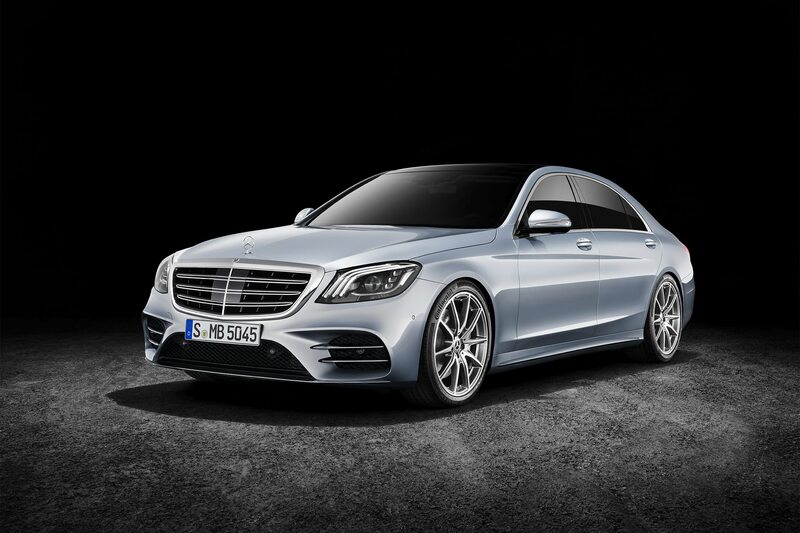 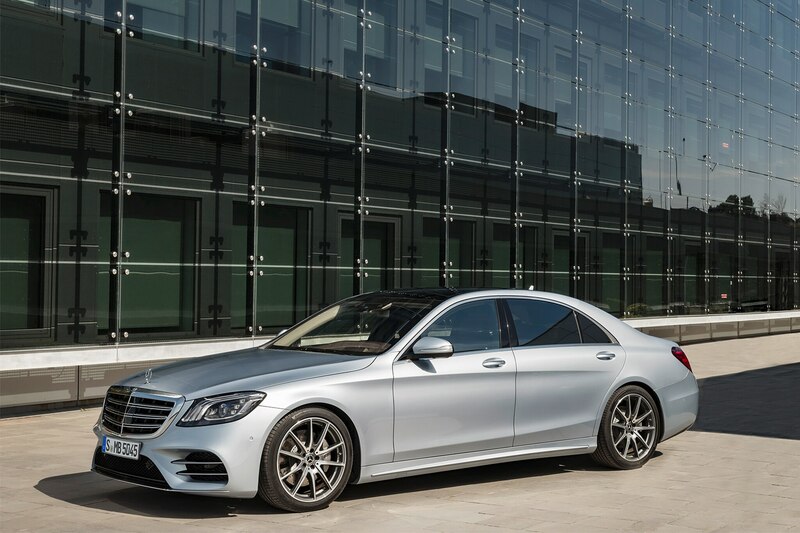 The Mercedes-AMG S63 Sedan tested here packed a 4.0-liter engine with 603 horsepower and 664 lb-ft of torque. 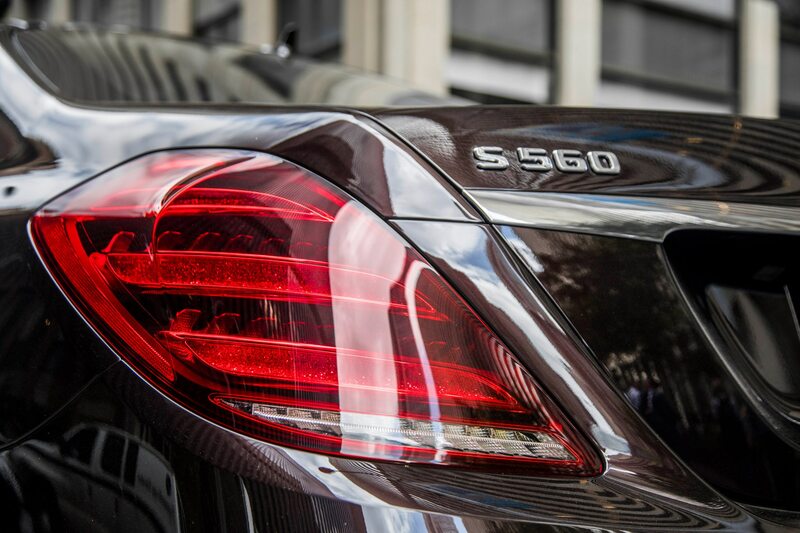 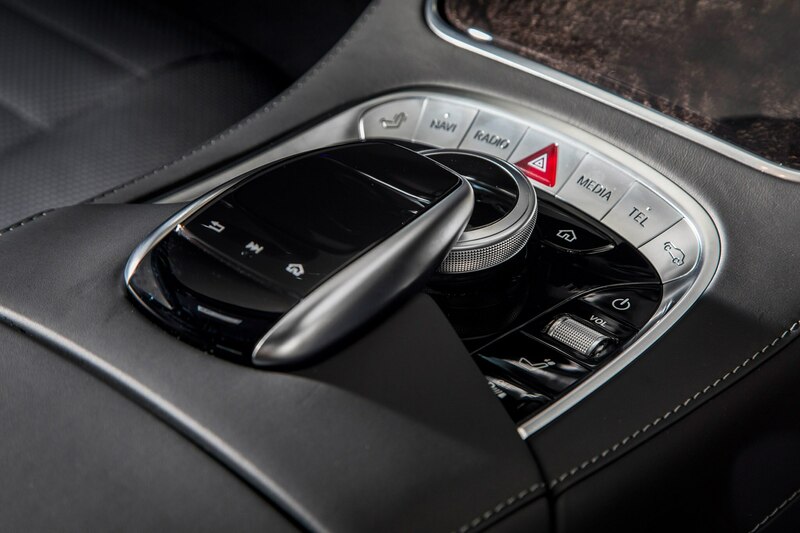 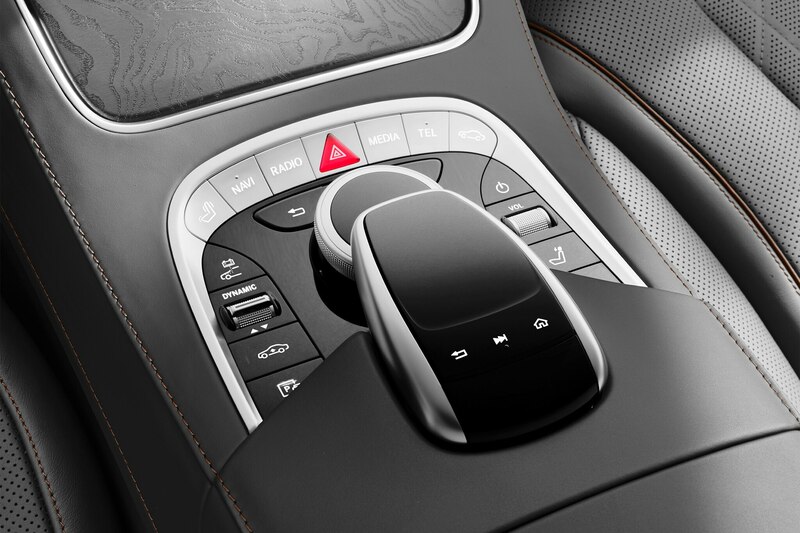 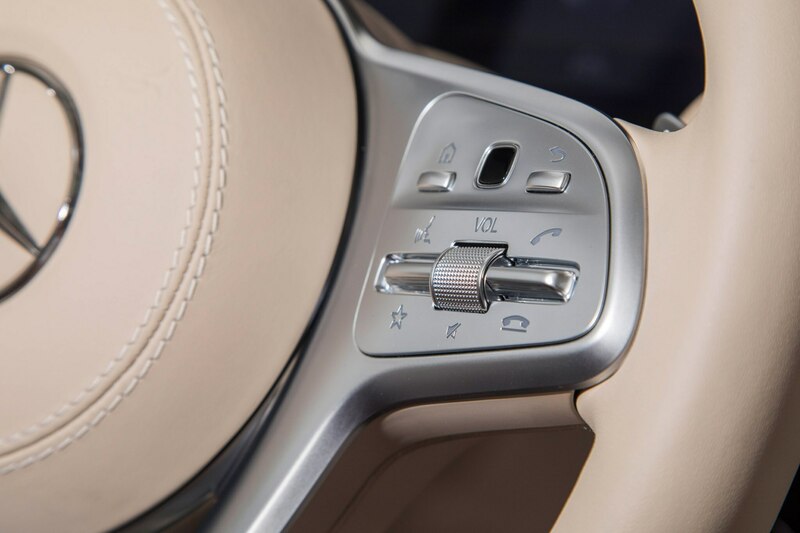 It’s mated to a nine-speed automatic transmission like the 560S. 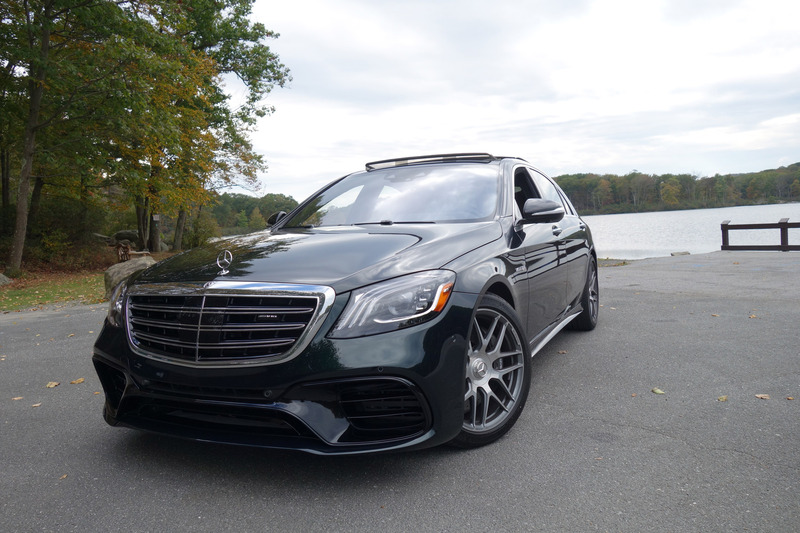 It’s a fun ride that will scoot you from 0-60 mph in 3.4 seconds, but it seems like overkill for such a big long, sedan of its size and class. 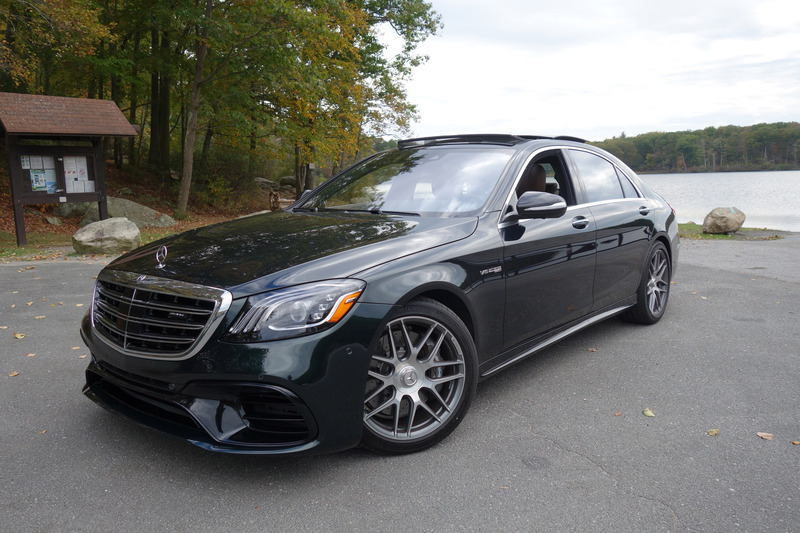 The S63 has a base price of $148,495, but our tester, which is also in Emerald Green Metallic, had optional equipment that brings it up to $178,845. 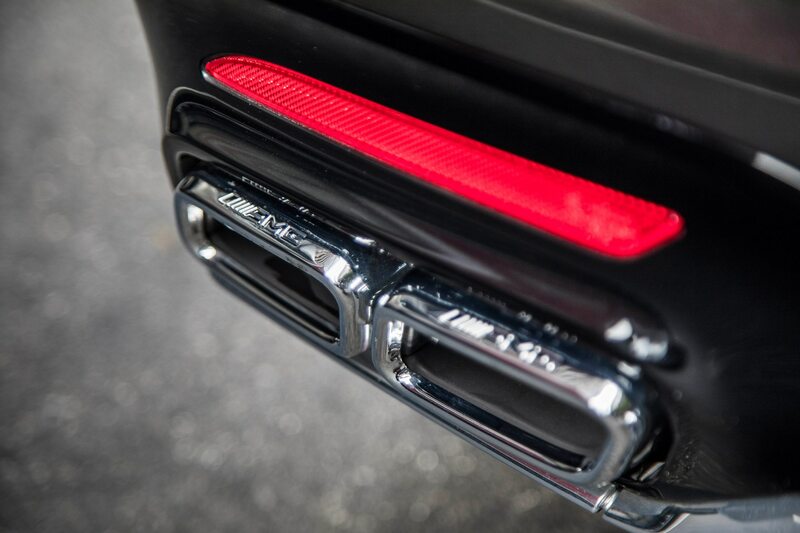 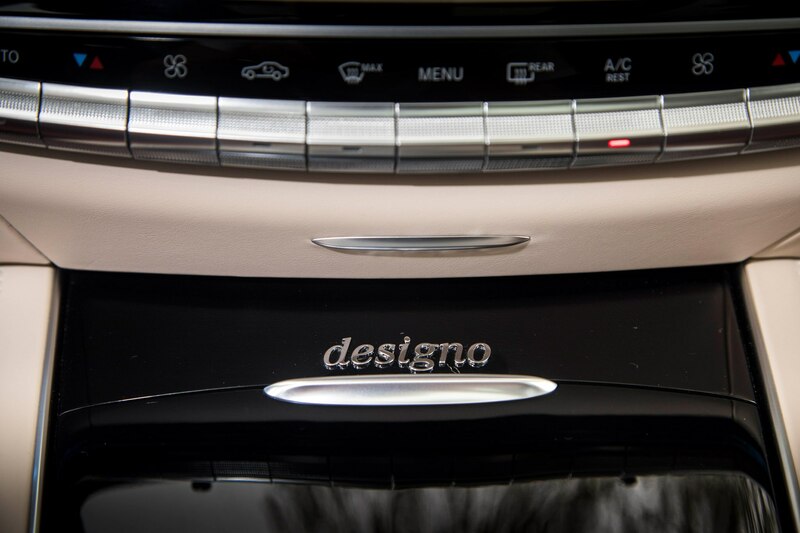 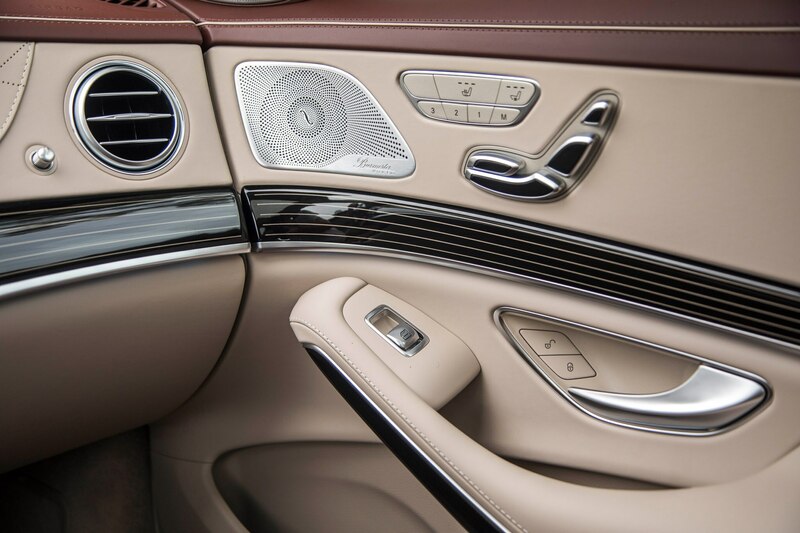 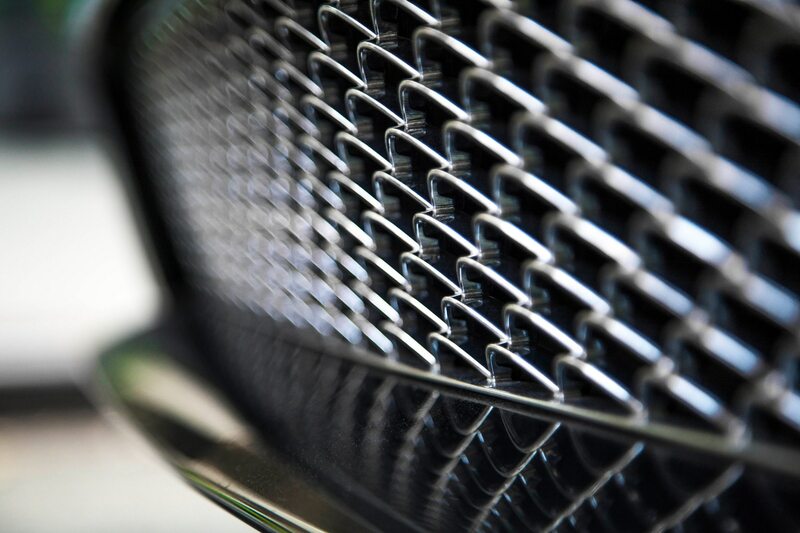 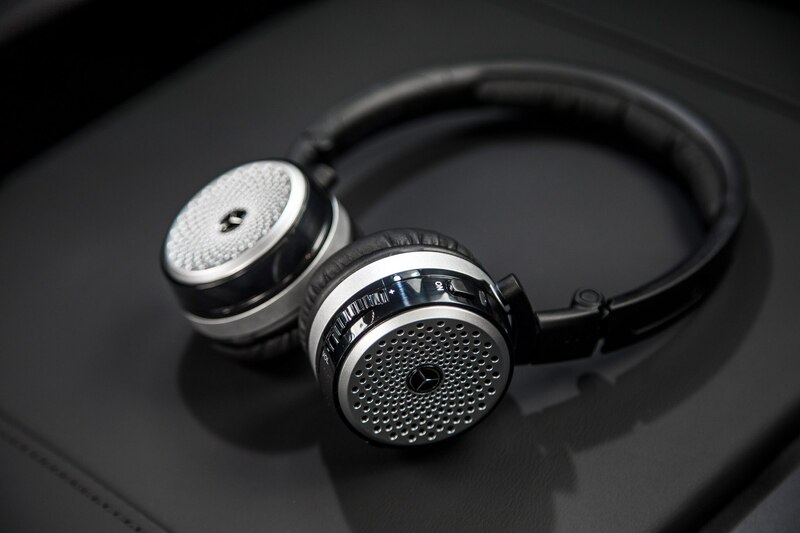 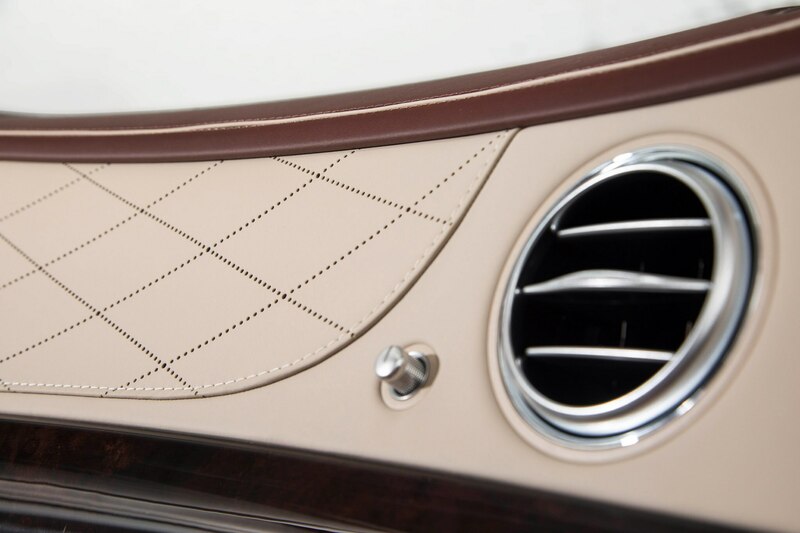 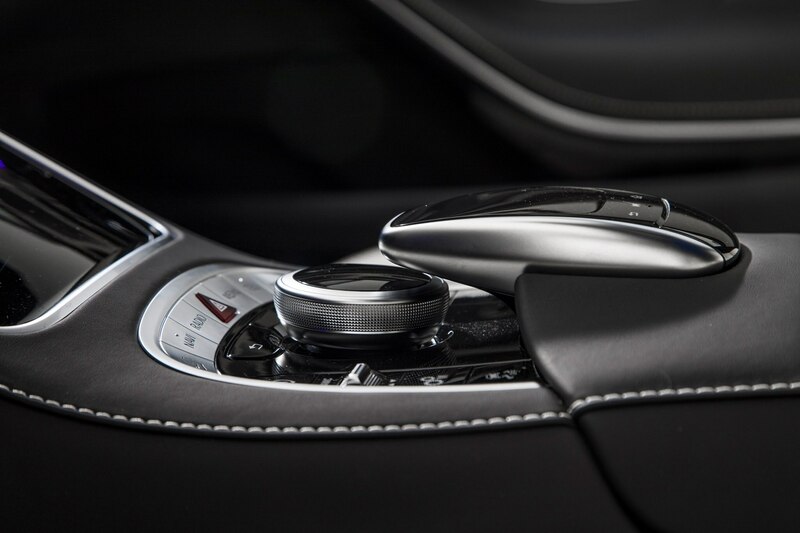 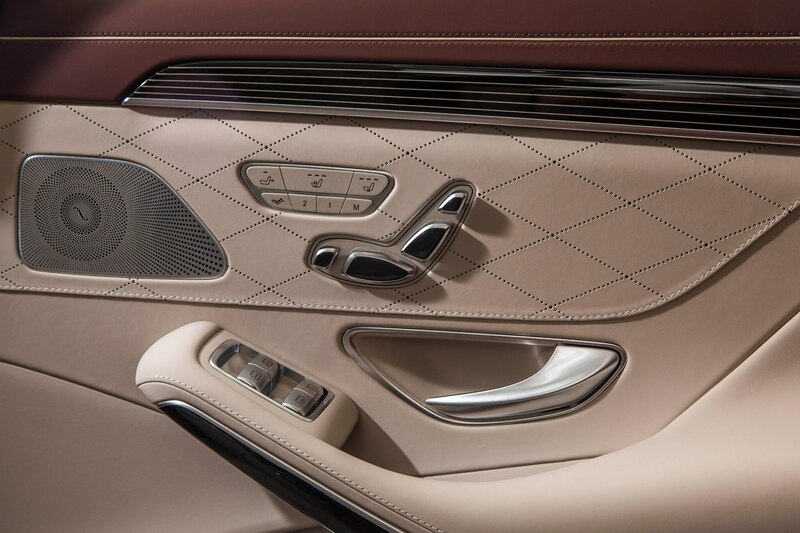 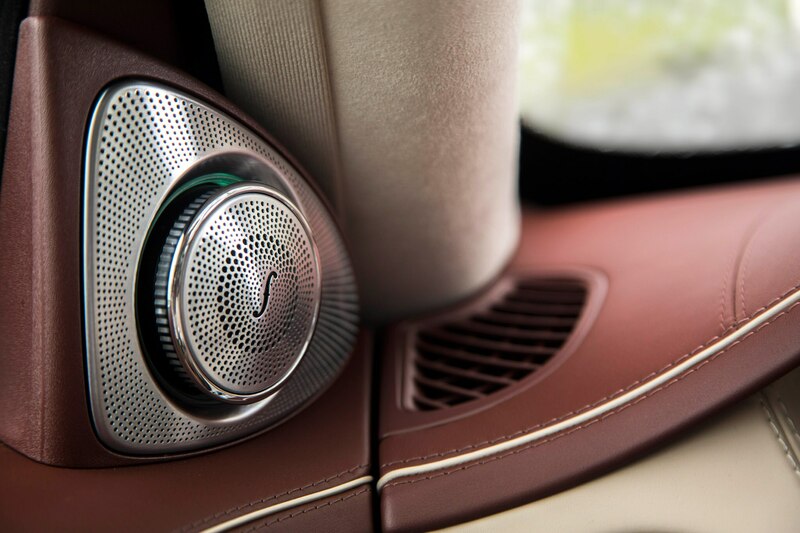 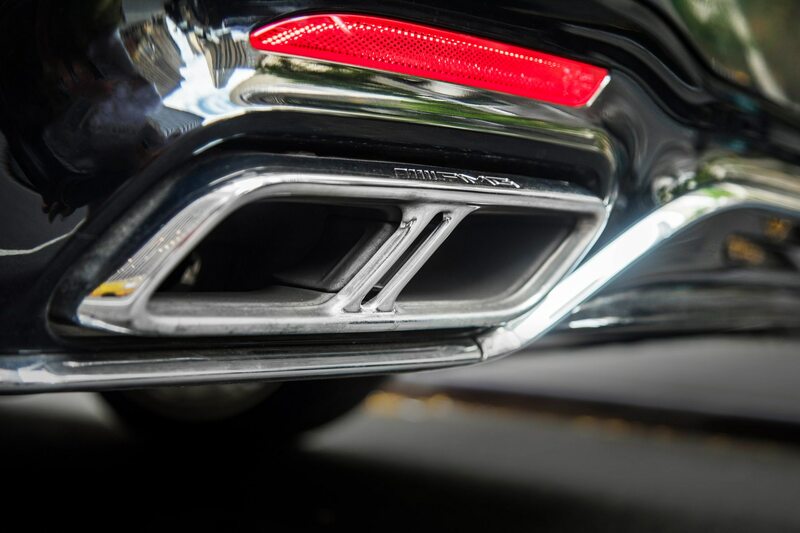 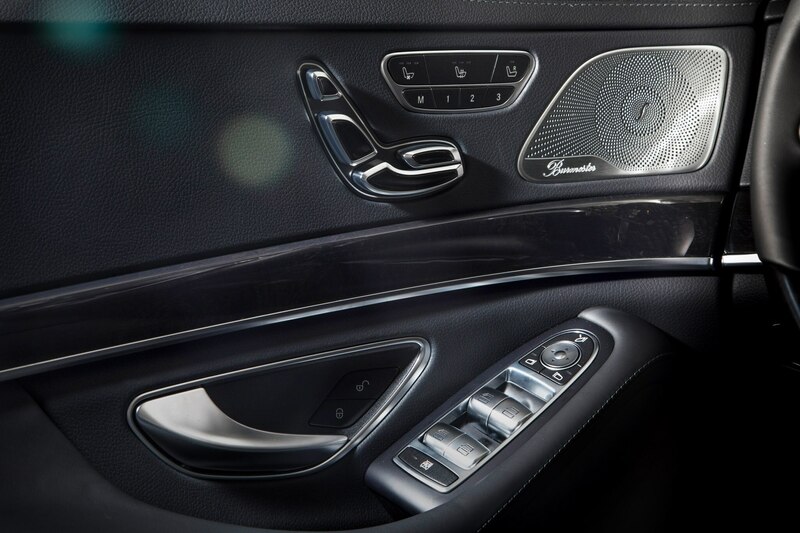 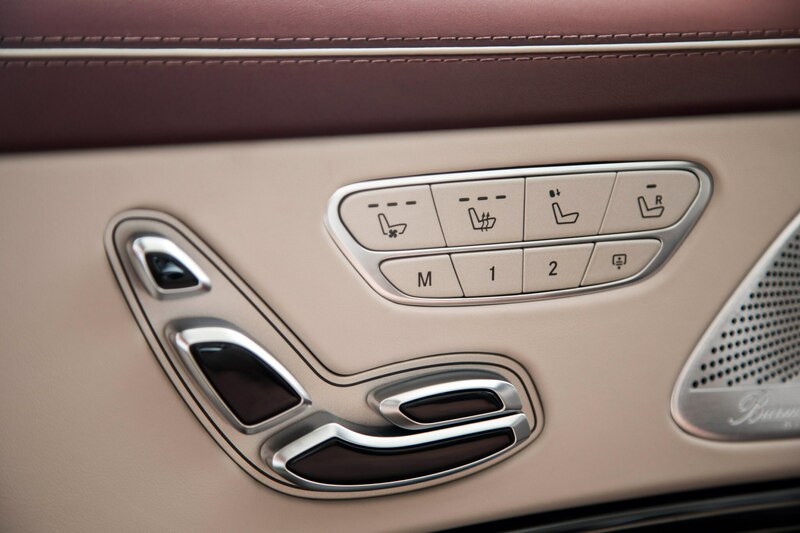 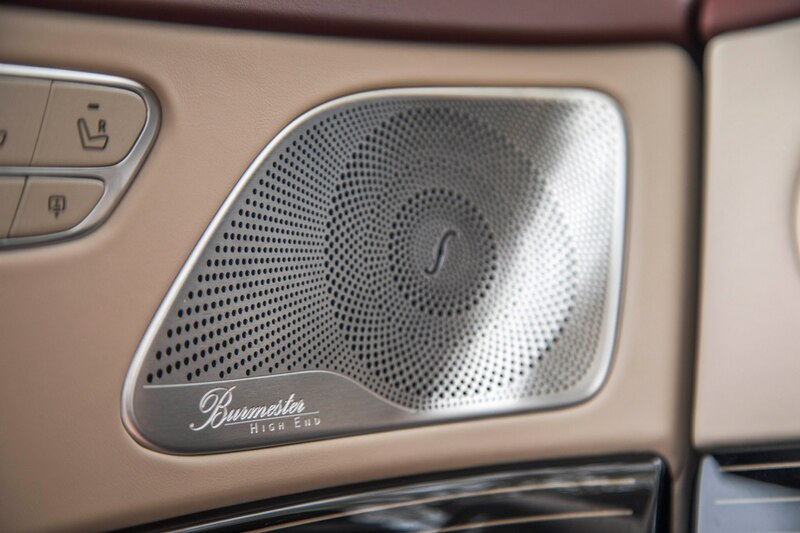 The Burmester 3D Surround System alone adds an additional $6,400, but it’s worth it for sound fans. 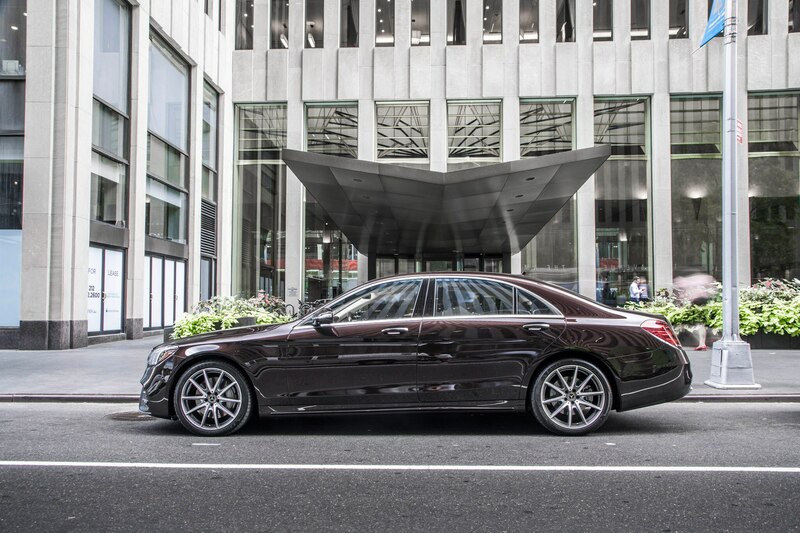 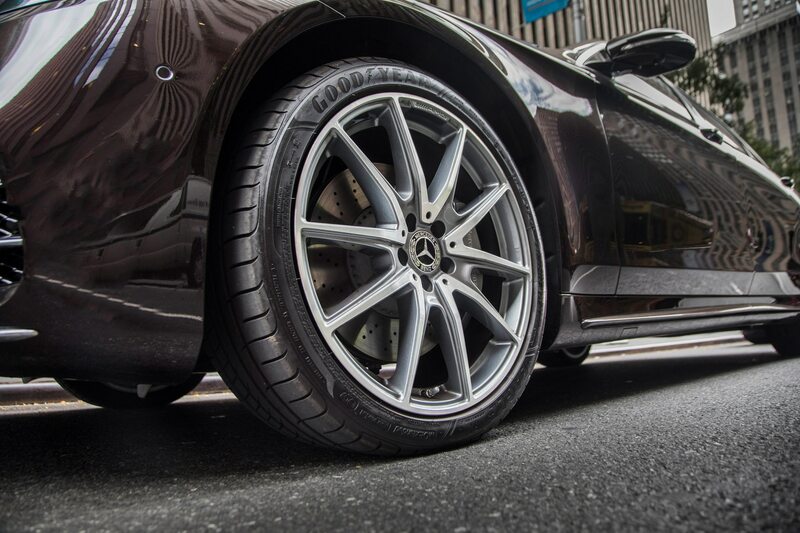 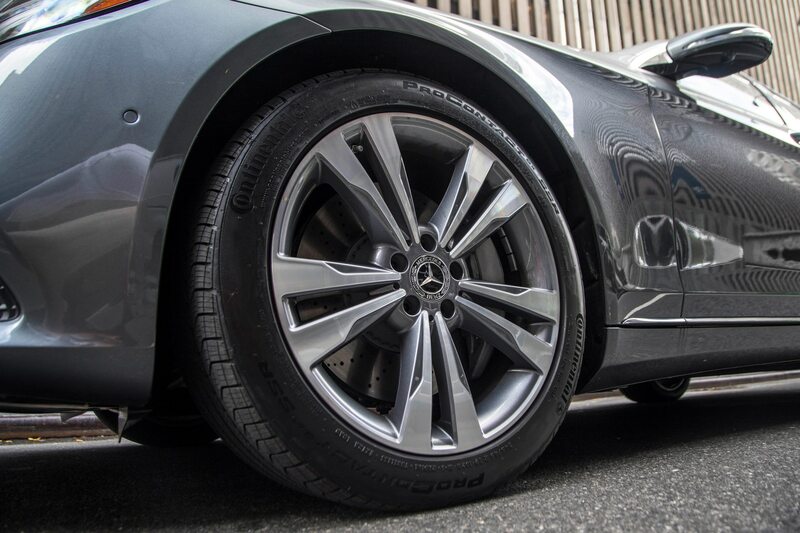 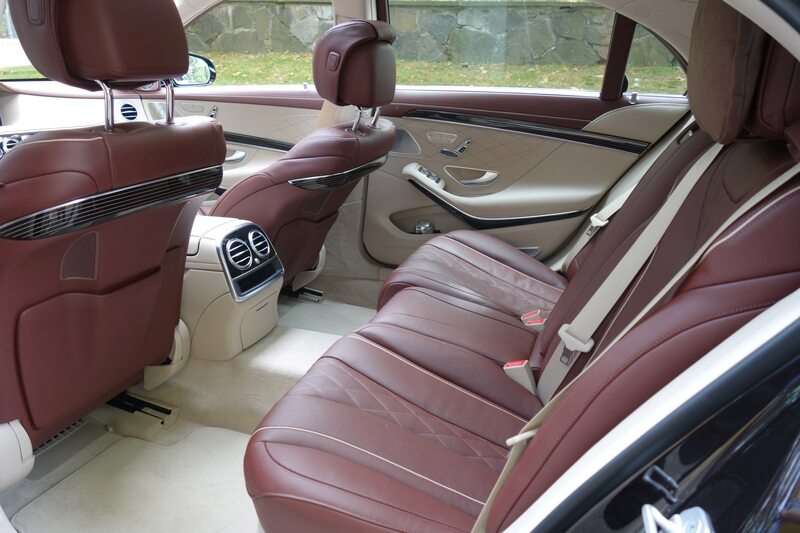 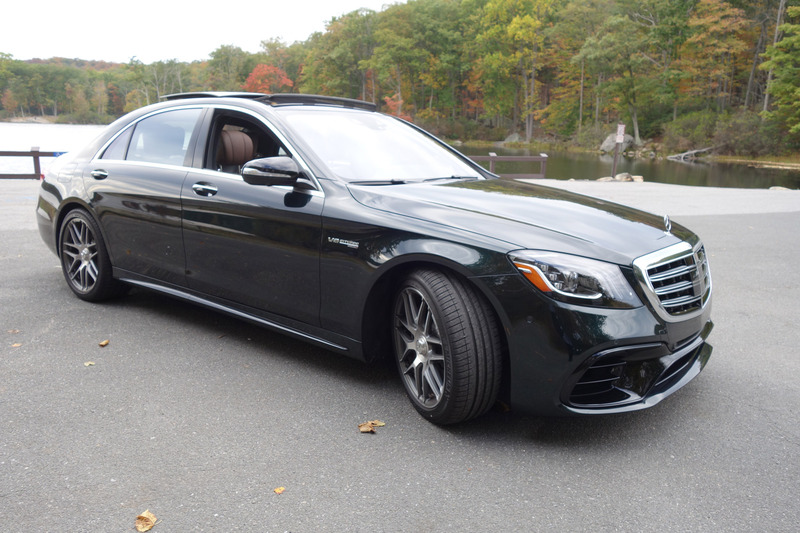 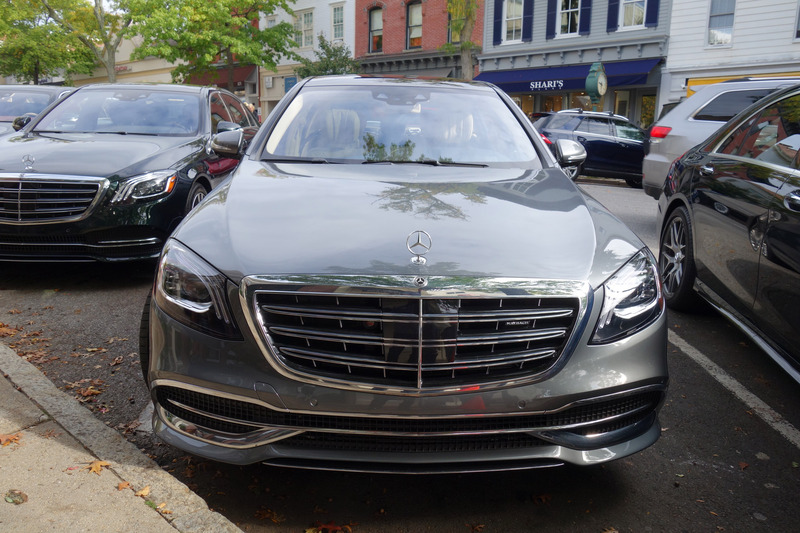 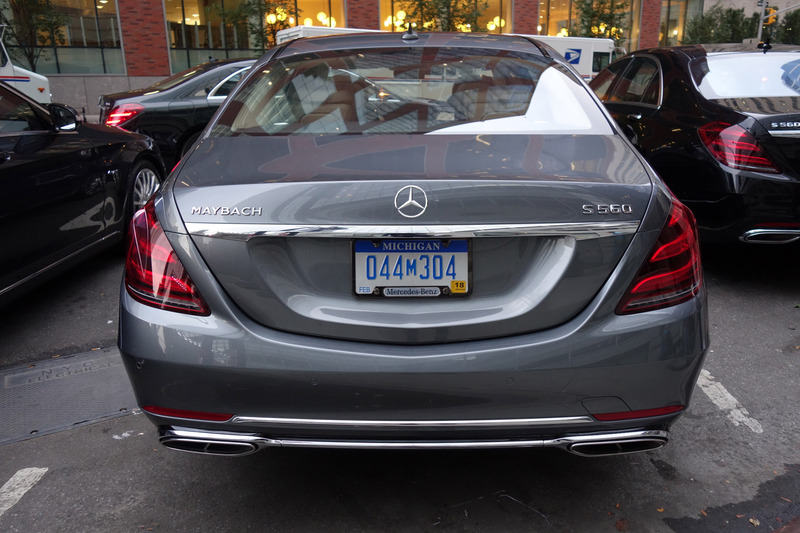 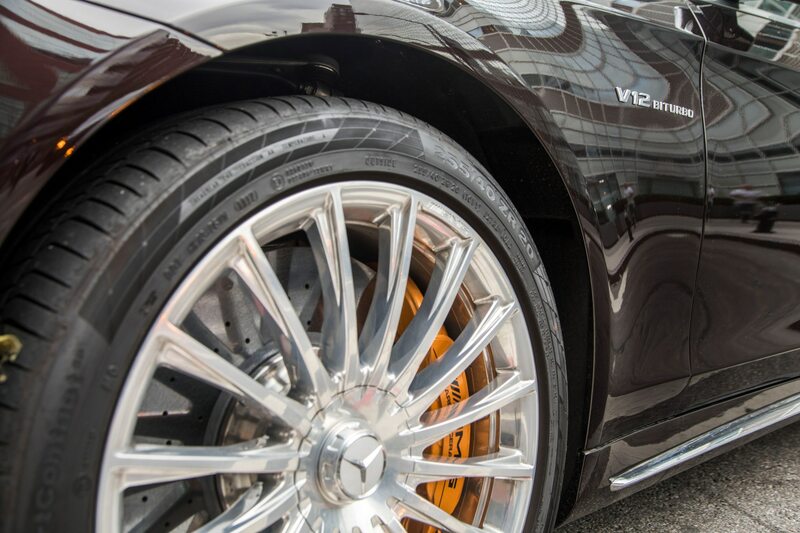 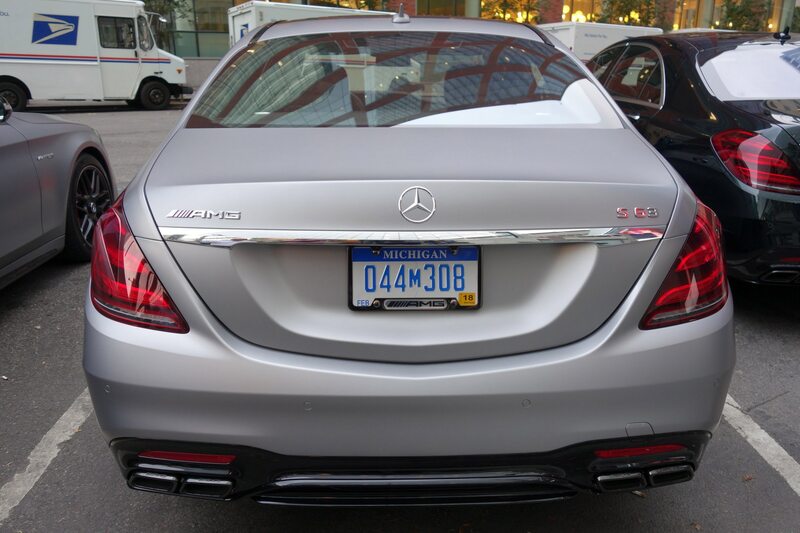 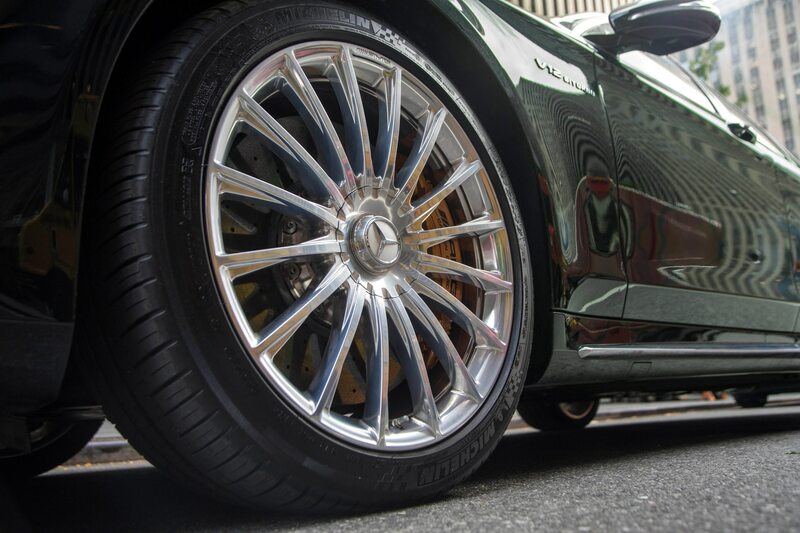 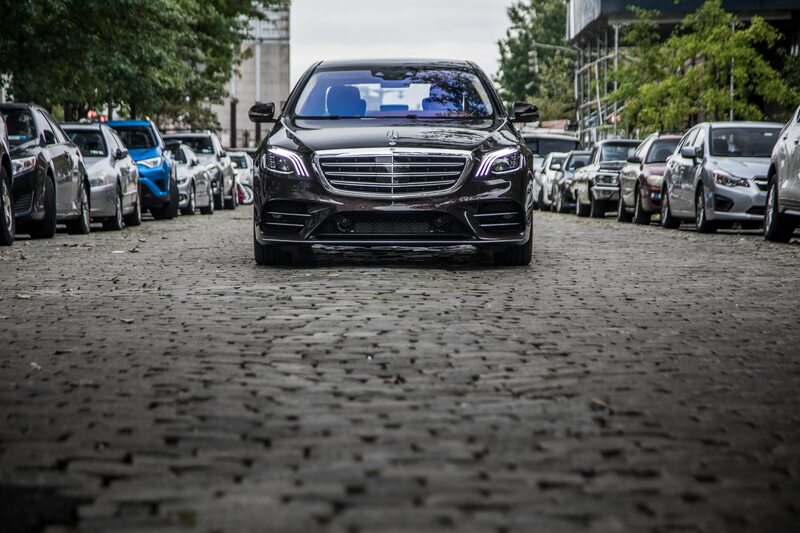 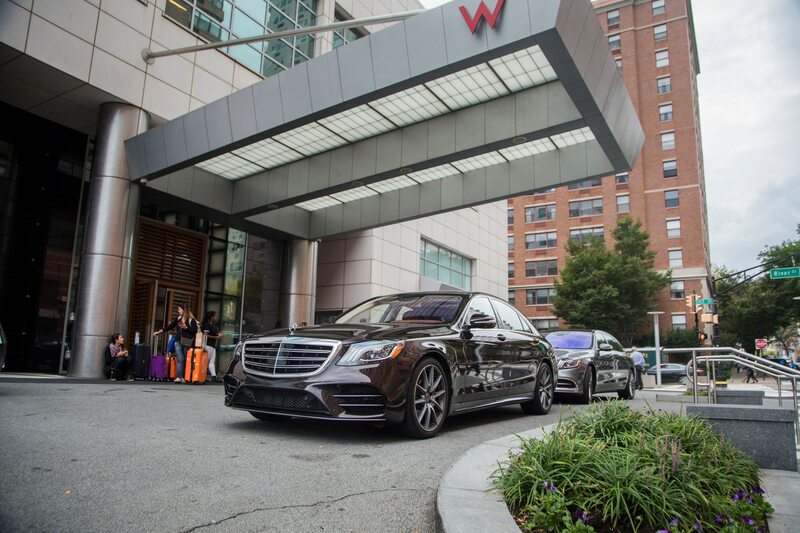 Like the S65, it also rolls on 20-inch wheels, which took us from Bear Mountain to the New York Thruway into the Palisades Interstate Parkway, and eventually to our last pit stop in Hoboken. 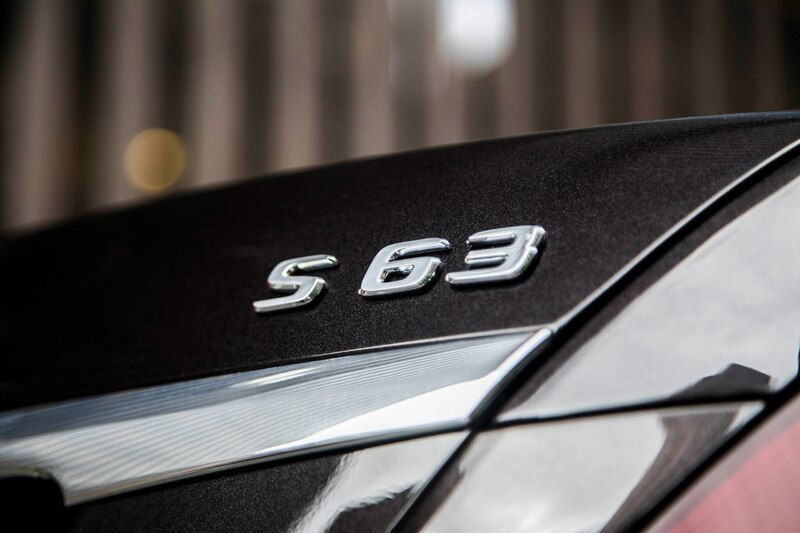 While the S63 is a fun and fast four-door, it’s really an aggressive ride that seems better matched to a slightly smaller coupe or E-Class model. 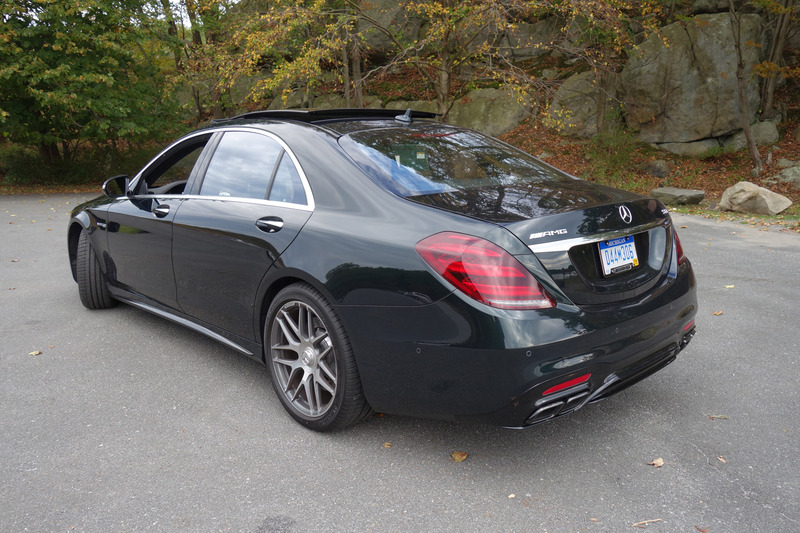 Still, compared to the S560 it feels a bit overproduced and not as refined as its sibling. 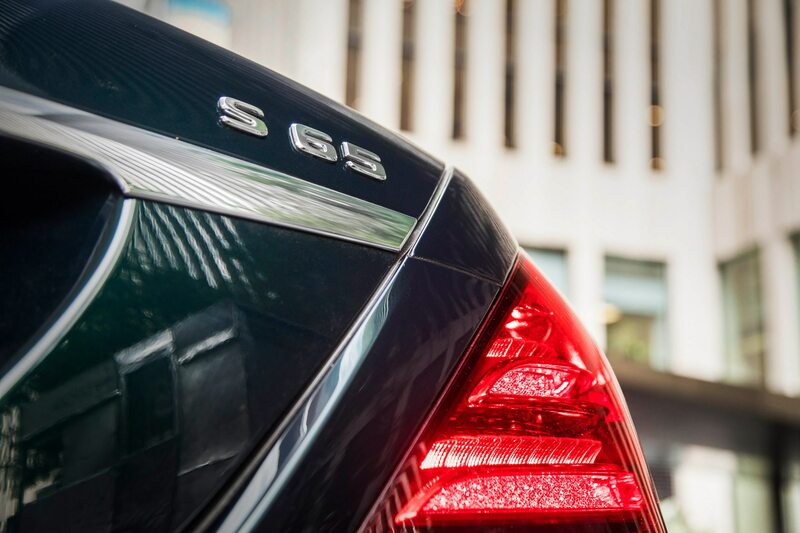 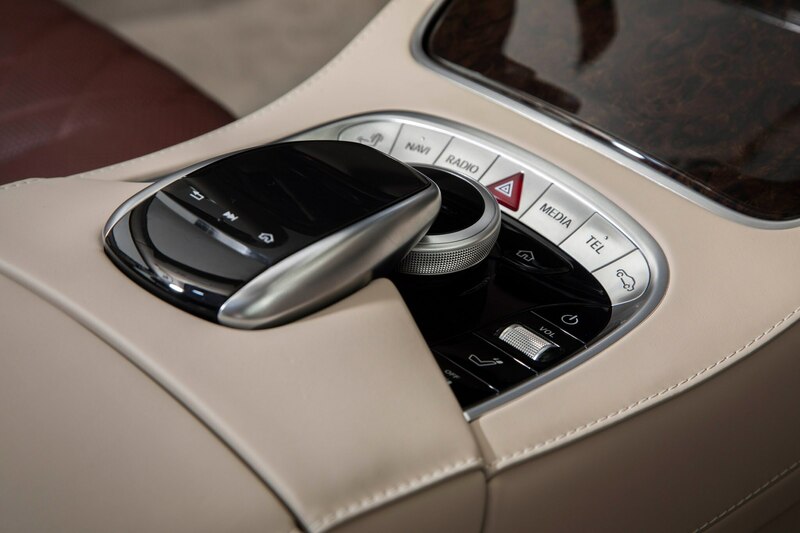 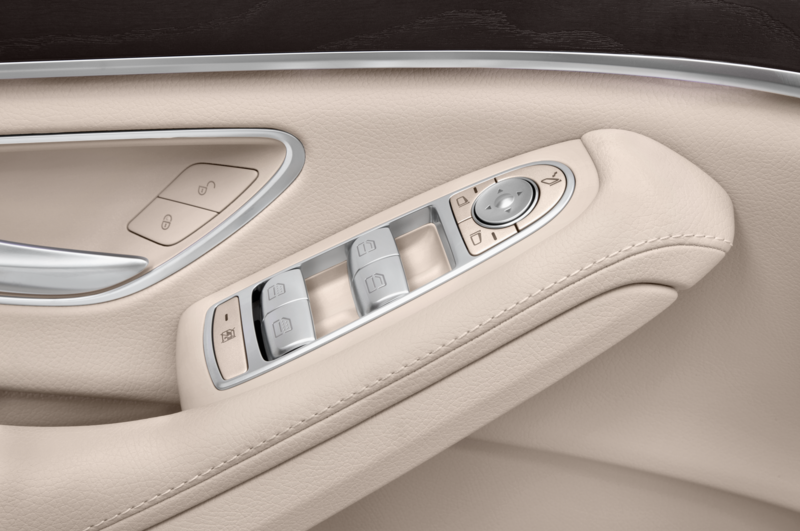 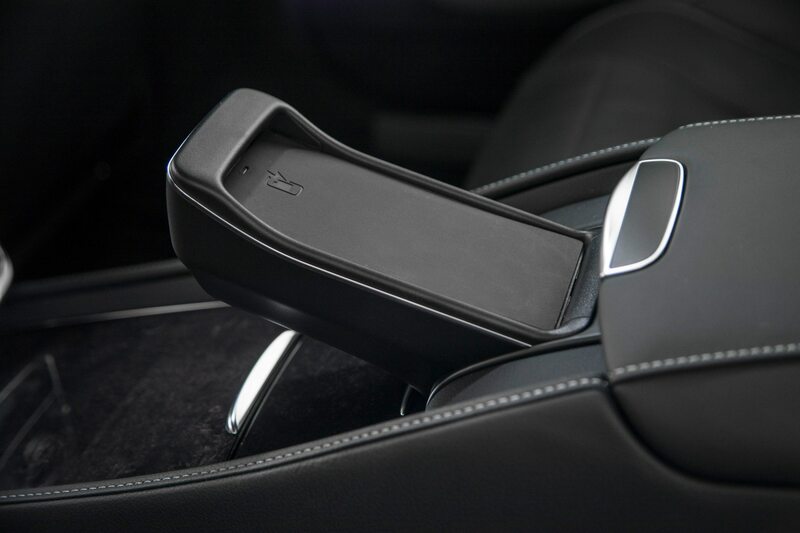 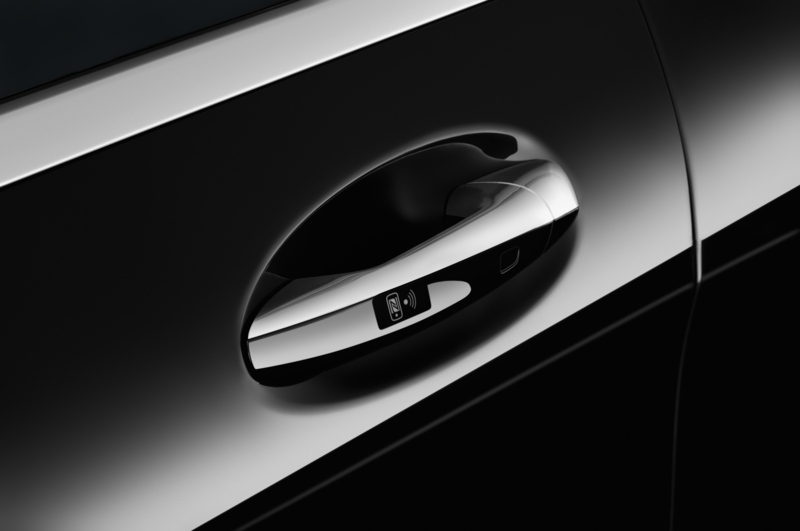 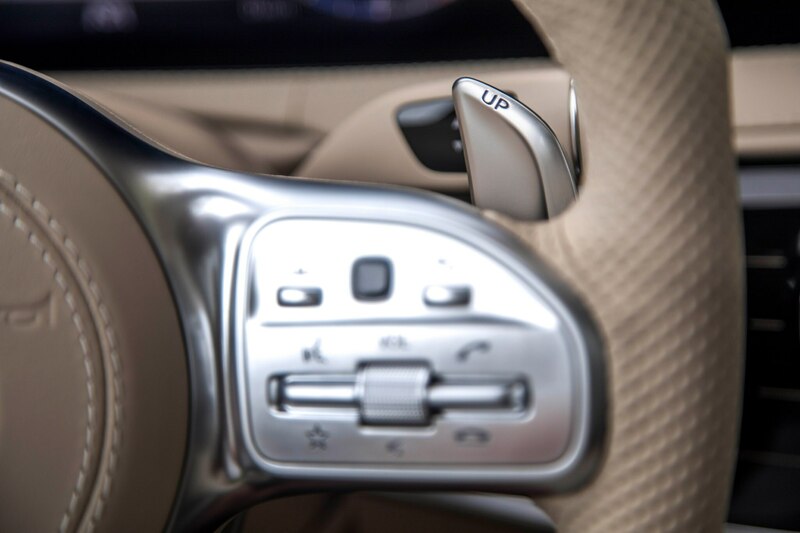 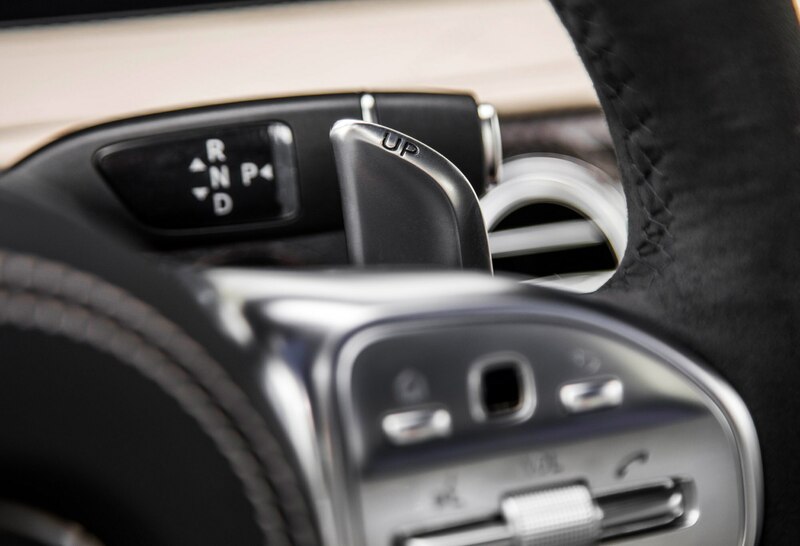 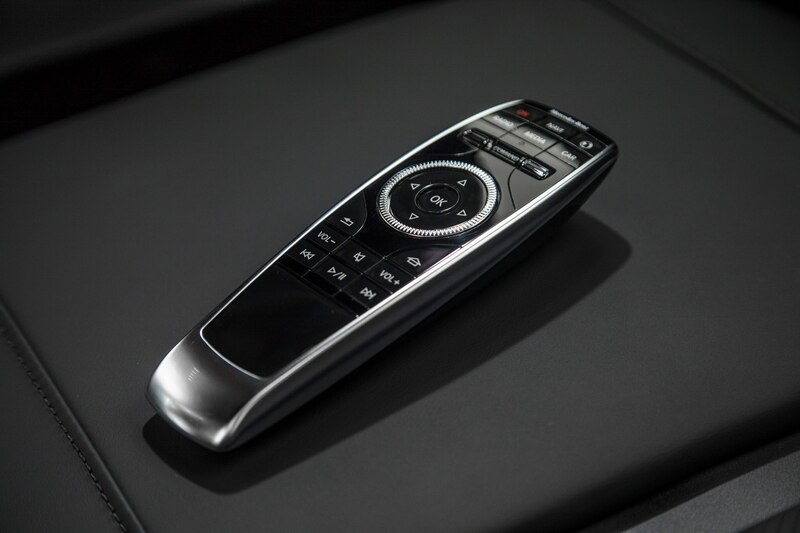 It’s a more engaging drive than the S65, but if you are looking for the most refined S-Class, you can give us the key fob for the S560 any day.